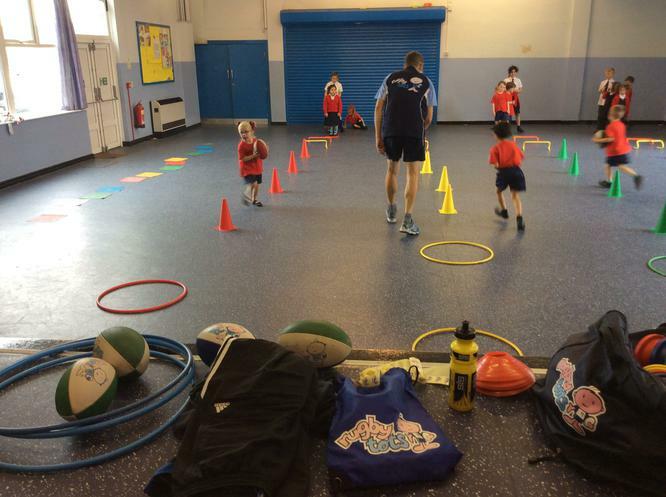 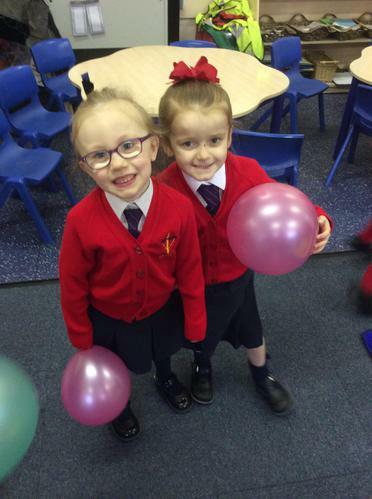 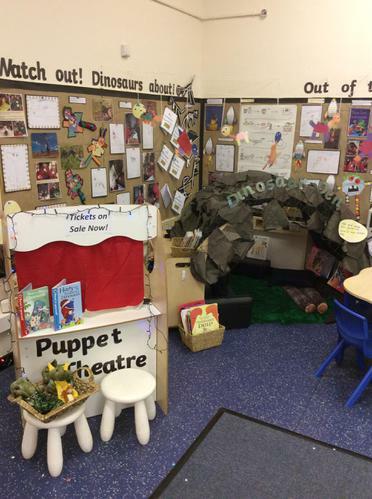 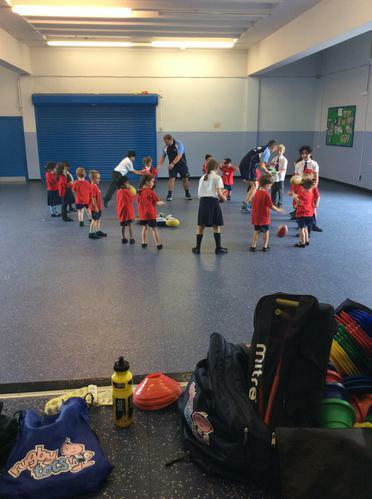 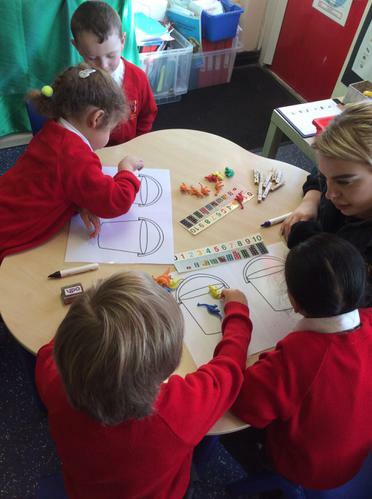 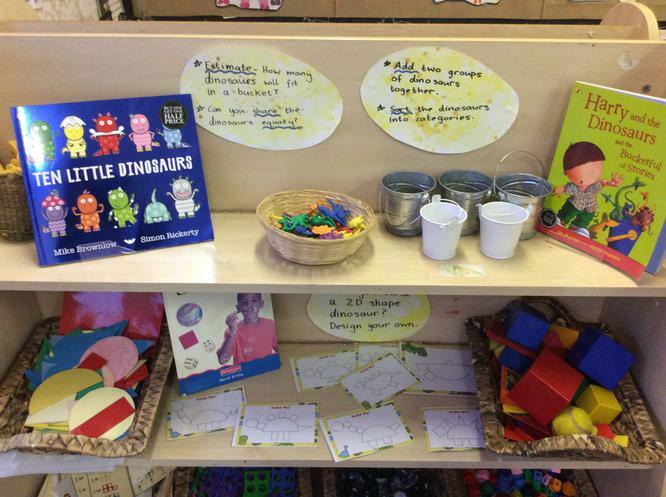 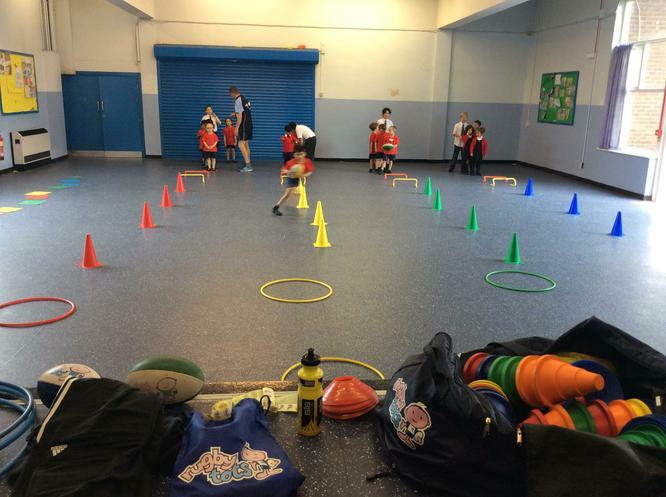 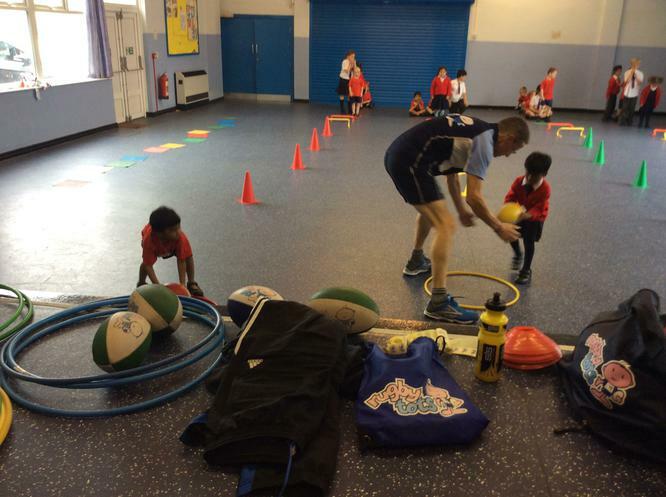 Miss Mitchell and Miss Brennan are looking forward to working together with you for the rest of the year and getting to know your child, their interests and all of the things they can do. 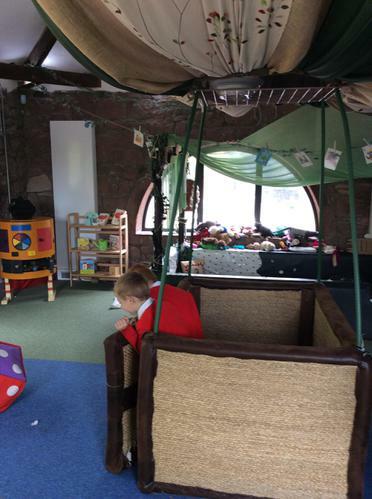 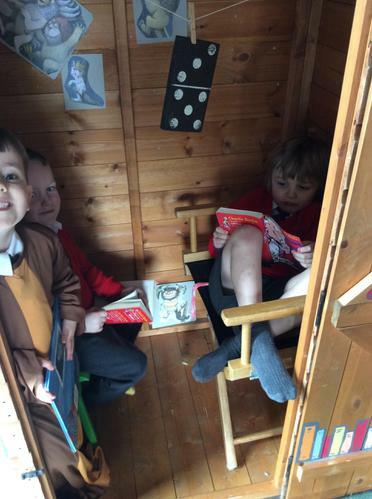 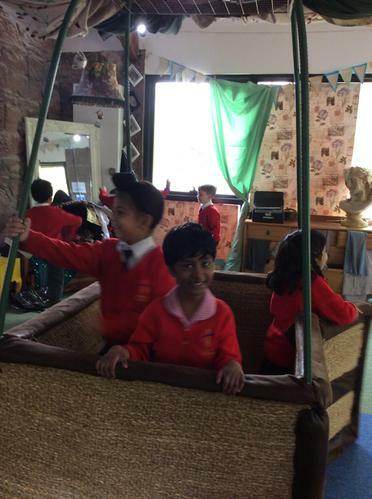 Our trip to the Storybarn at Calderstones Park. 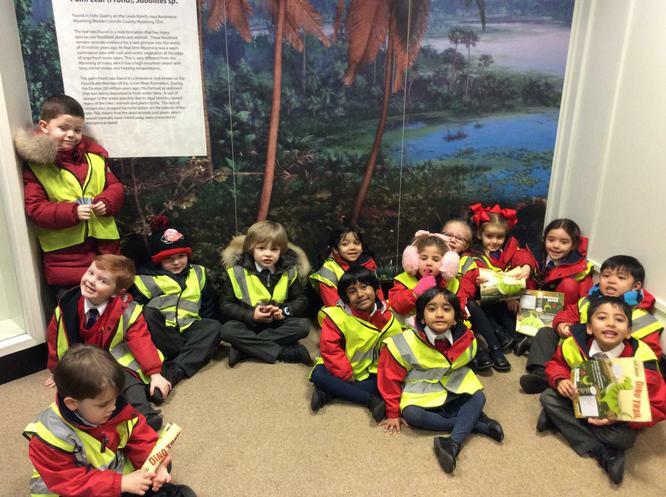 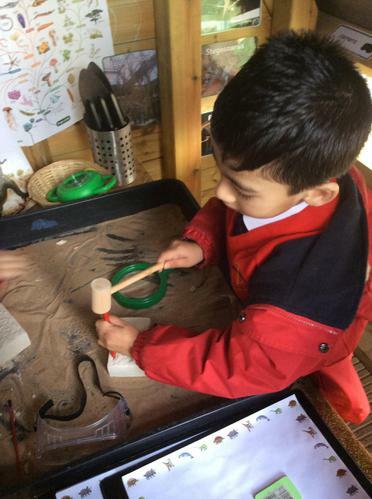 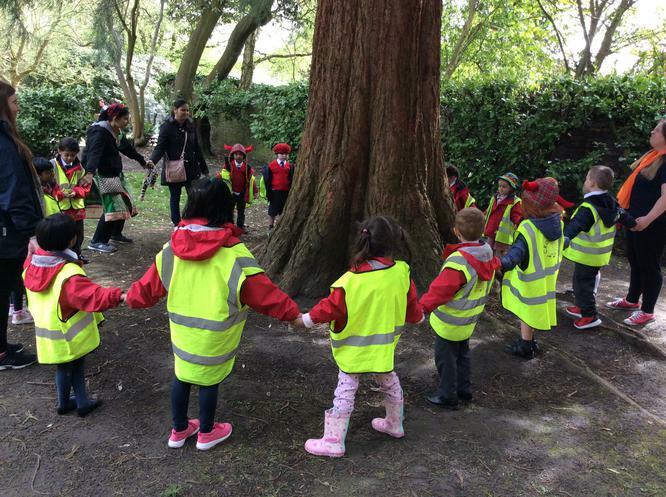 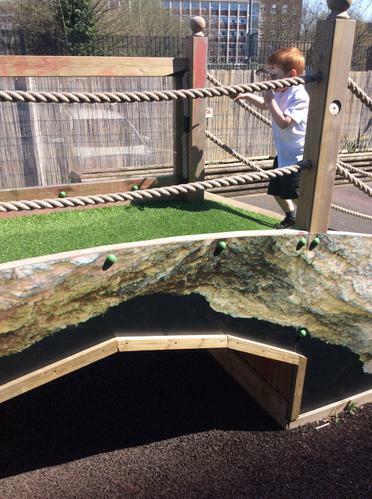 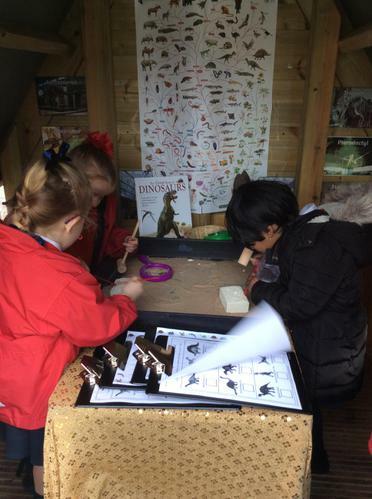 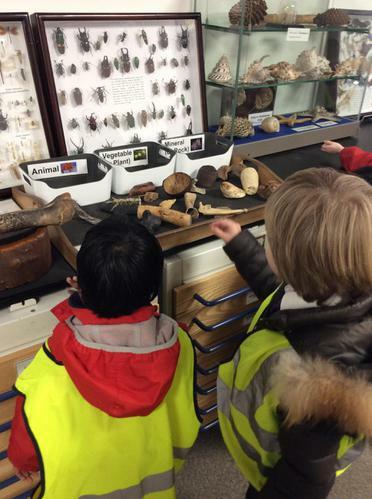 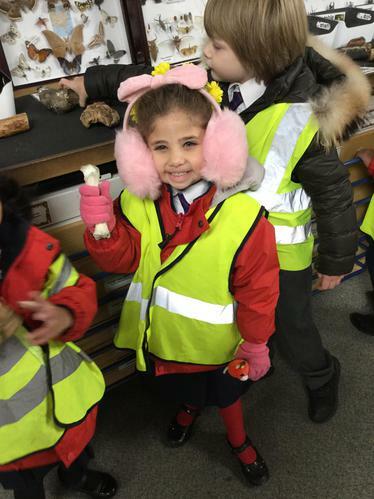 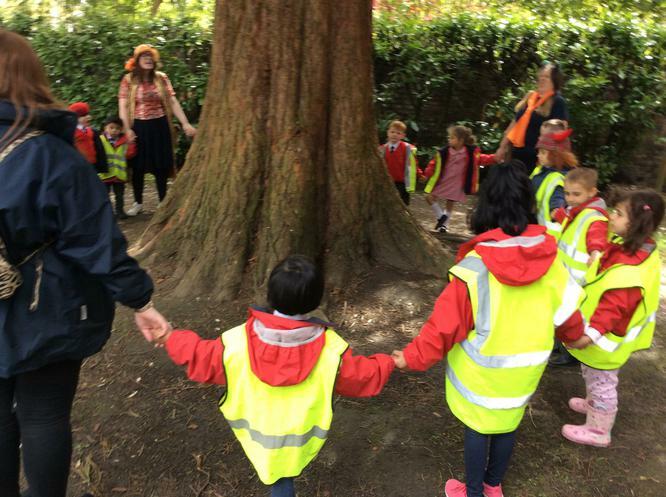 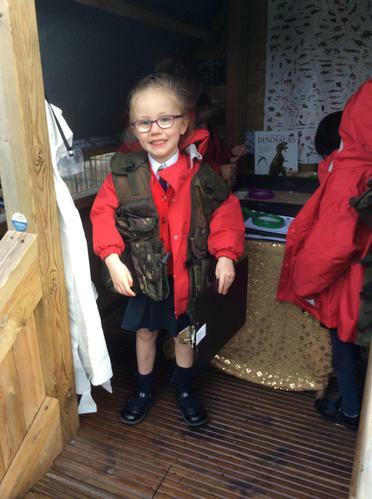 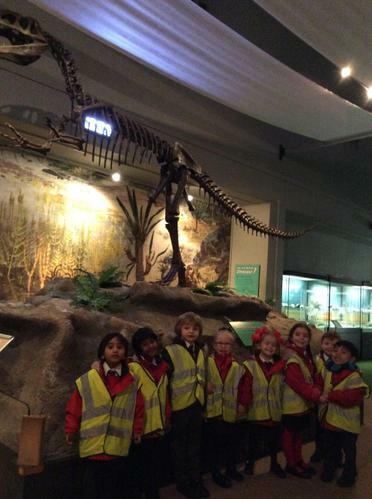 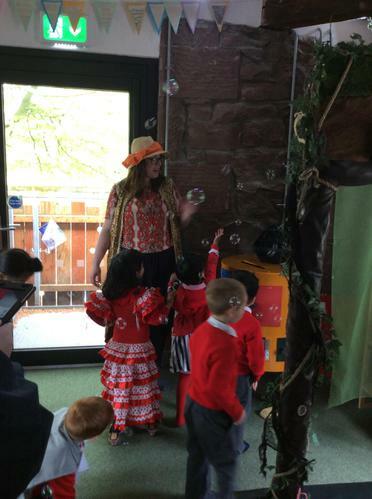 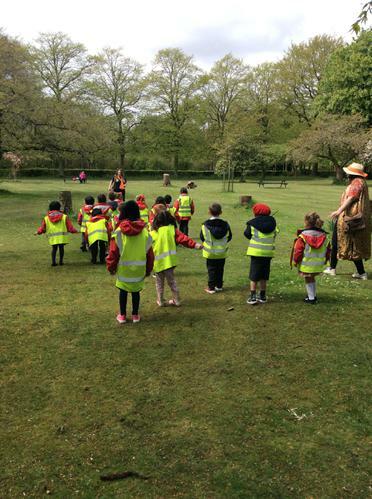 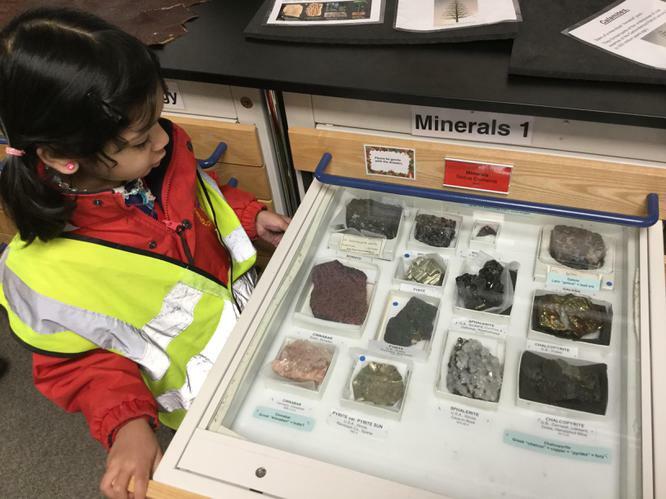 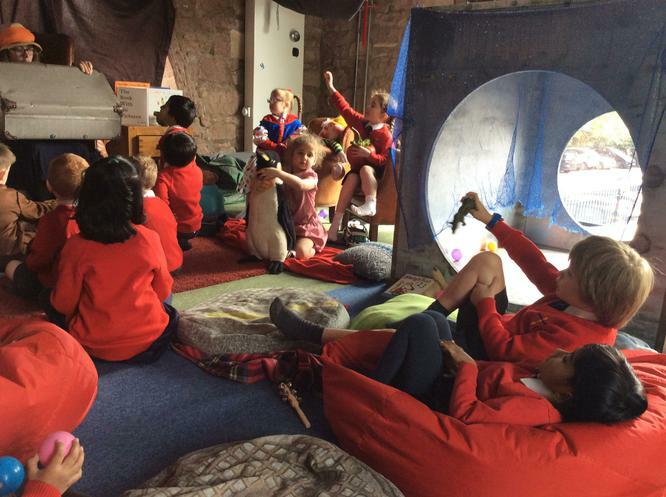 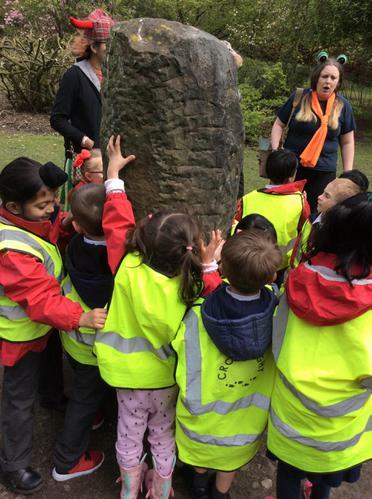 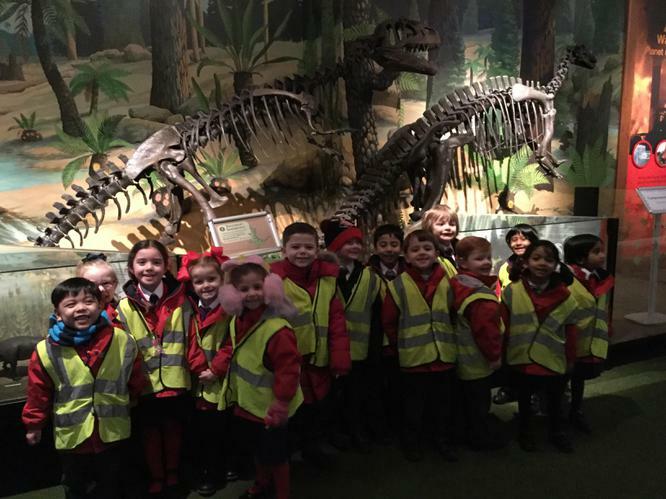 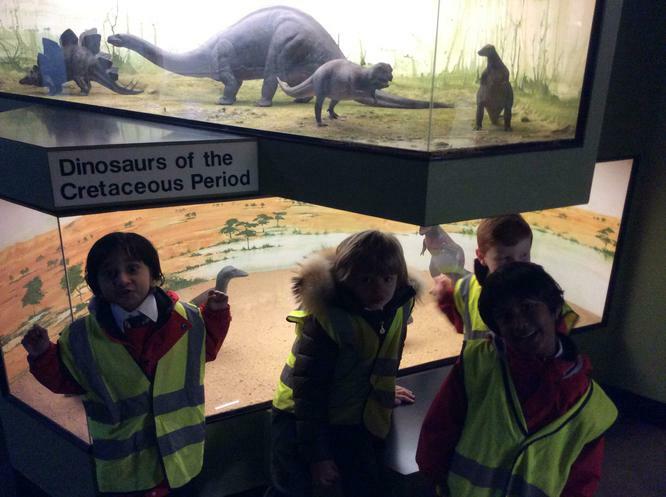 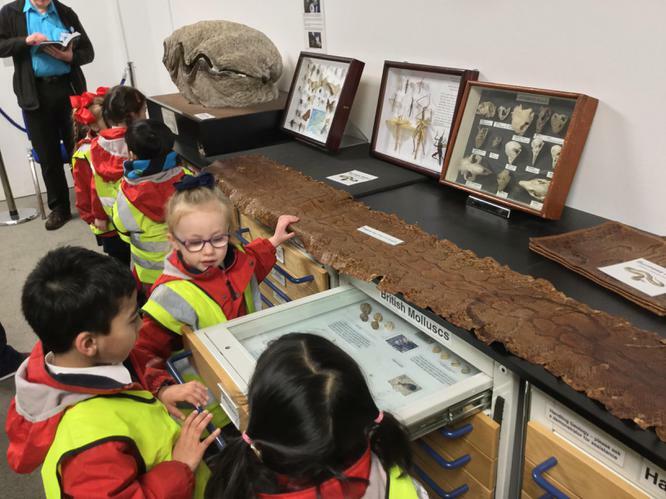 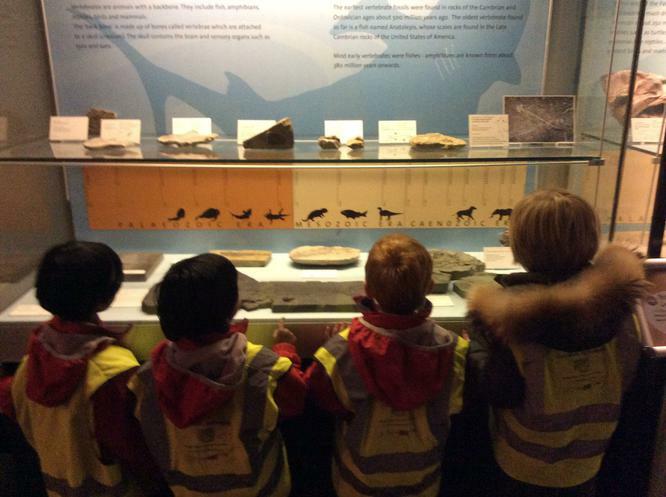 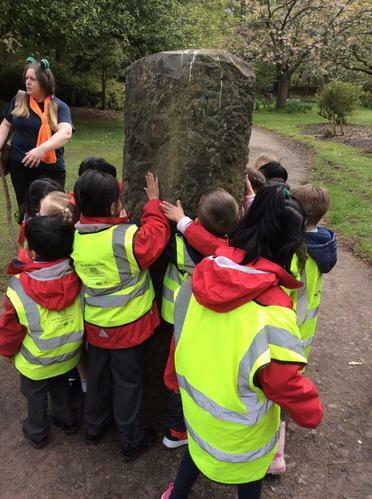 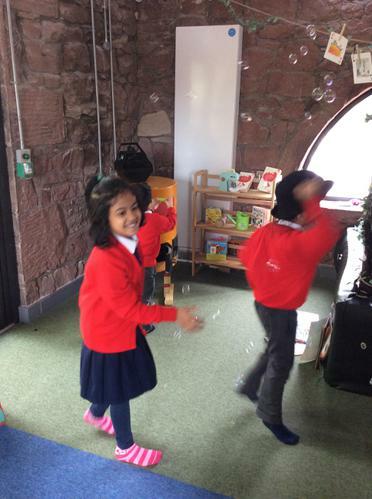 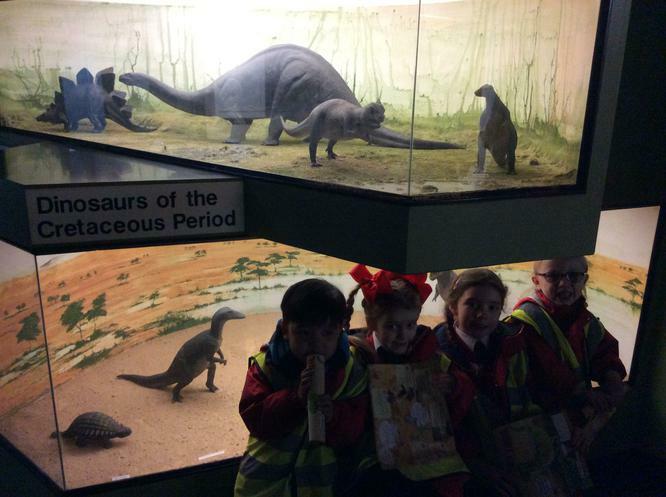 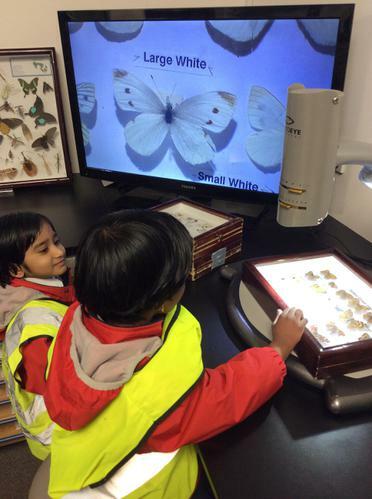 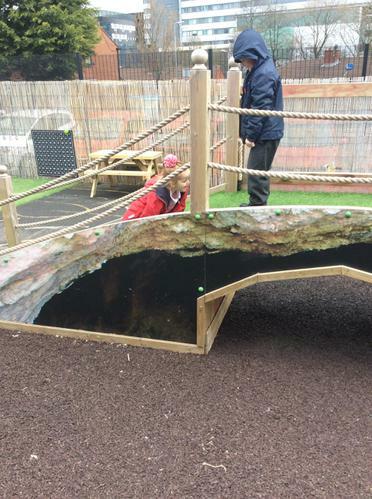 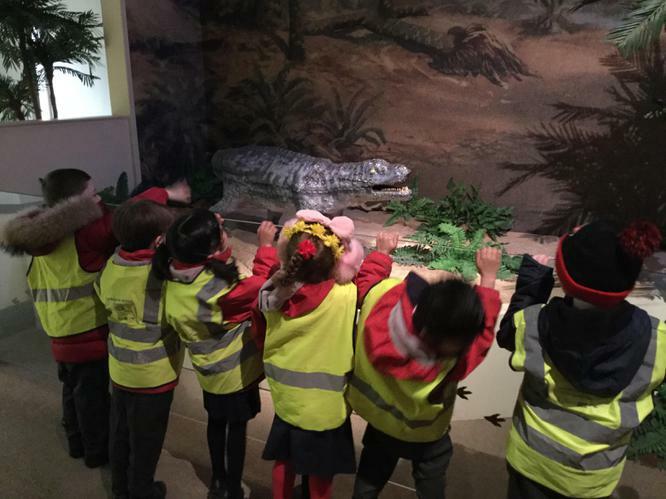 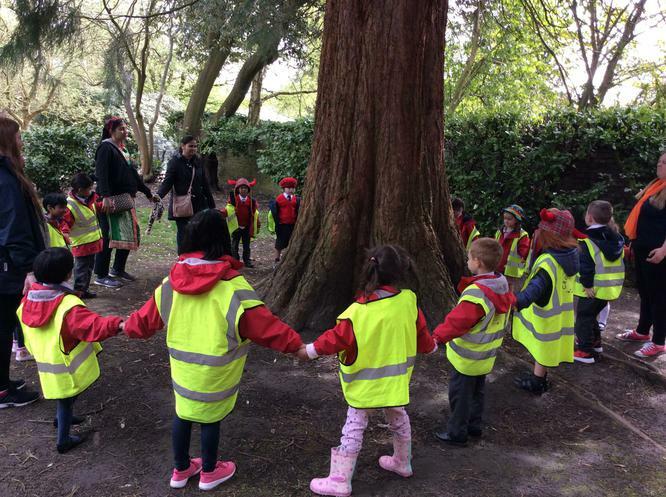 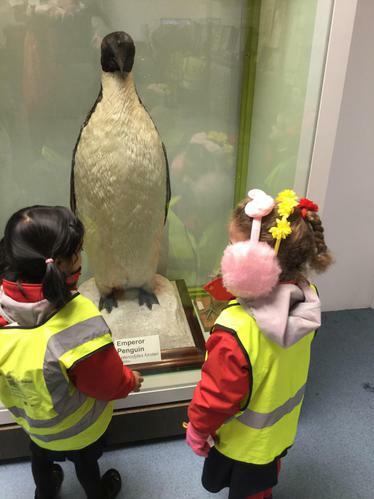 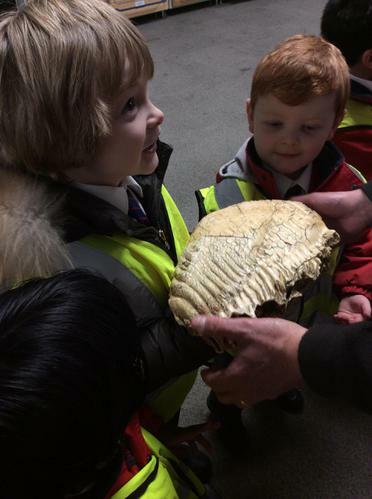 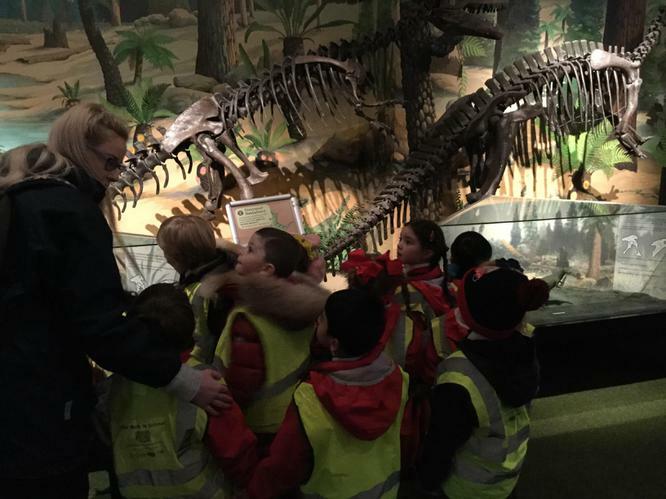 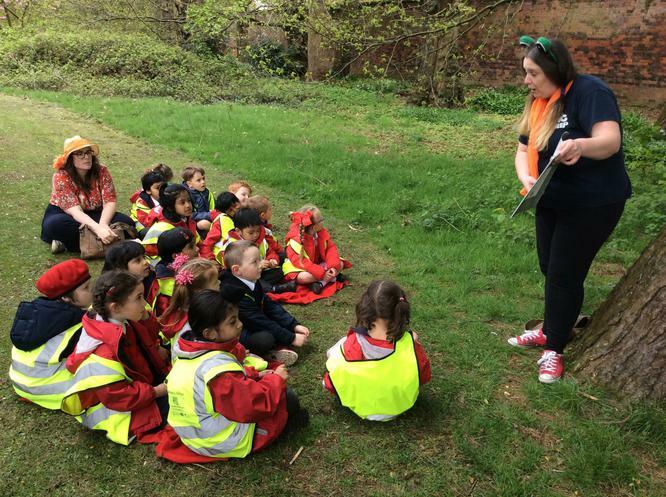 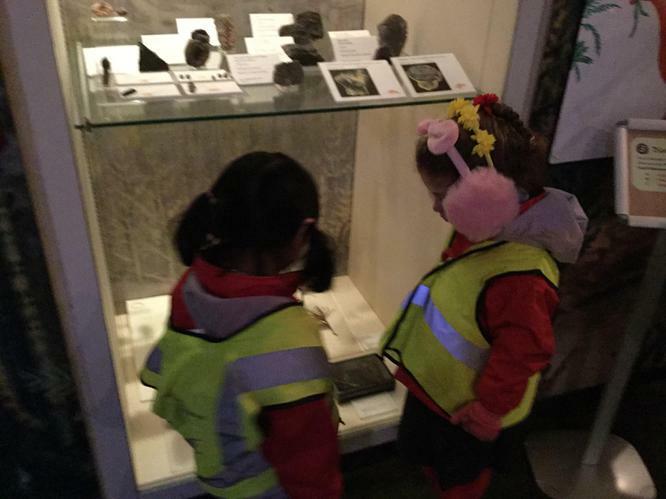 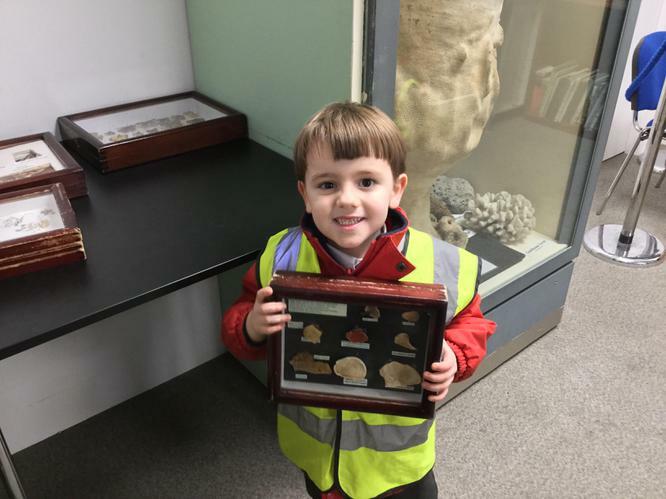 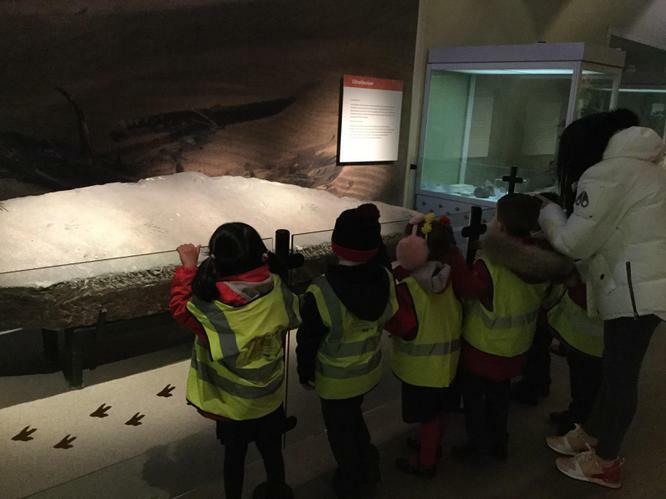 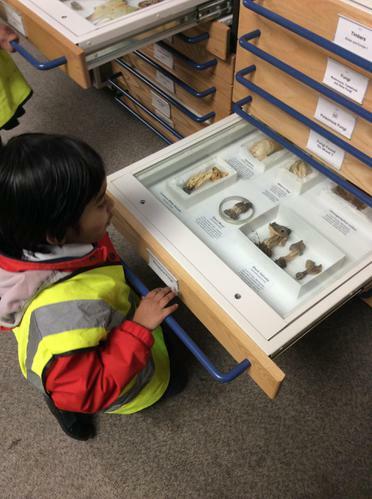 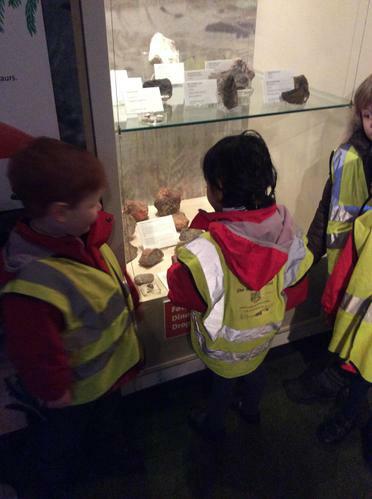 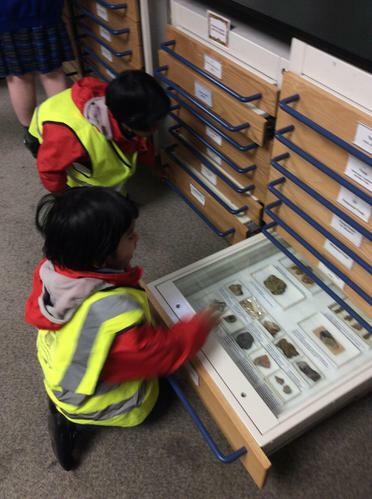 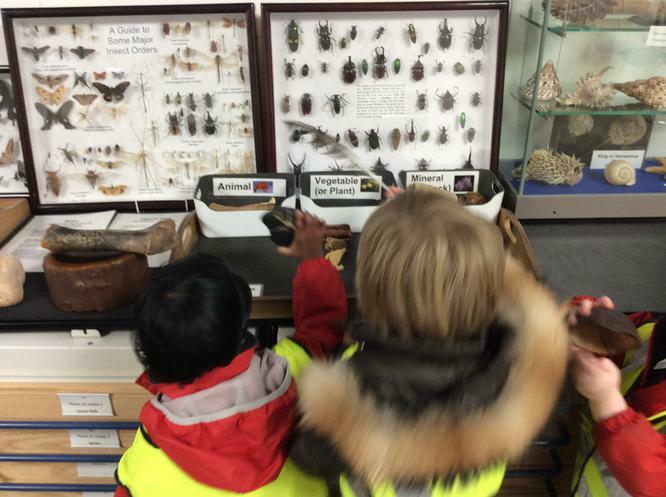 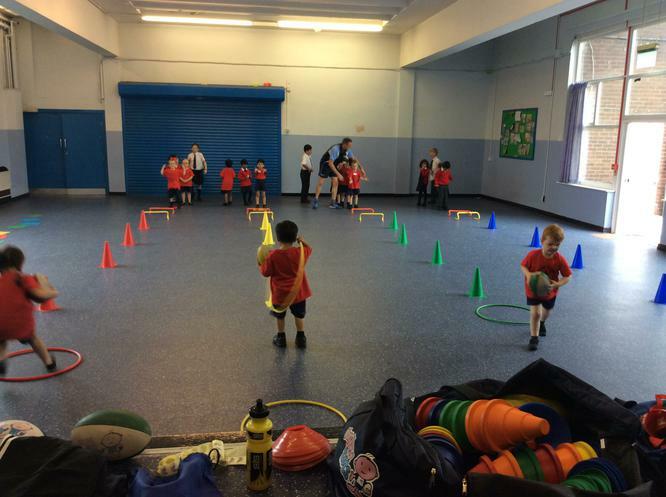 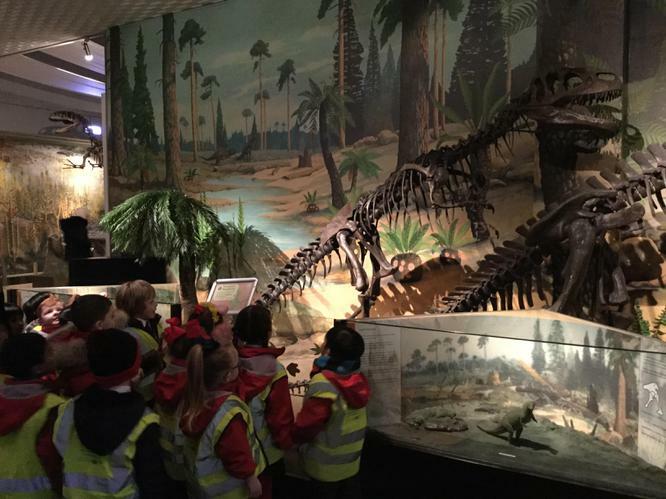 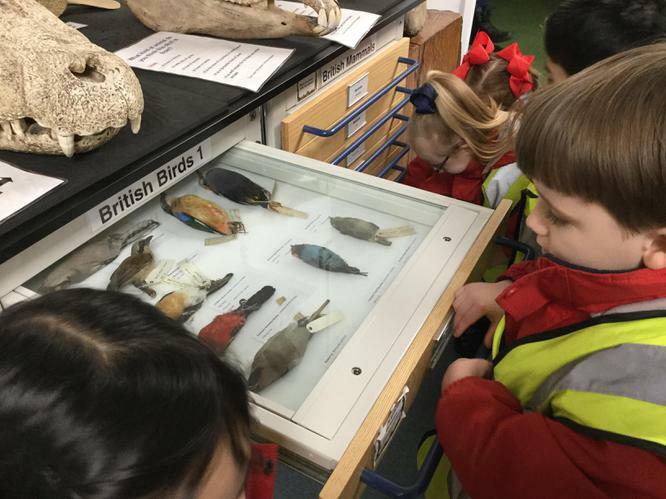 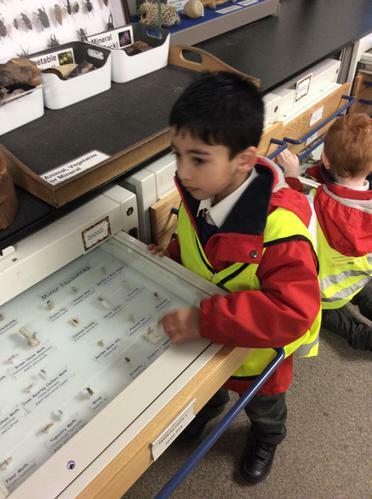 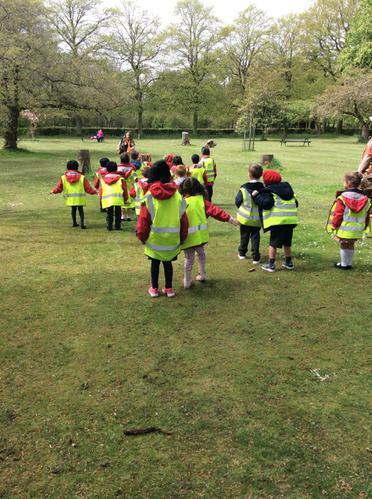 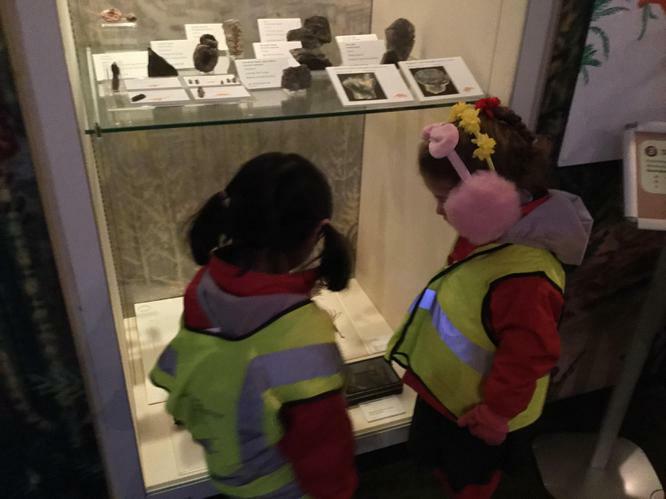 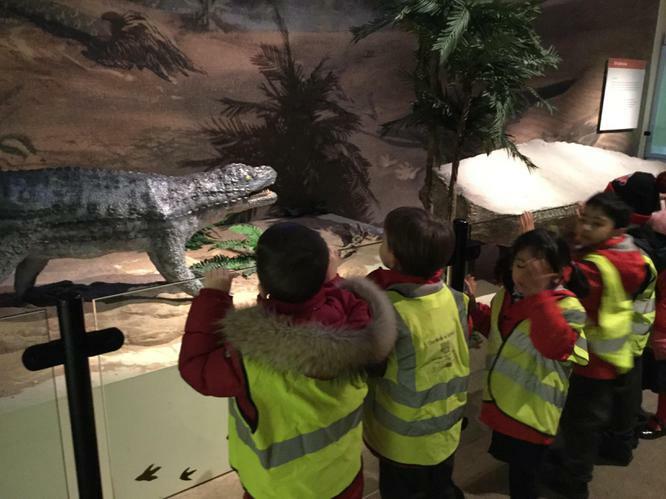 Reception had an amazing time at Calderstones Park. 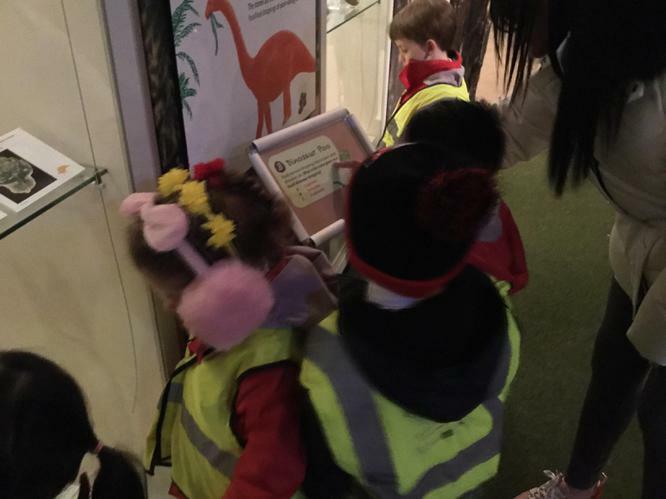 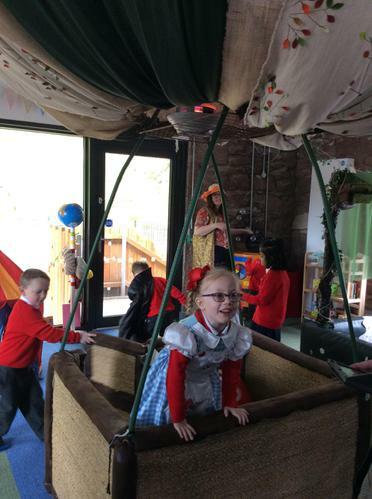 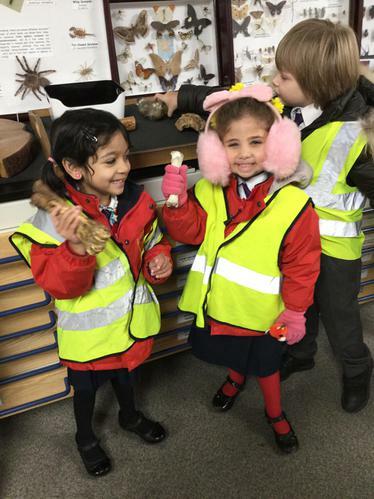 We began our day by exploring the Storybarn, where we read our favourite stories, dressed up, searched for fairy doors and investigated some mysterious objects. 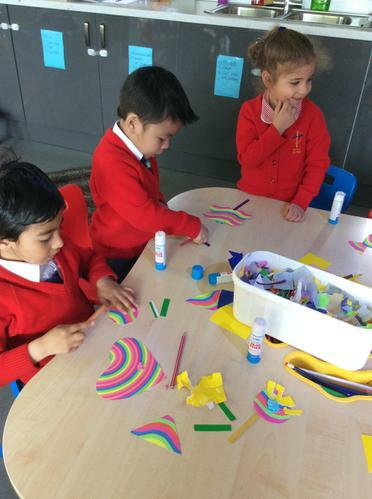 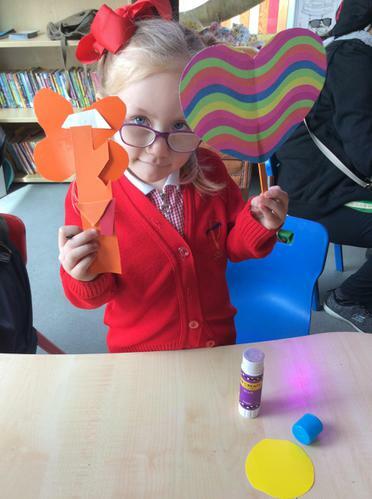 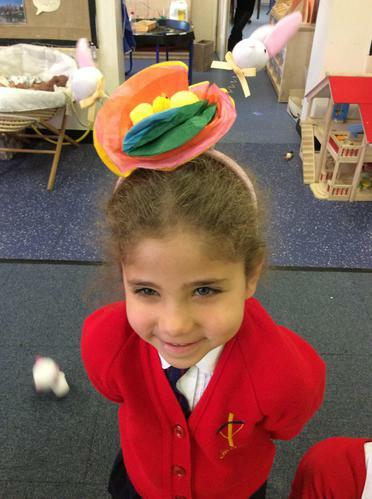 We then got creative by making our own flowers with different craft materials. 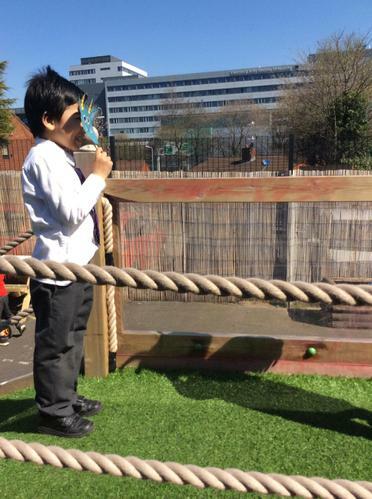 We enjoyed our picnic in the sun followed by a play in the Park. 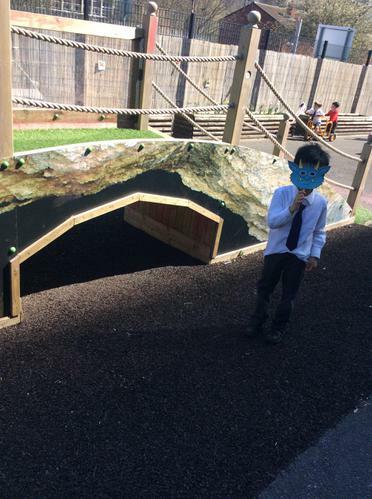 Finally, we went on a nature trail where we listened to stories and explored the beautiful Japanese sensory garden! 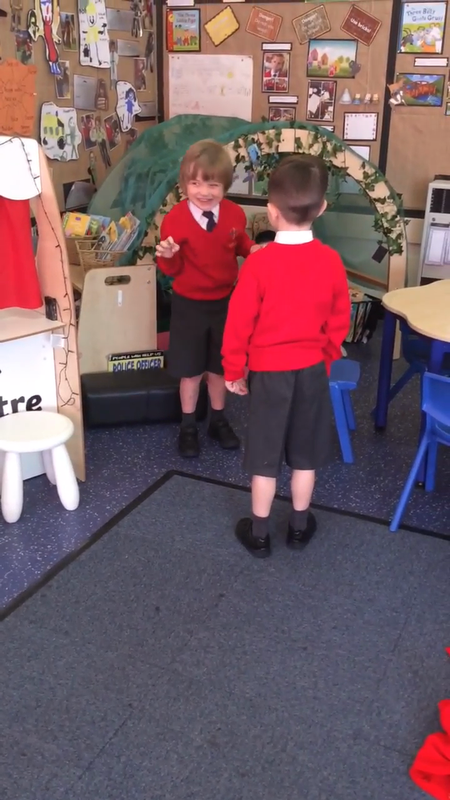 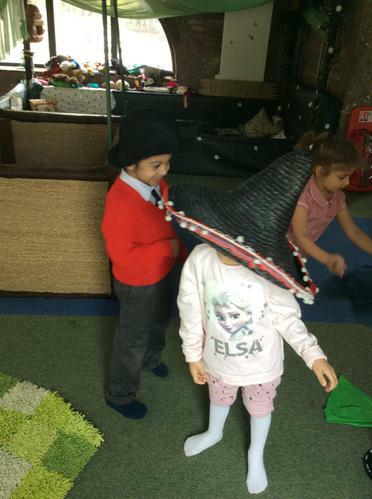 Role playing the Billy Goats Gruff. 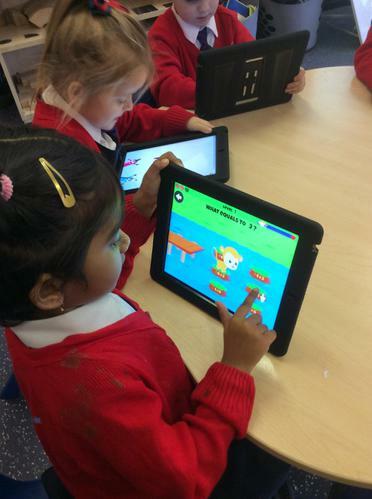 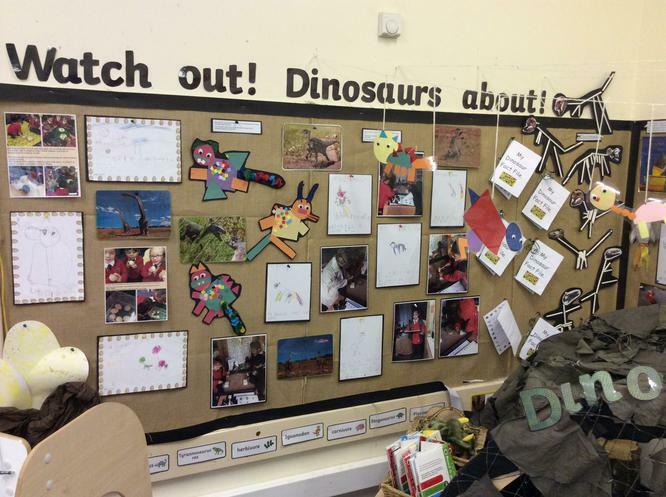 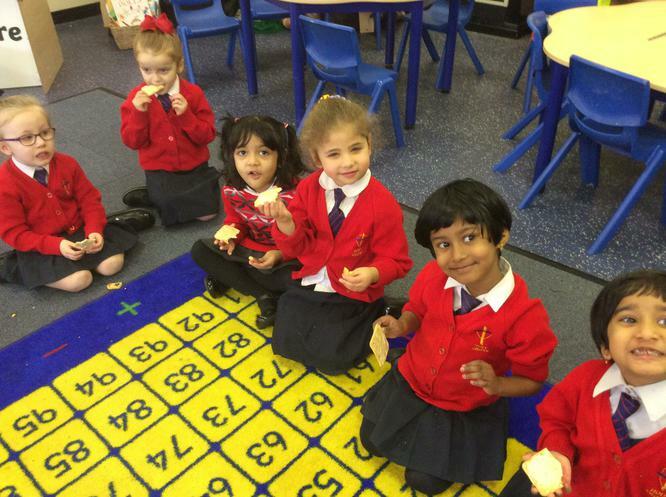 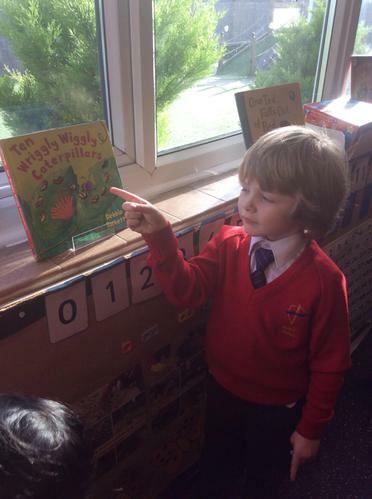 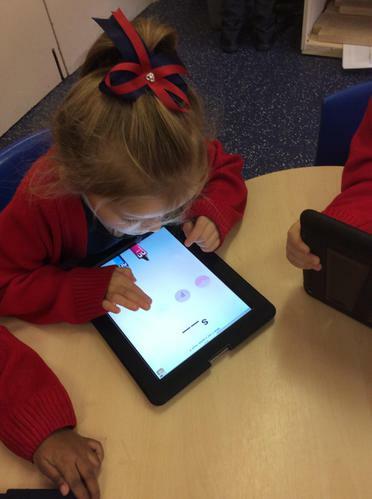 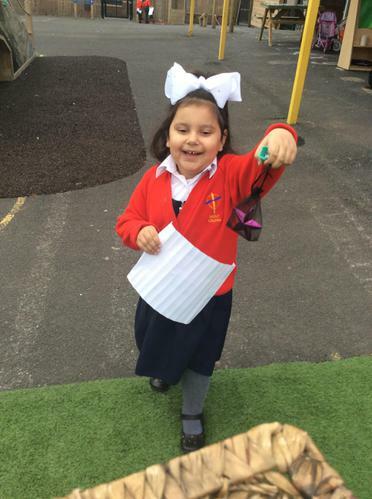 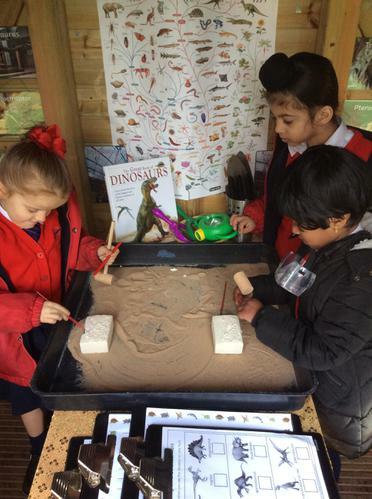 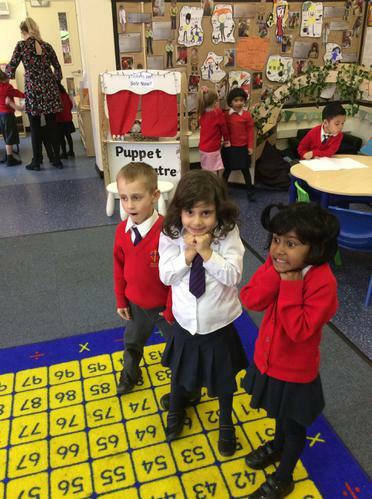 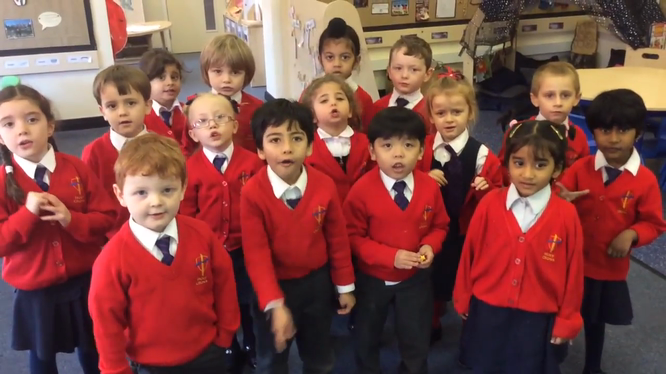 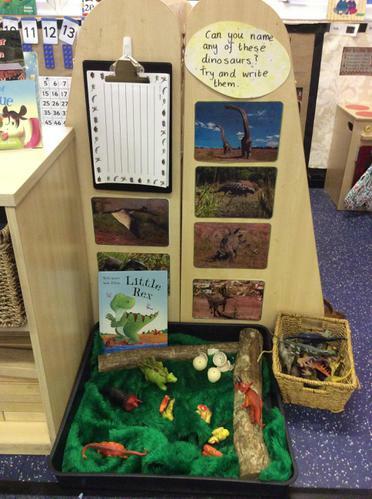 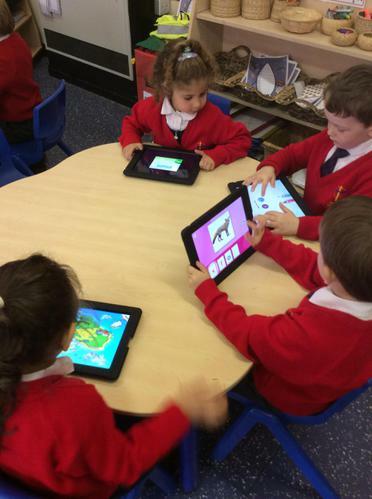 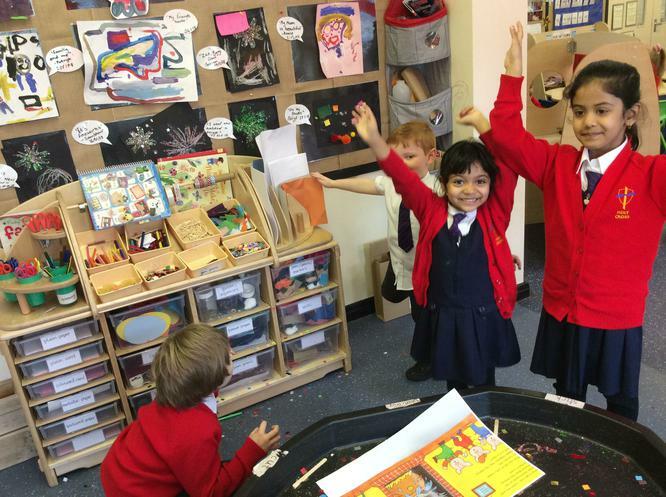 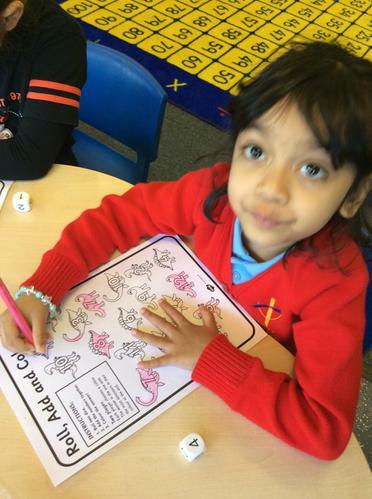 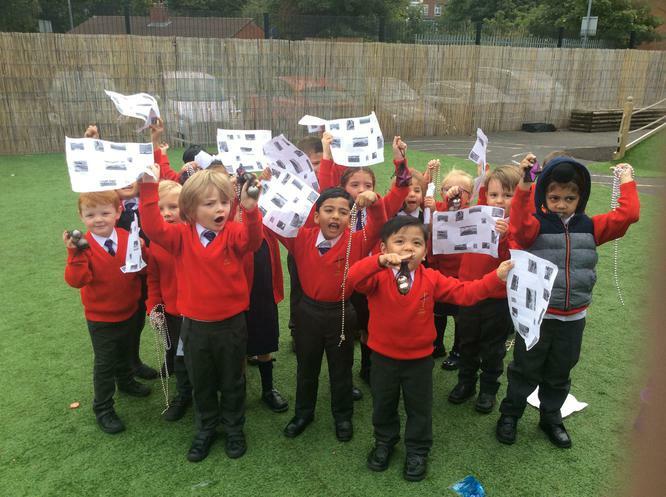 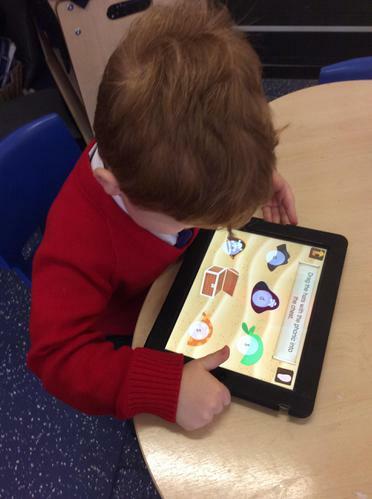 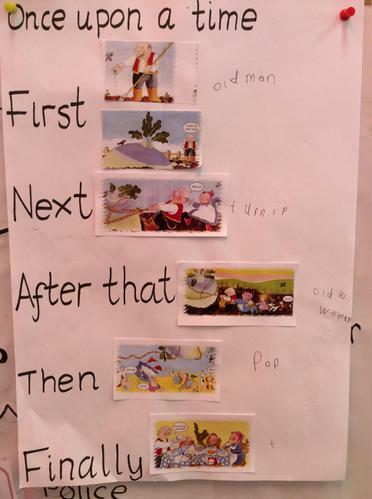 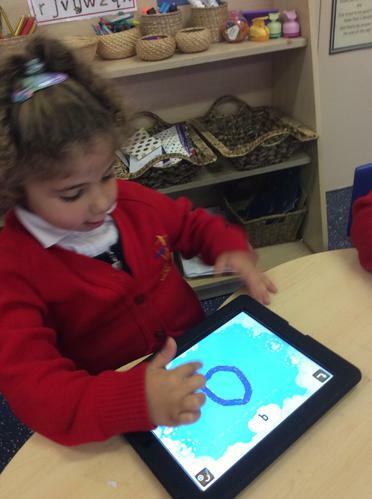 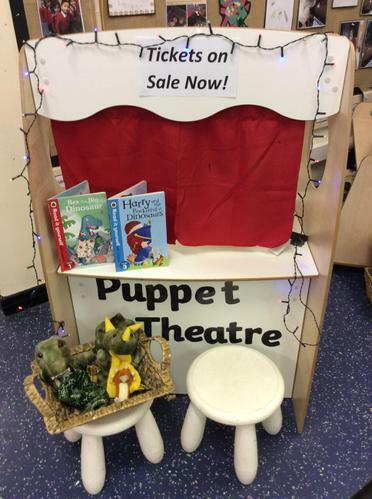 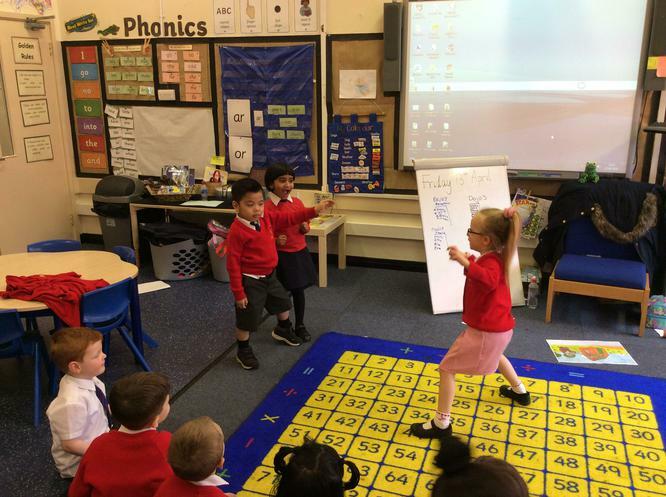 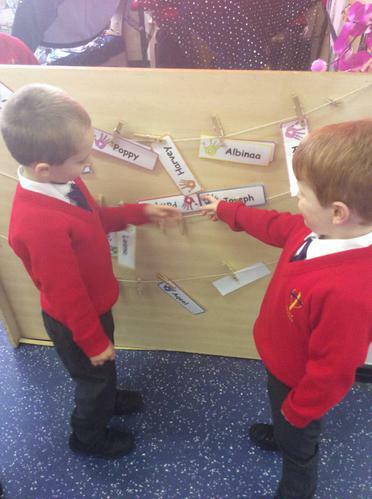 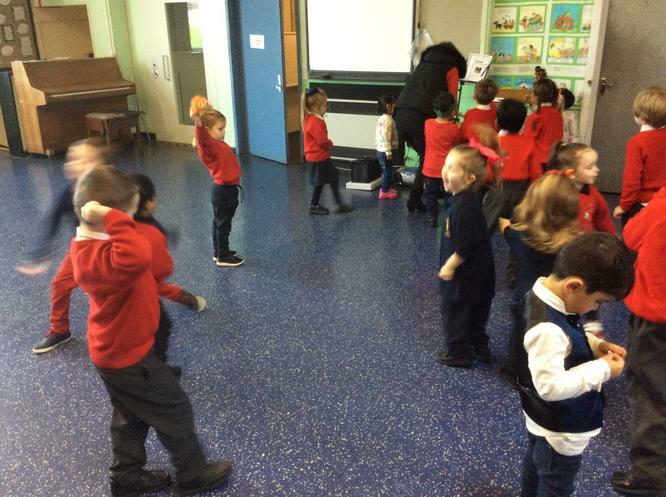 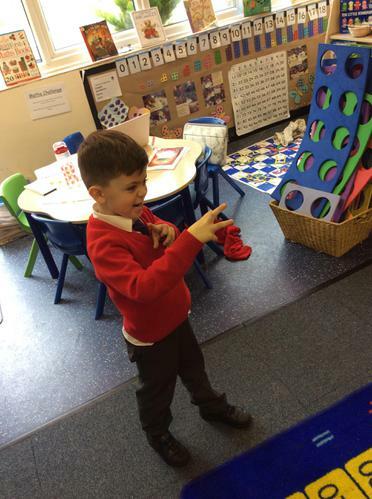 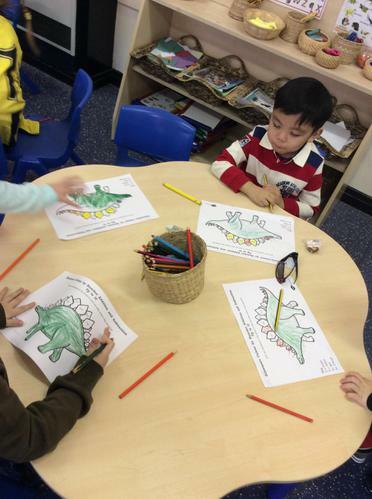 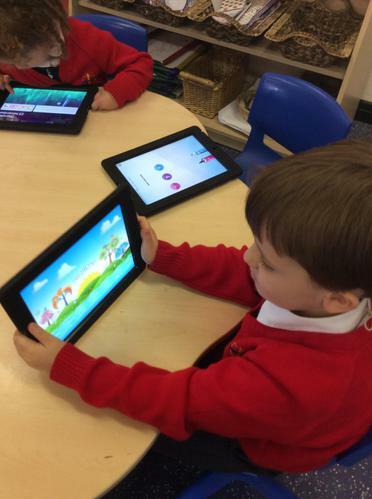 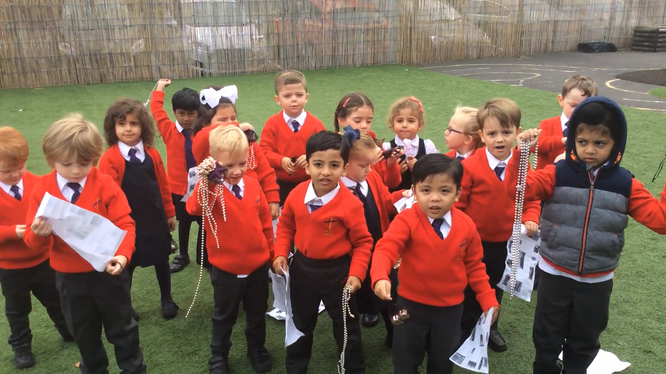 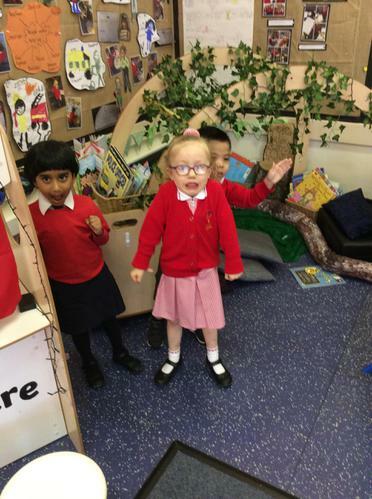 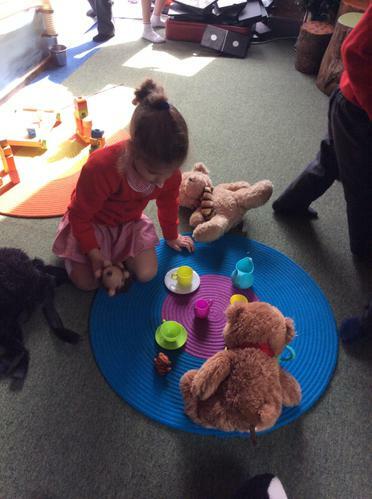 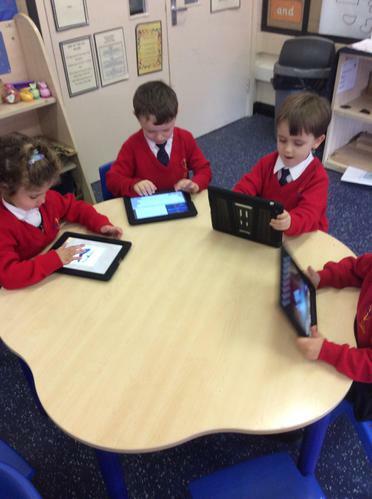 Reception used their class storymap to retell the story of the Billy Goats Gruff. 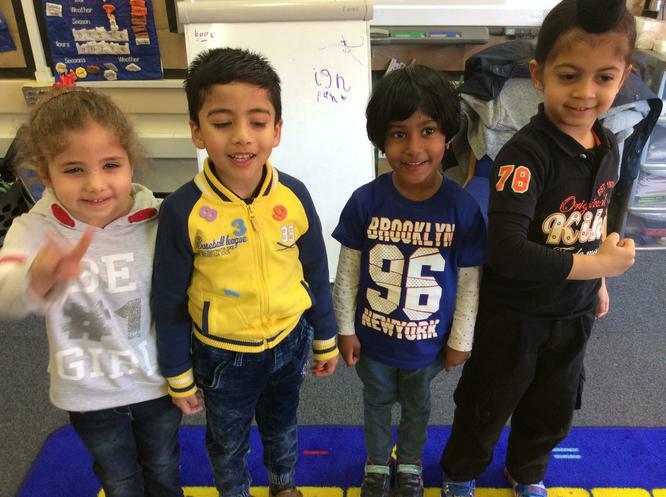 Click on the link to listen. 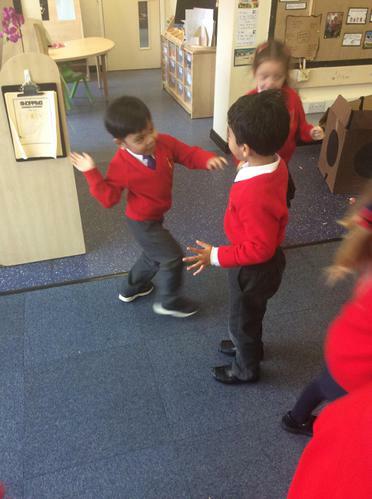 Role-playing and freeze-framing the Three Little Pigs. 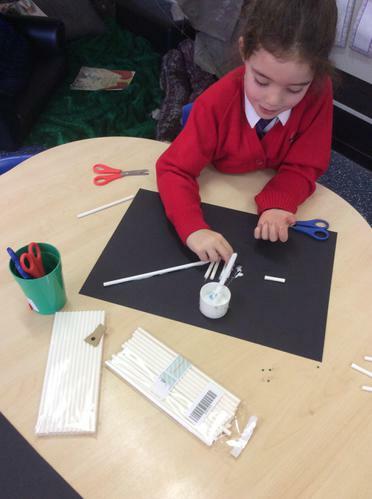 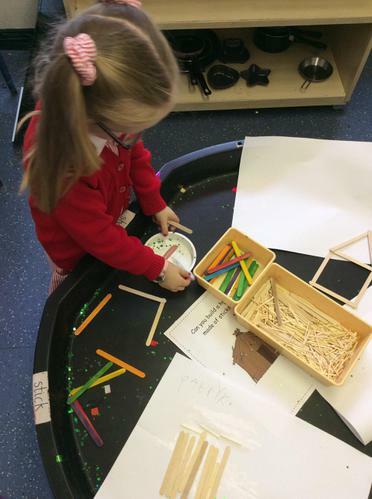 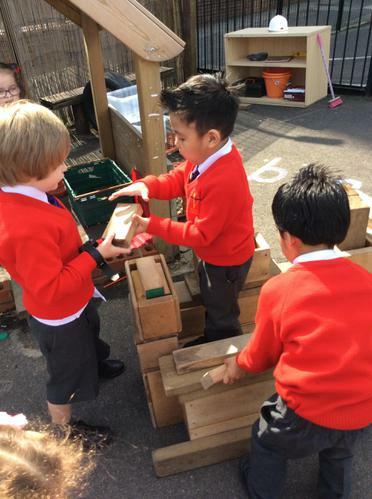 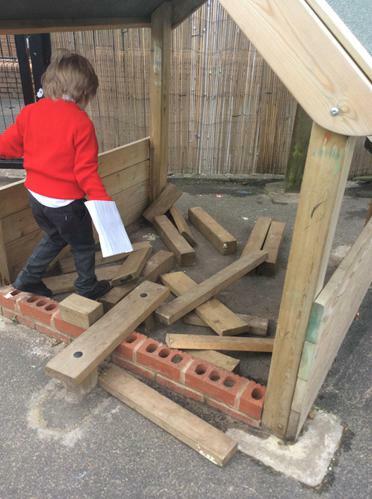 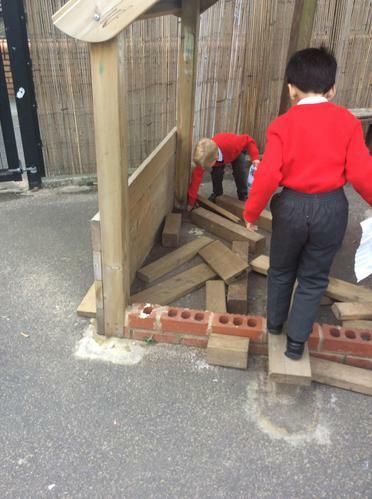 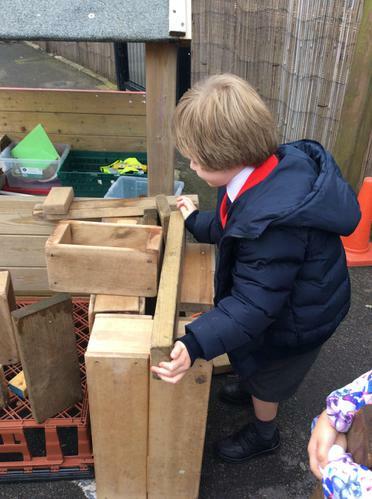 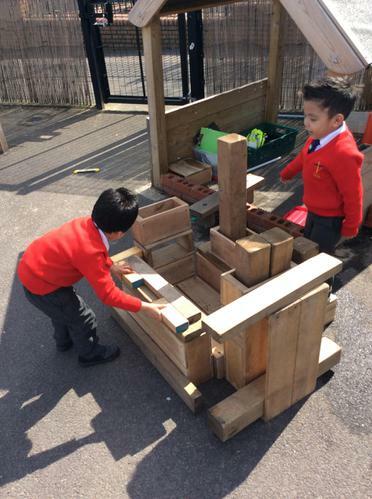 We have been building houses just like the three pigs. 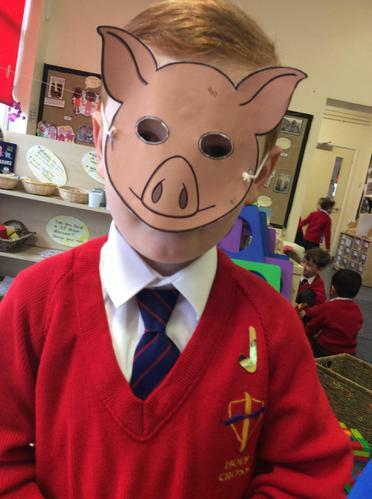 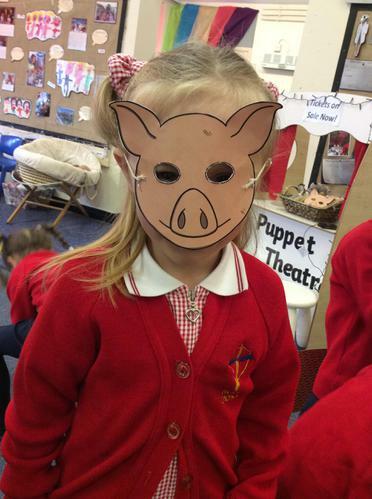 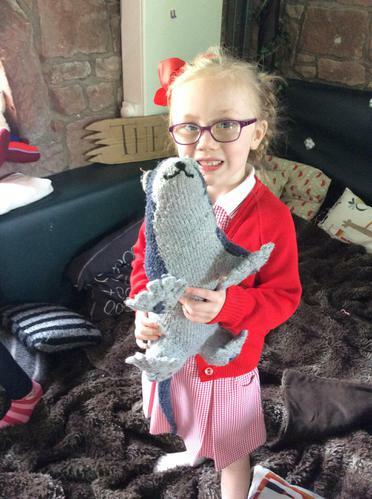 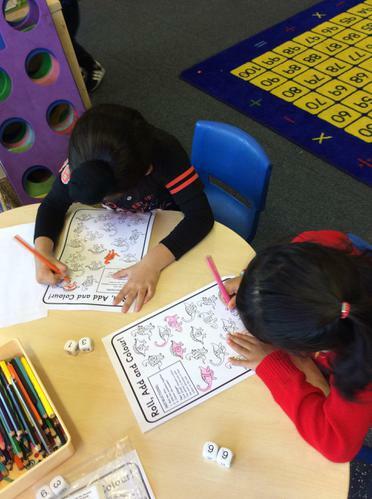 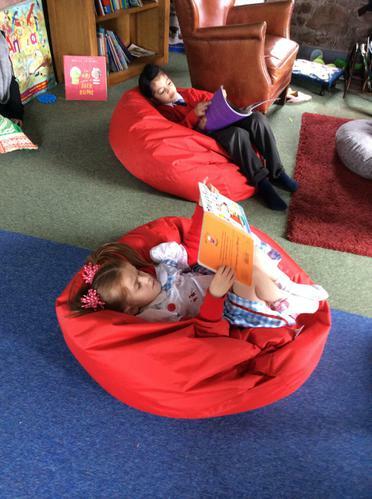 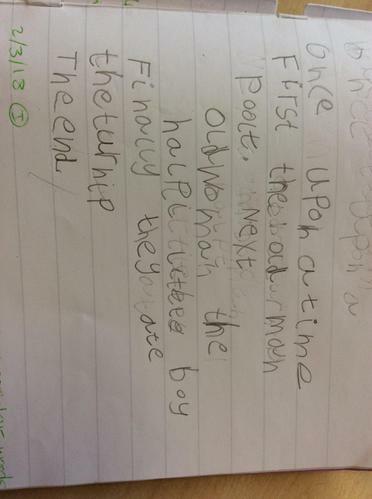 We have been reading the Three Little Pigs. 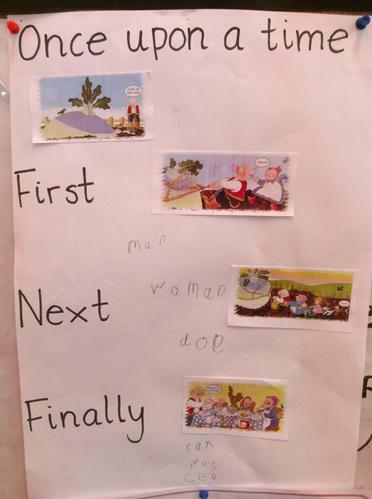 This is our class storymap. 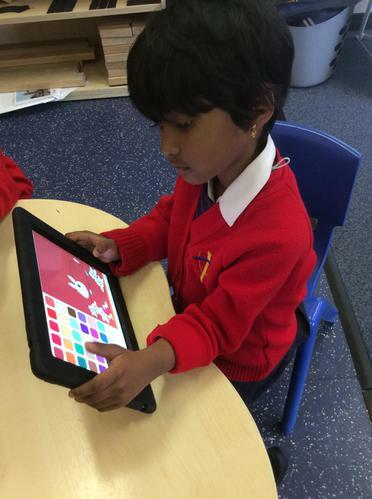 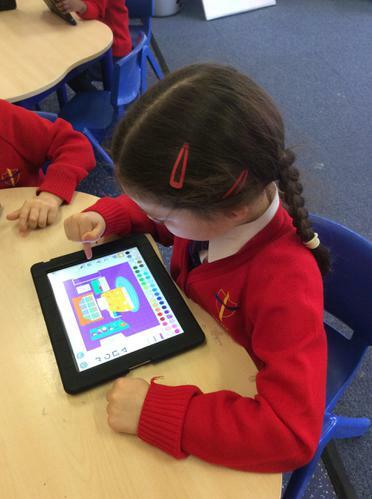 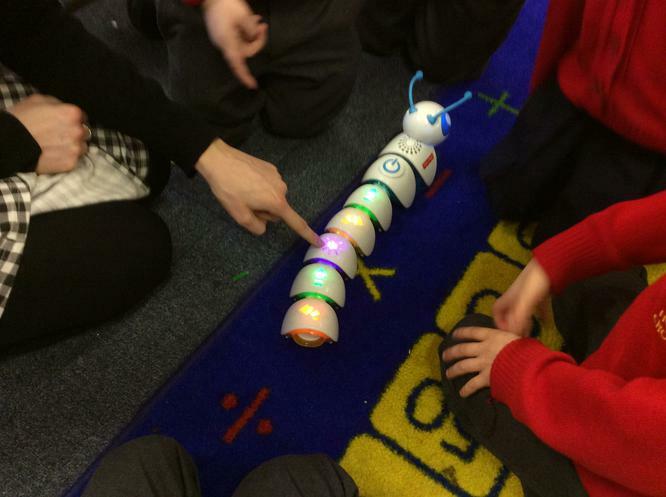 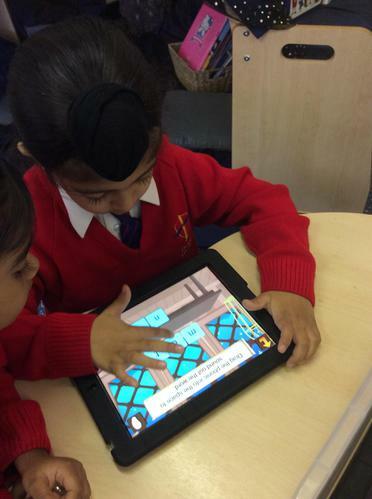 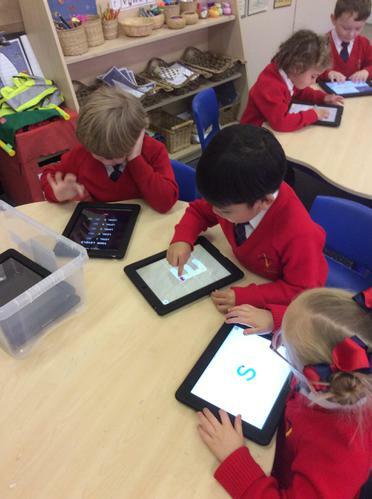 We have been data processing using code-apillars. 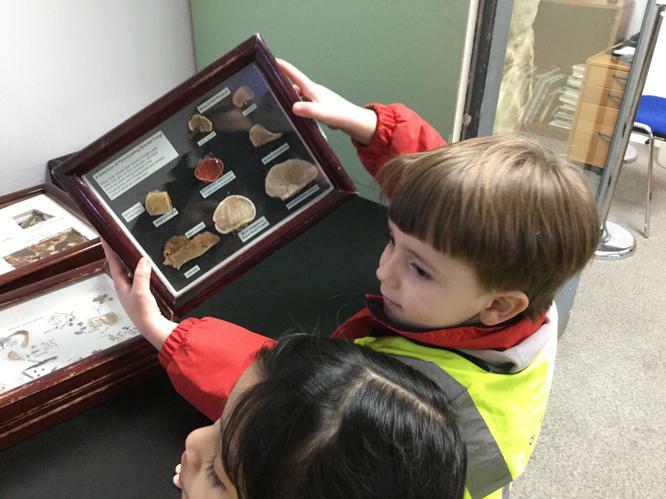 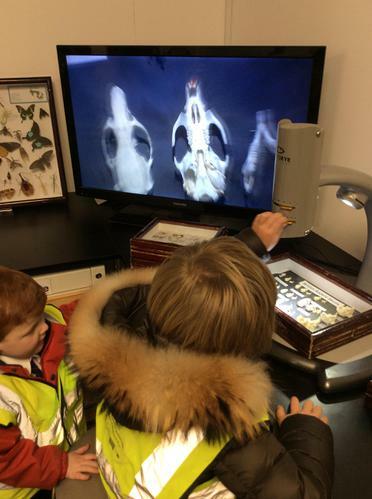 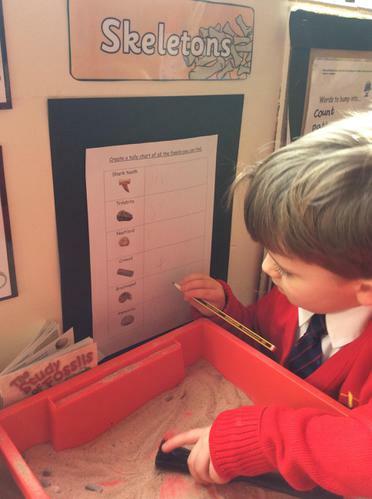 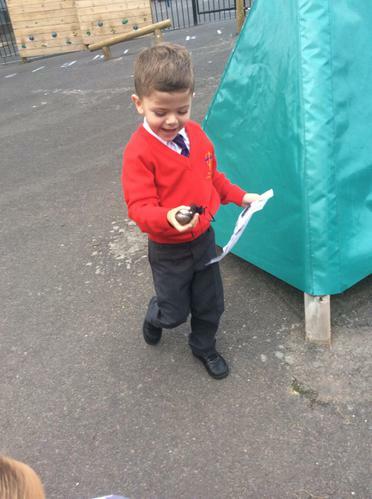 Reception sequenced a set of directions using arrows and watched how the code-apillar processed the information. 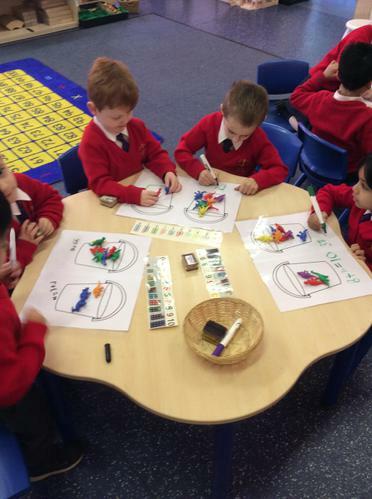 We have learned that this set of instructions is called an Algorithm! 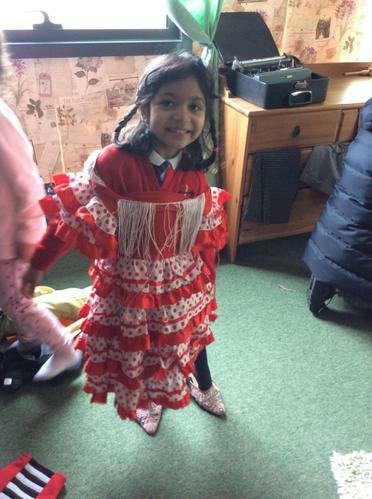 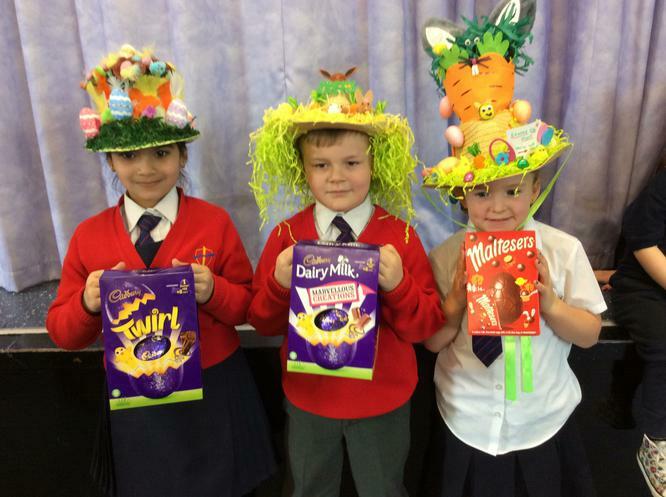 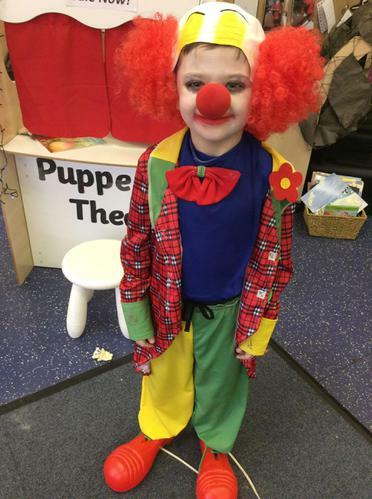 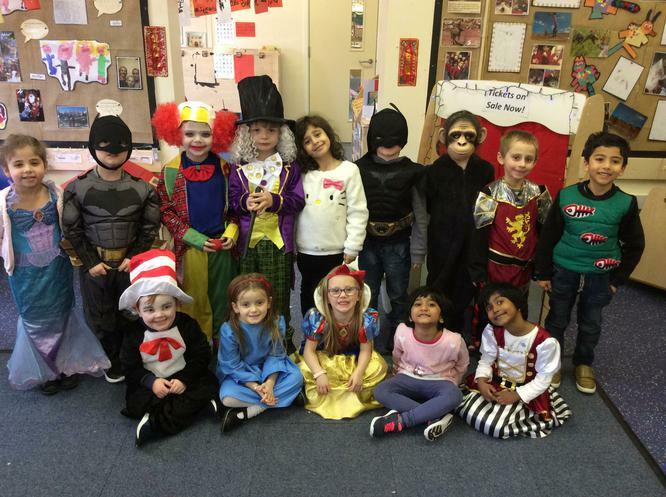 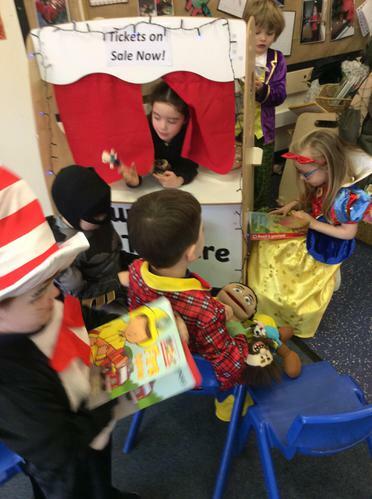 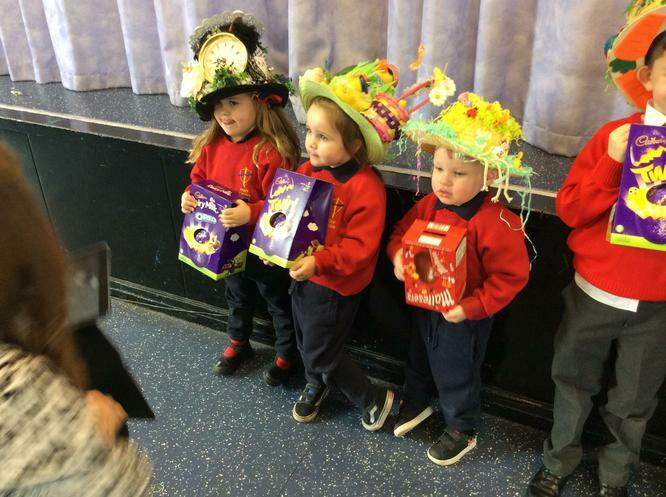 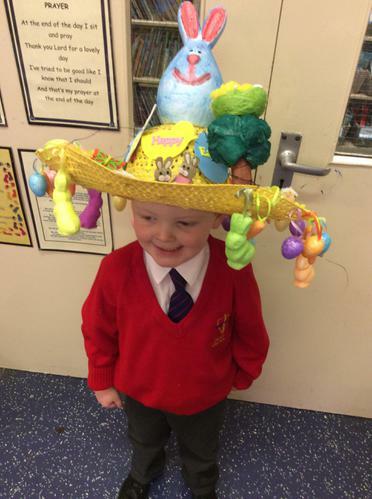 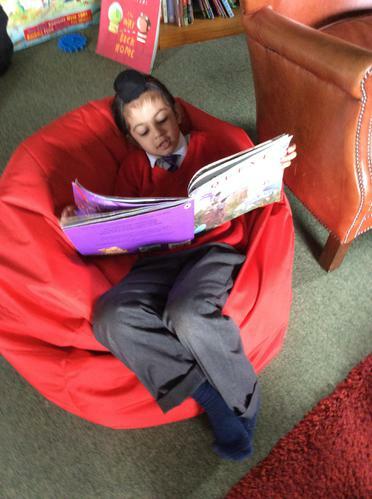 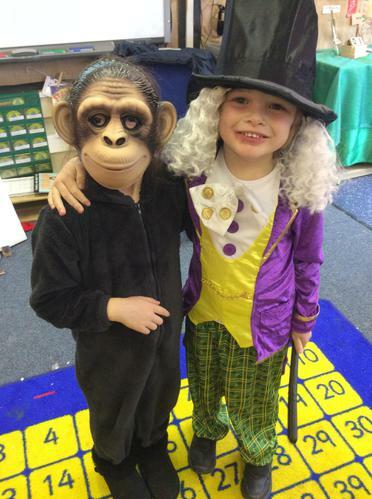 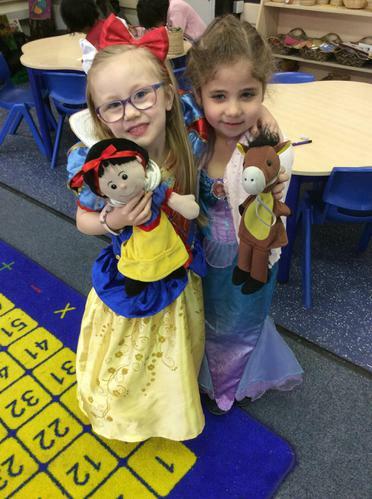 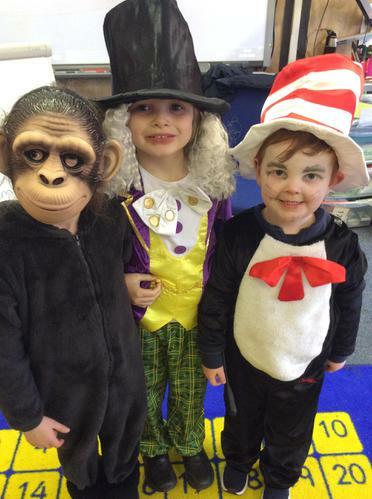 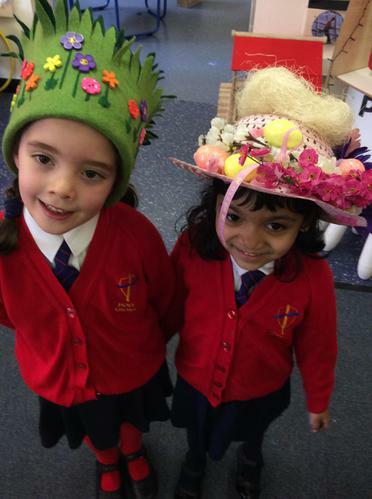 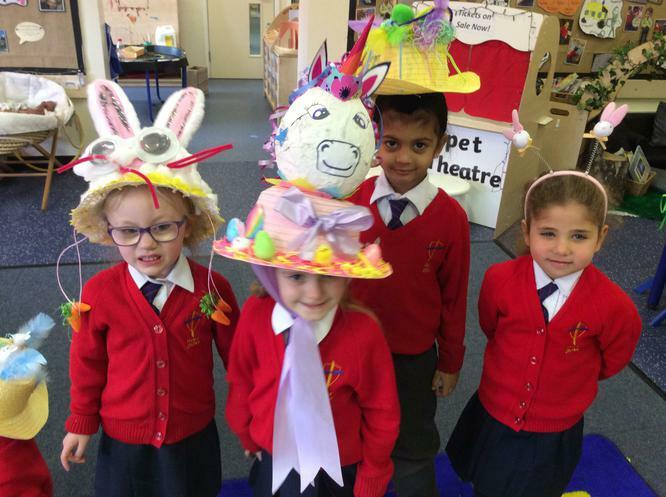 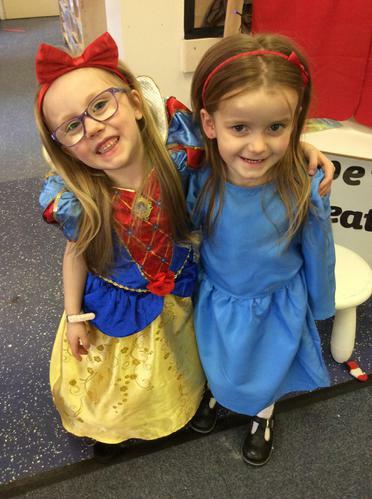 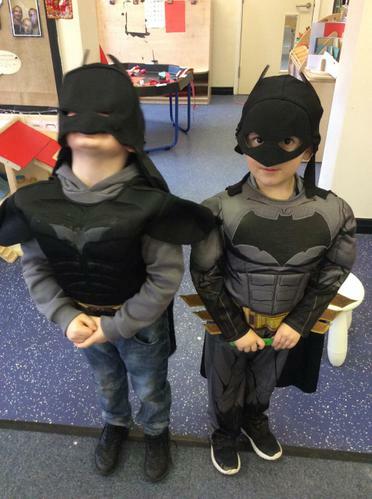 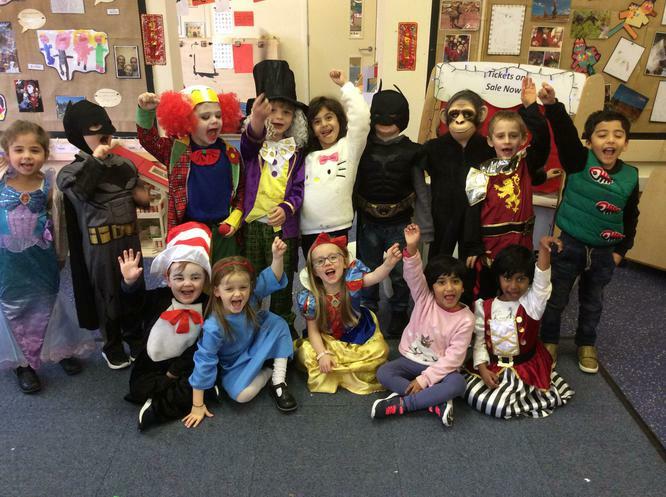 Dressing up for World Book Day! 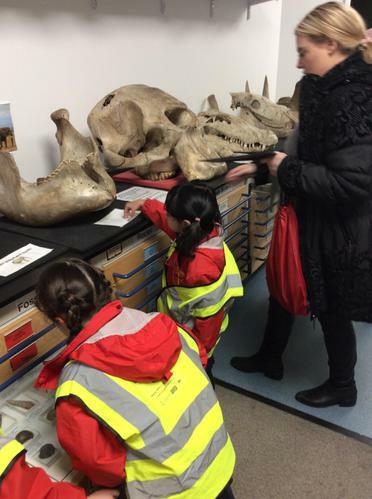 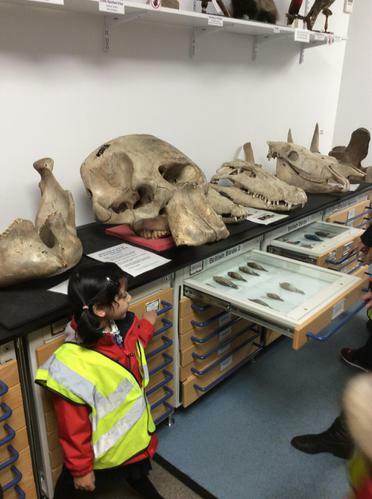 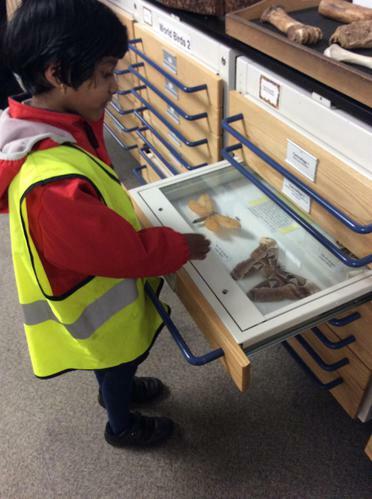 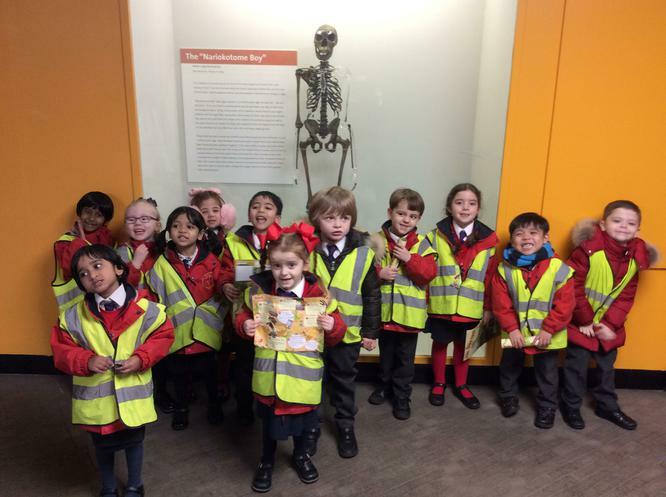 Central library visit for World Book Day. 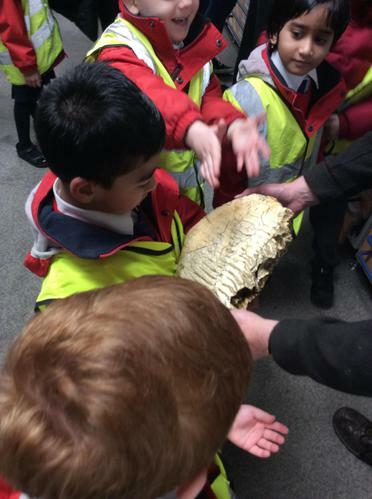 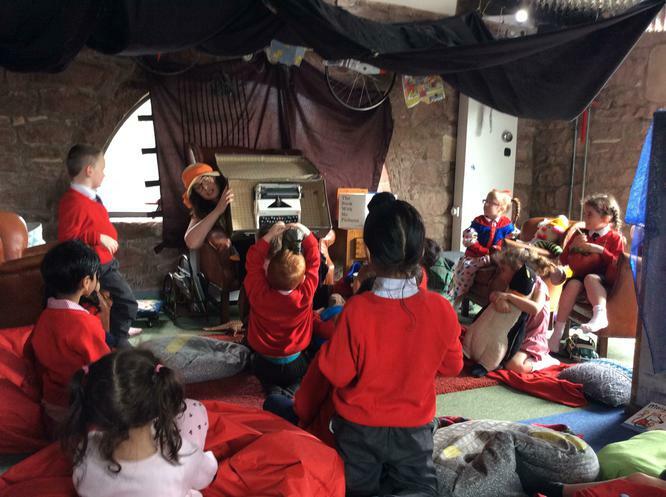 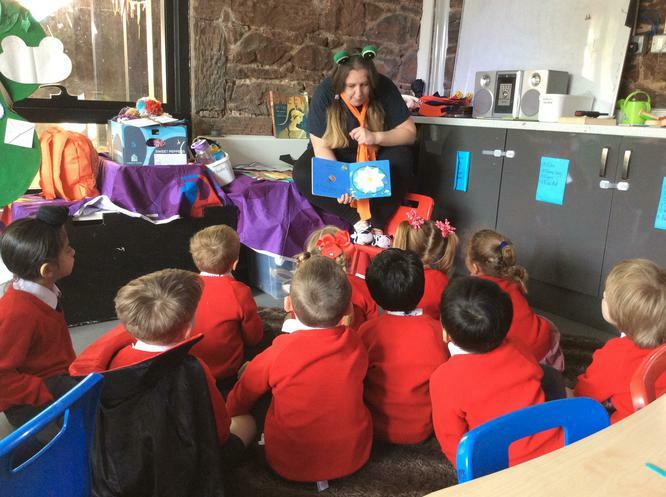 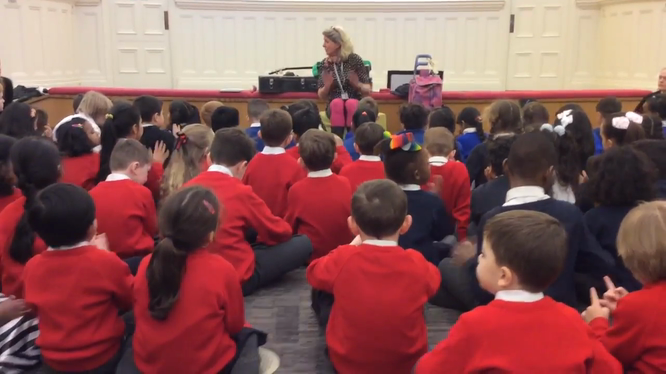 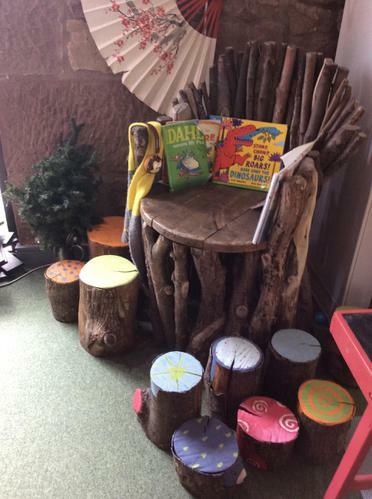 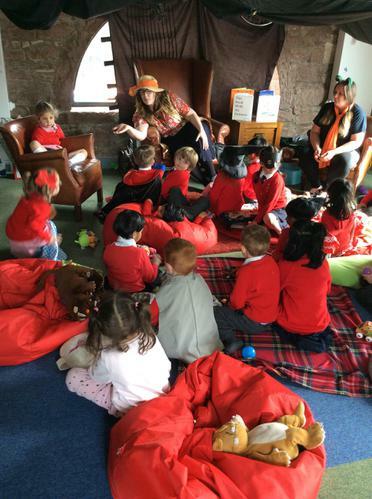 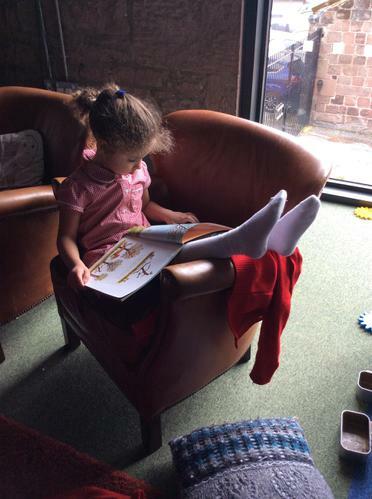 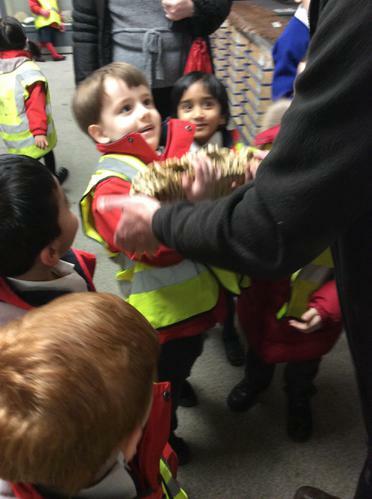 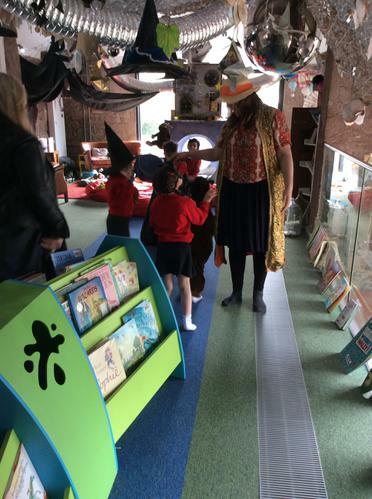 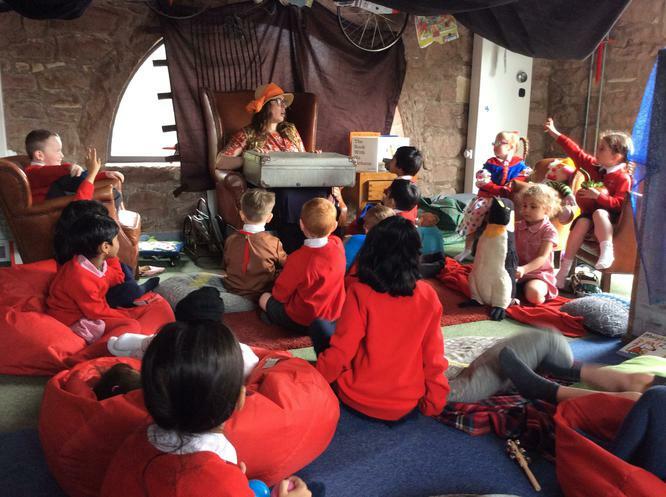 Reception enjoyed their trip to the Central library to listen to Sal Tonge, a fantastic story-teller, who sang songs and told us stories called ‘The Enormous Turnip’ and ‘Goldilocks And the Three Bears’. 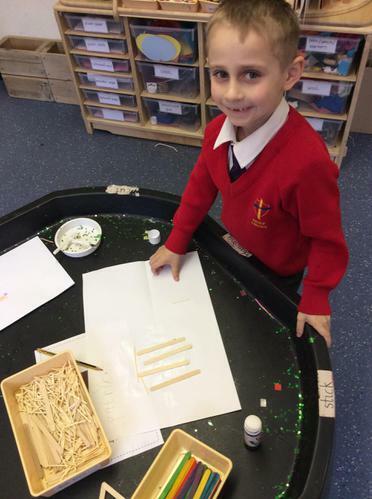 Sal was so funny and we enjoyed listening to the stories so much, we decided to write our own version when we got back to school. 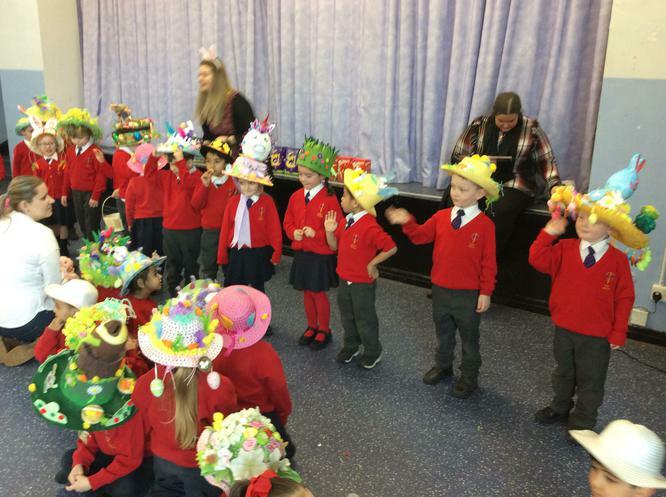 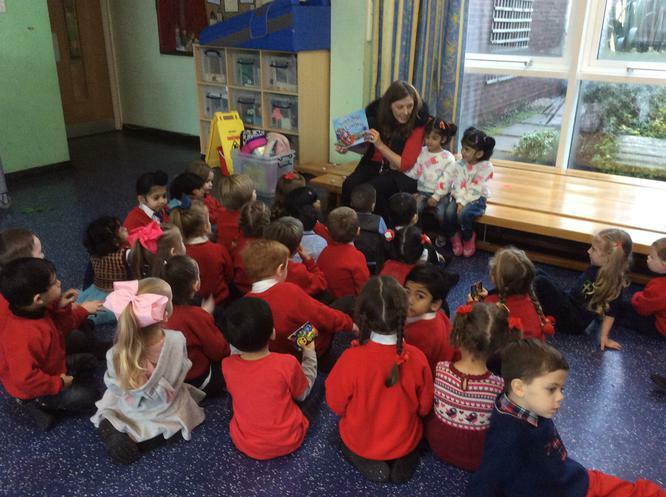 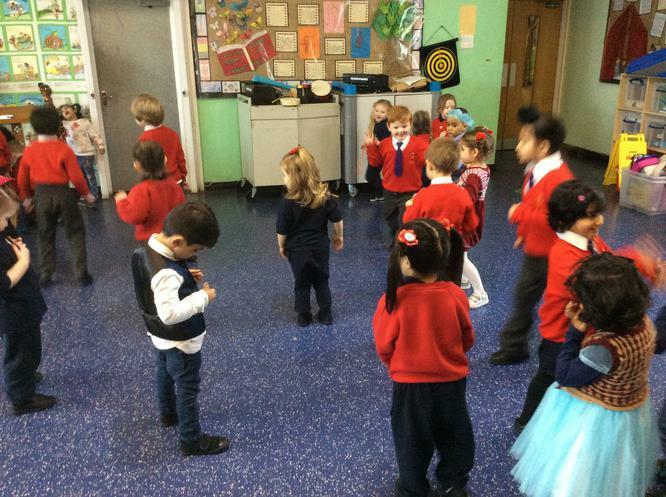 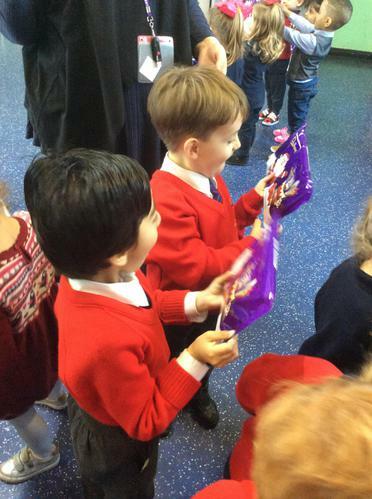 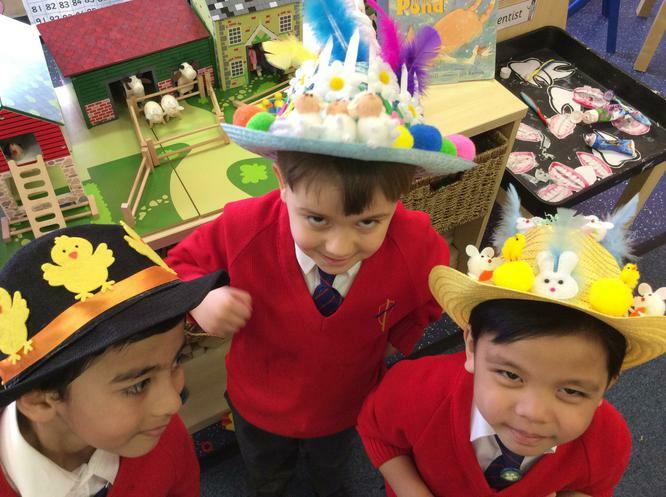 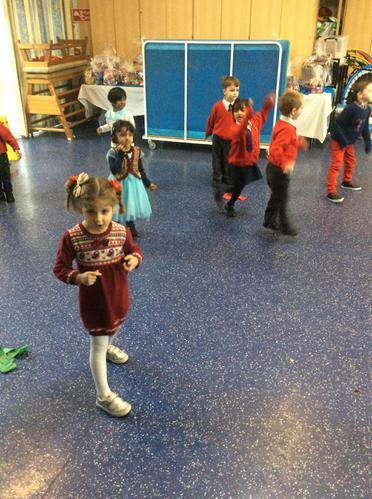 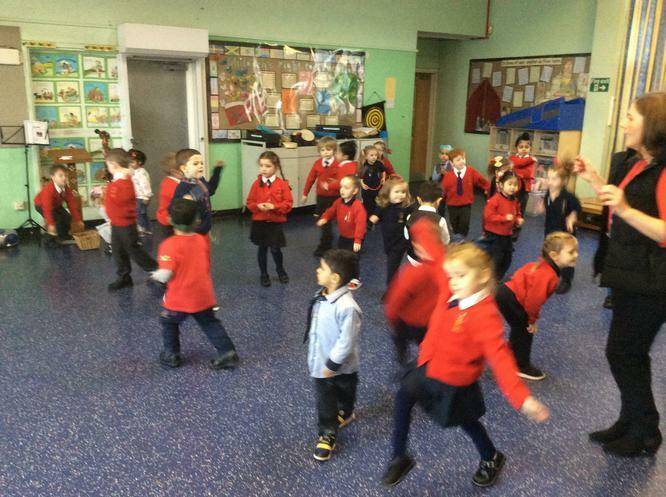 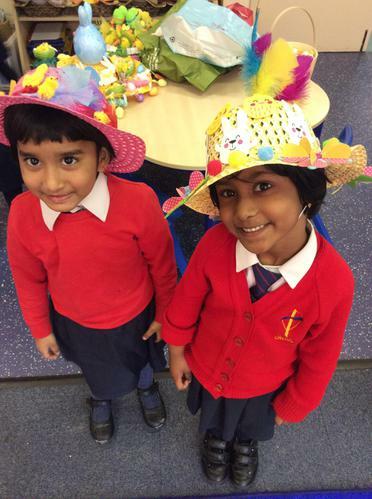 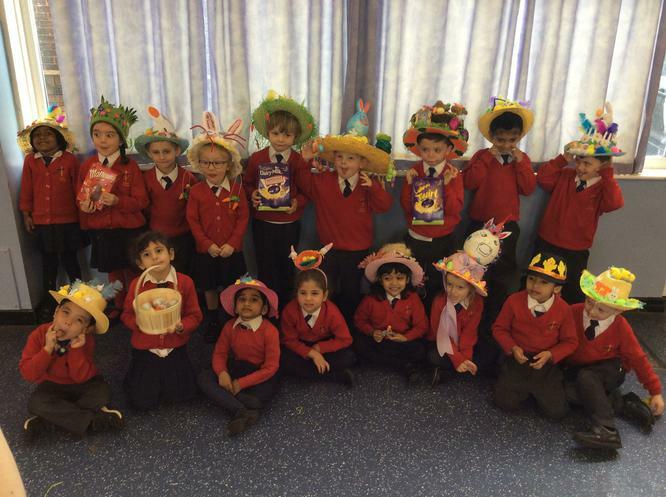 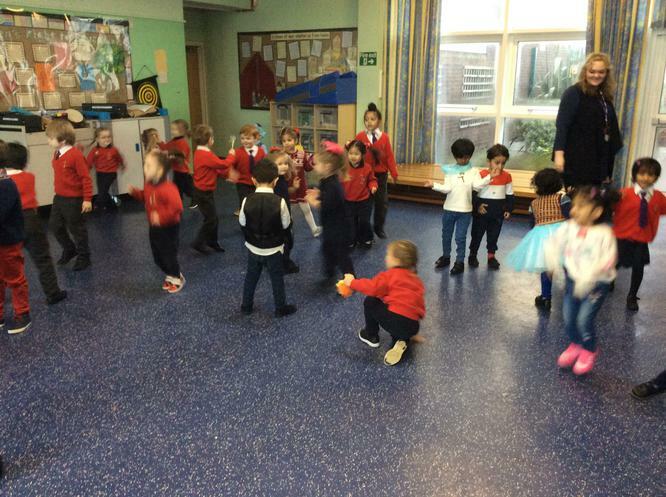 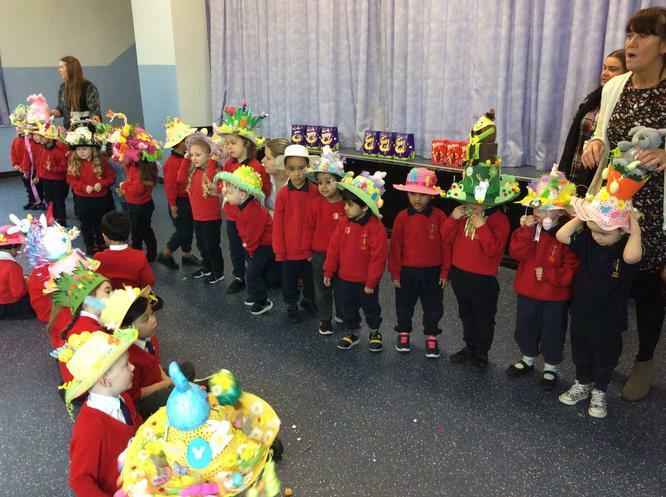 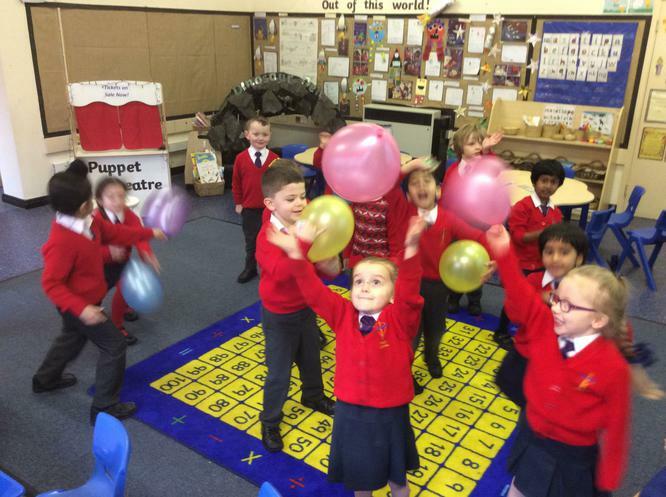 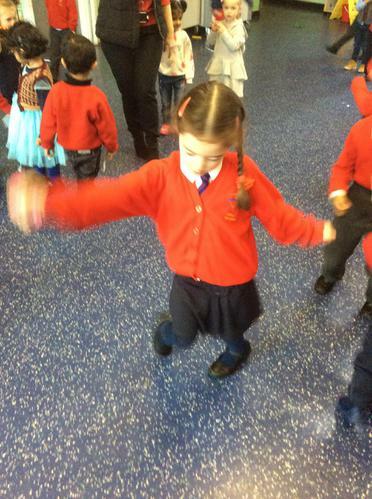 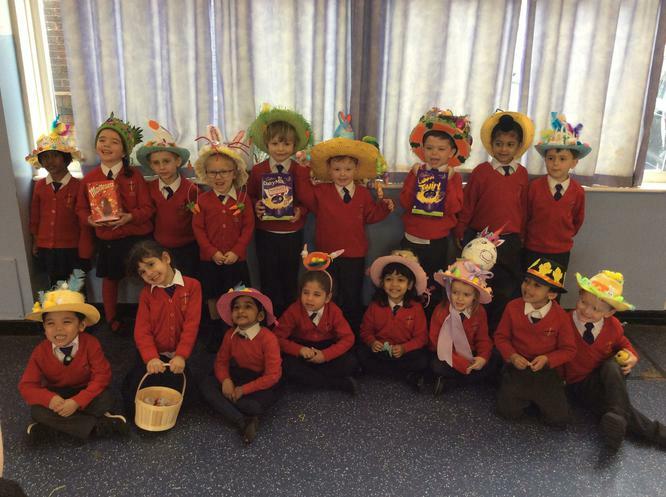 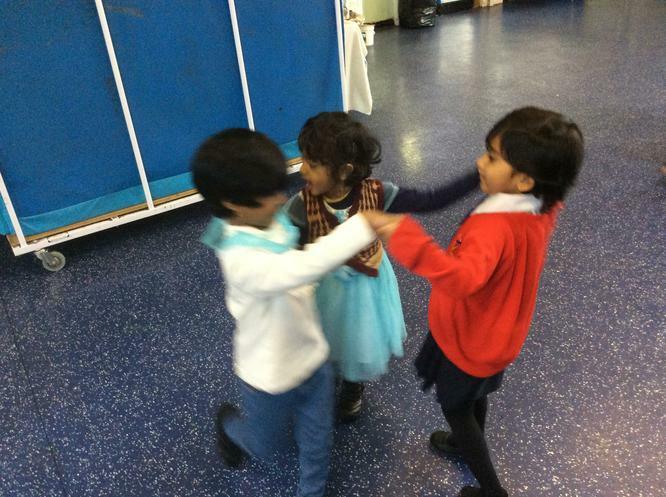 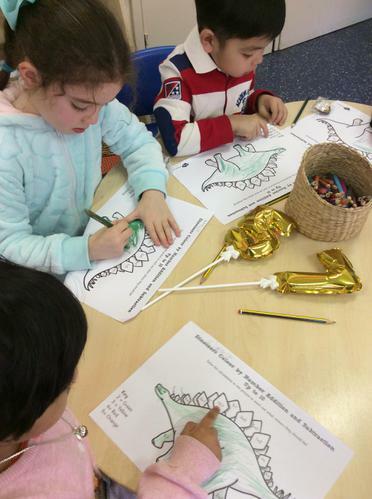 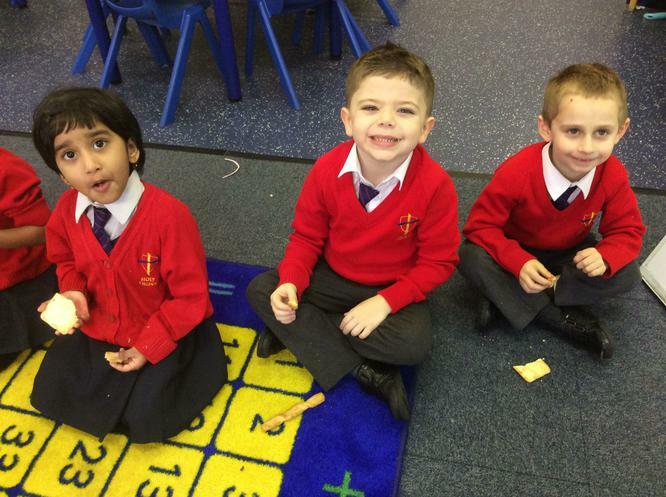 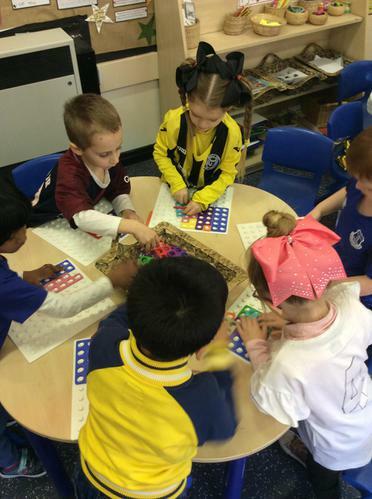 Reception have enjoyed celebrating Chinese New Year. 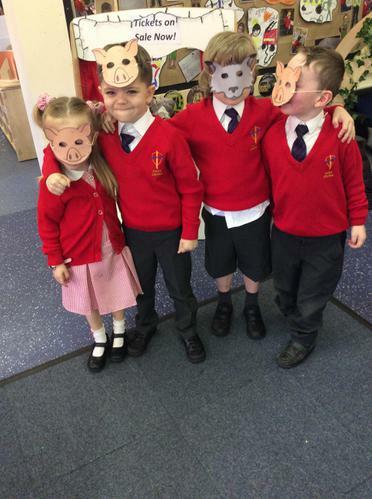 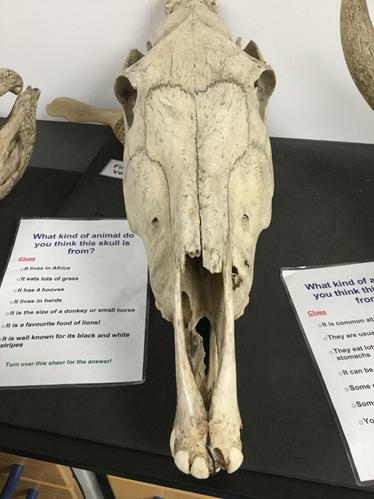 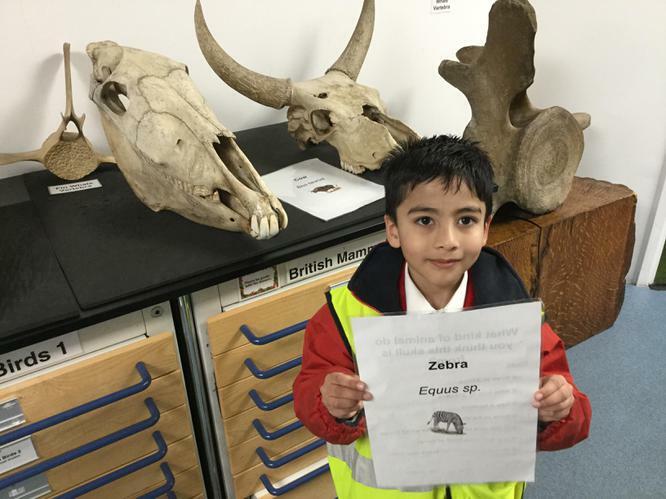 We have learned the story of the big race and talked about the animals that make up the Chinese zodiac signs. 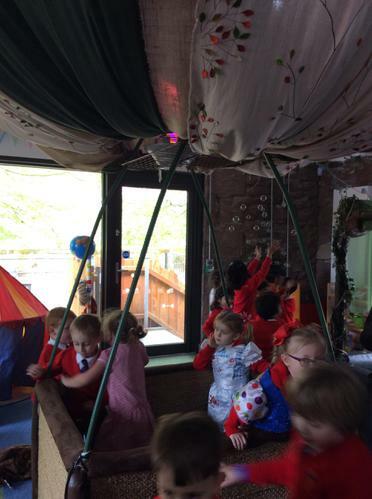 We have decorated our classroom with Chinese lanterns, dancing dragons and Chinese writing. 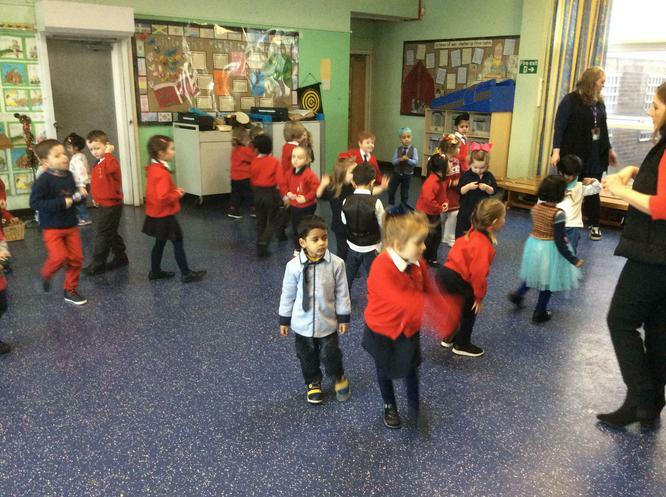 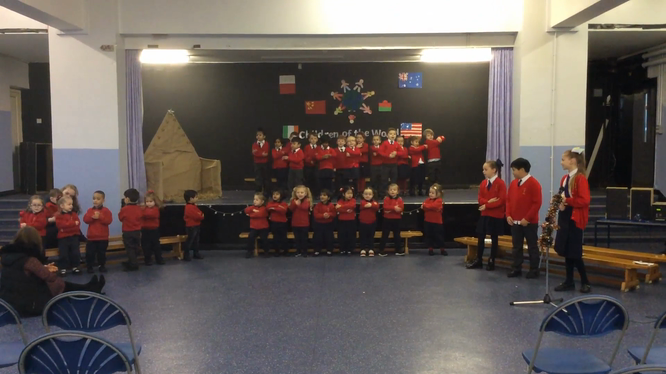 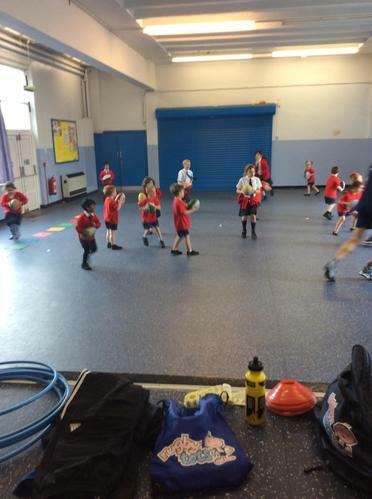 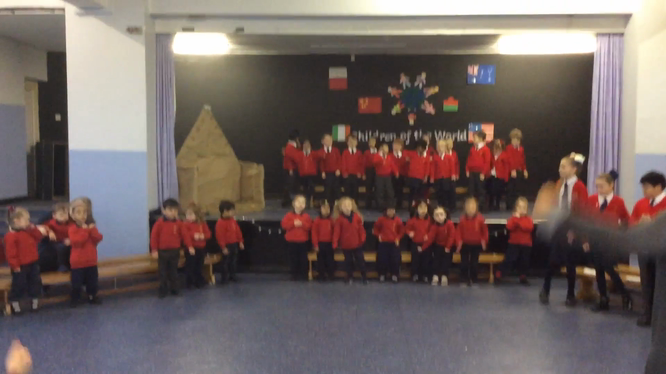 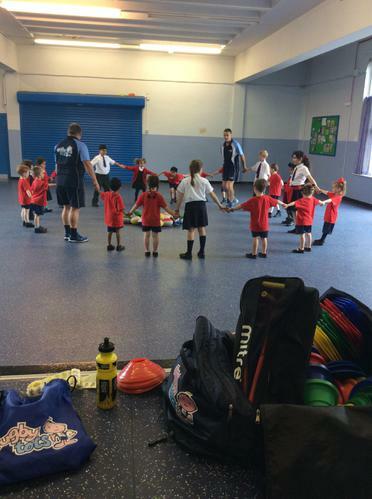 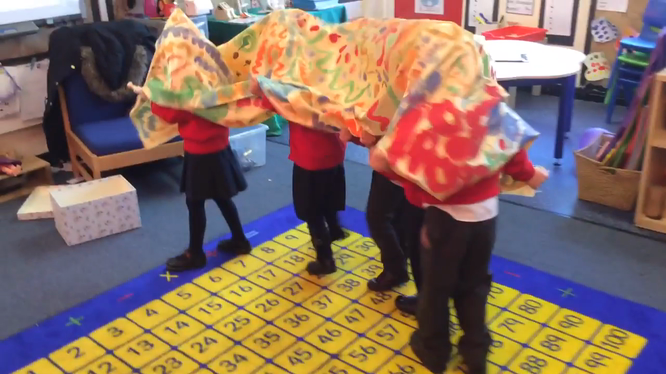 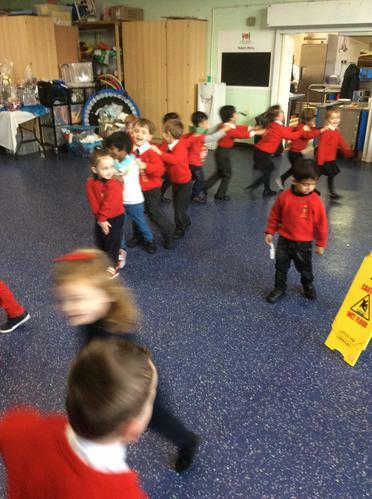 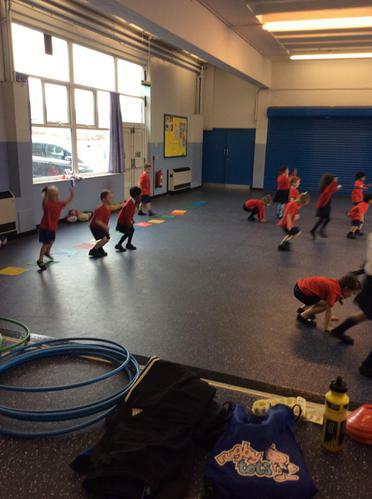 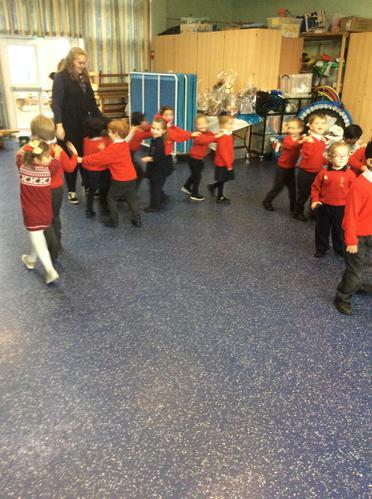 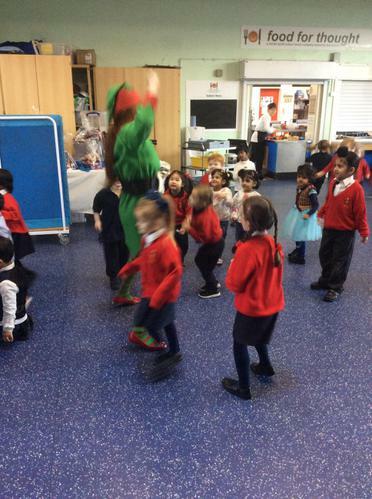 We then performed our very own Chinese dragon dance complete with Chinese instruments. 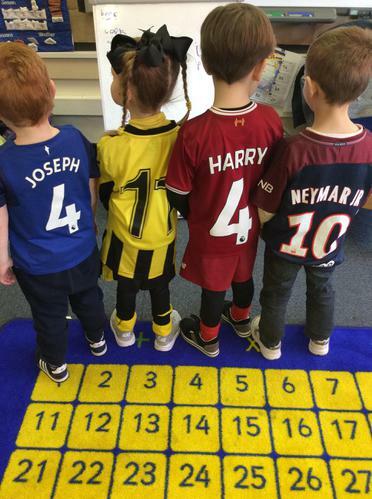 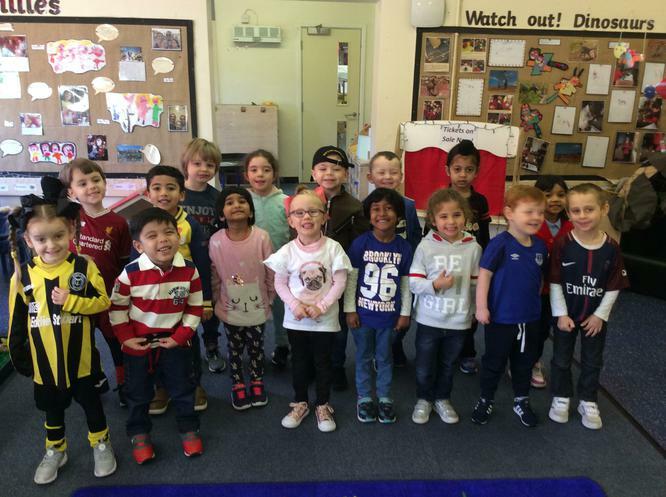 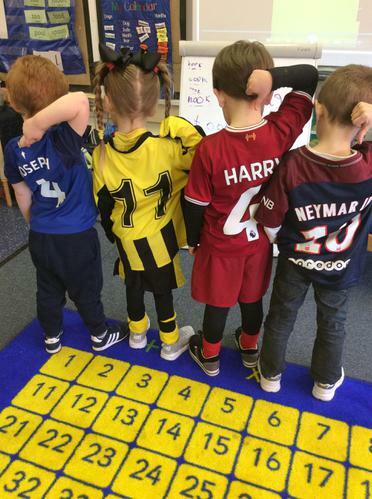 ‘Dress up as a digit’ day for NSPCC. 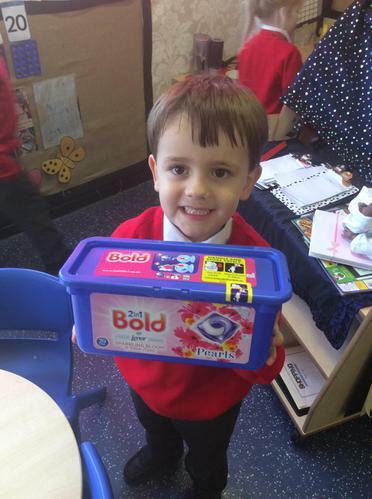 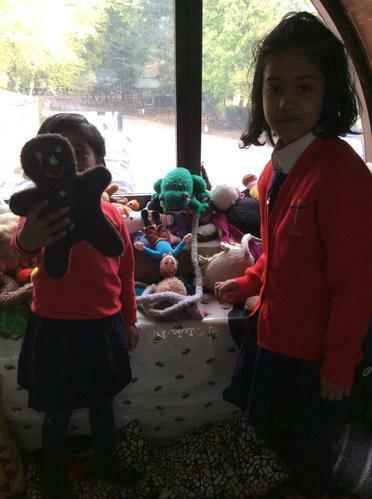 Thank you all parents and children for your kind and generous donations! 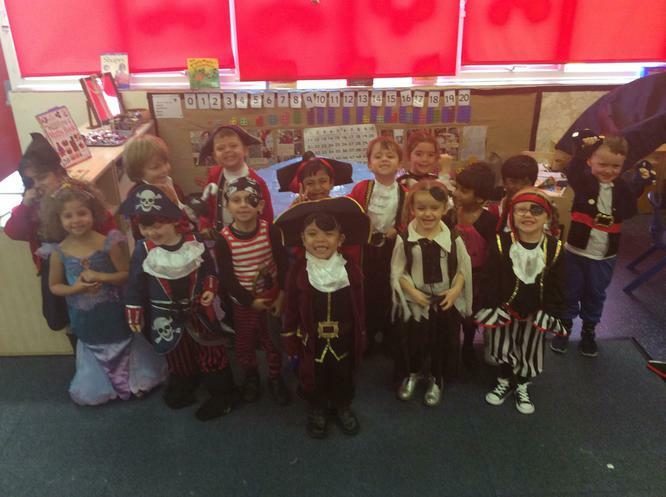 Everyone looked amazing! 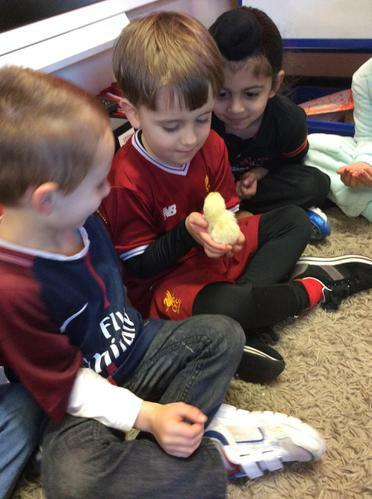 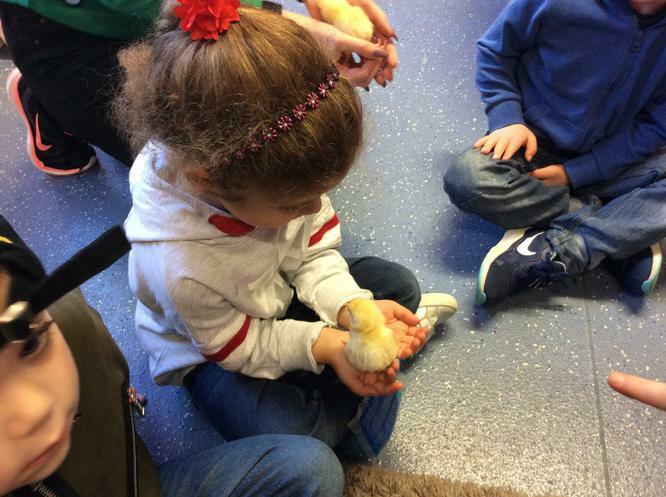 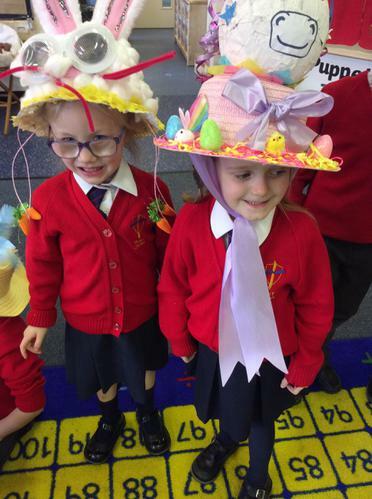 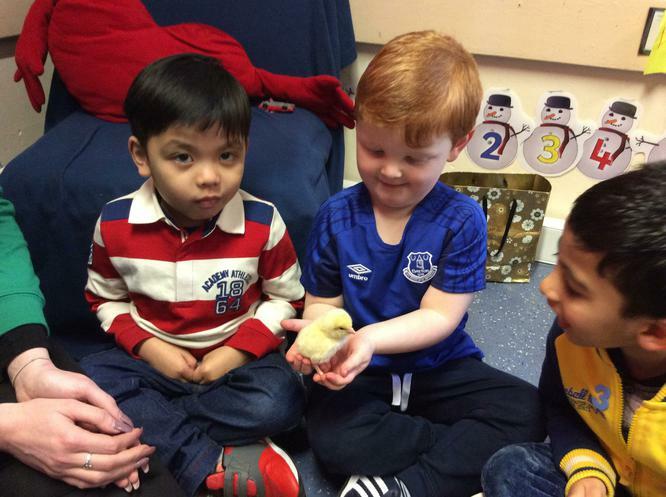 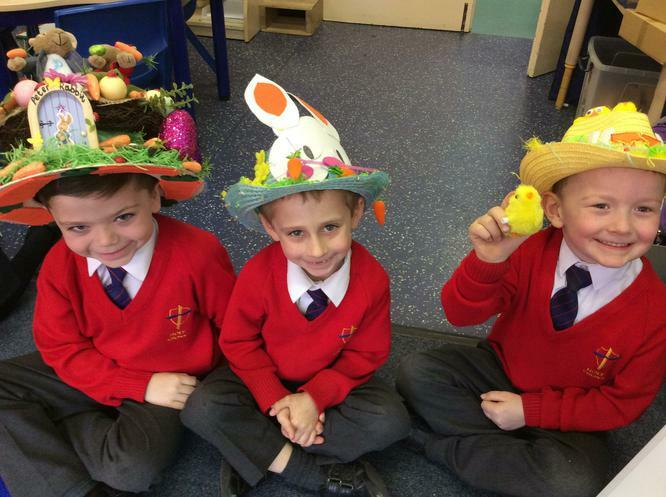 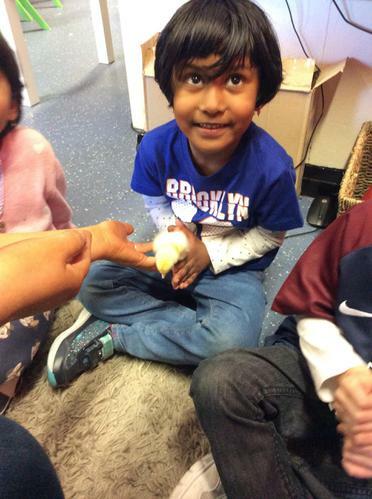 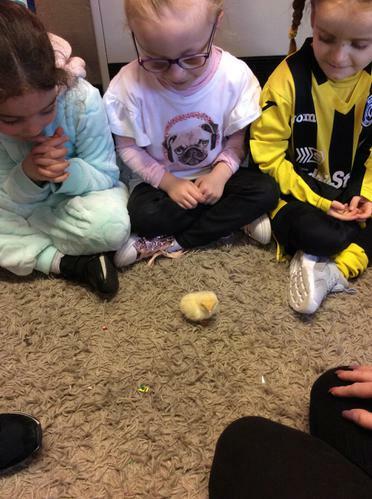 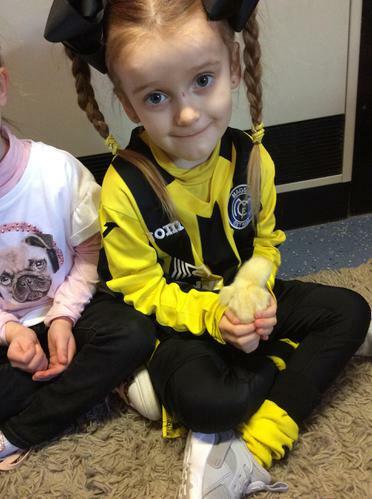 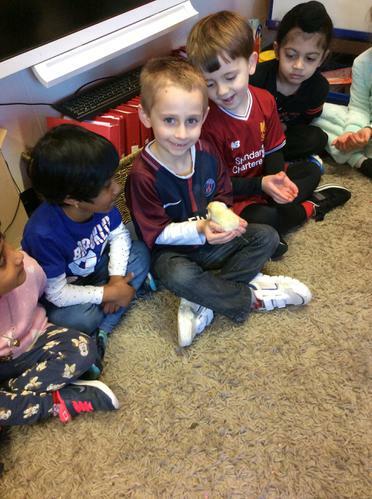 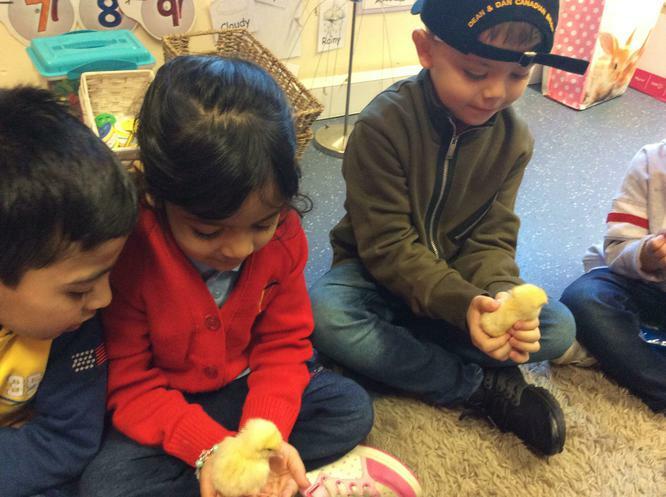 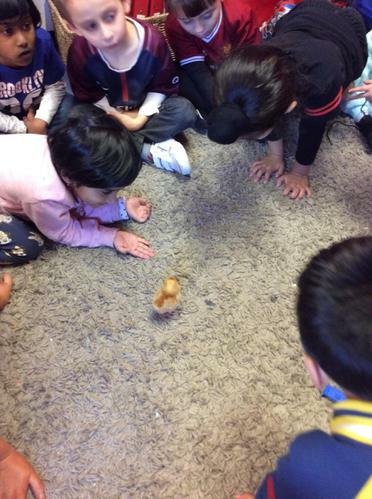 We are very lucky to have chicks in our school! 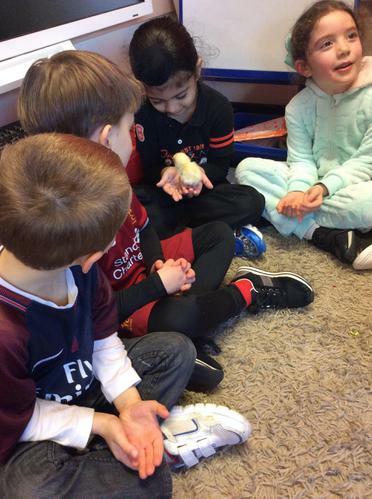 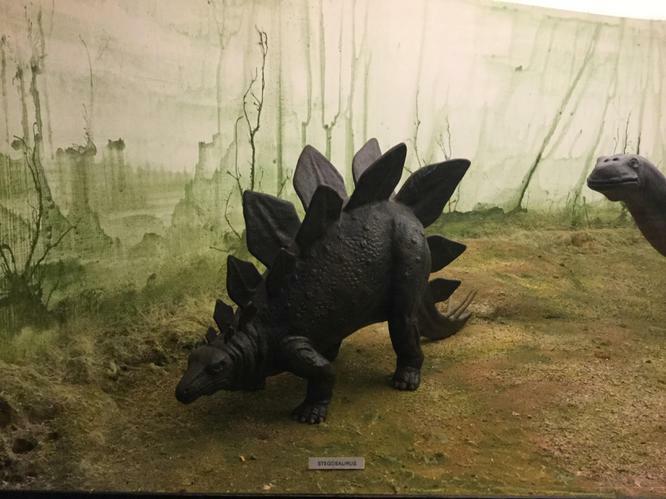 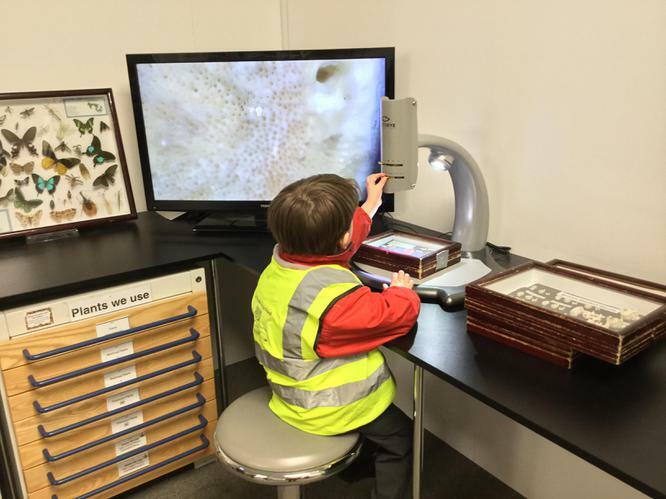 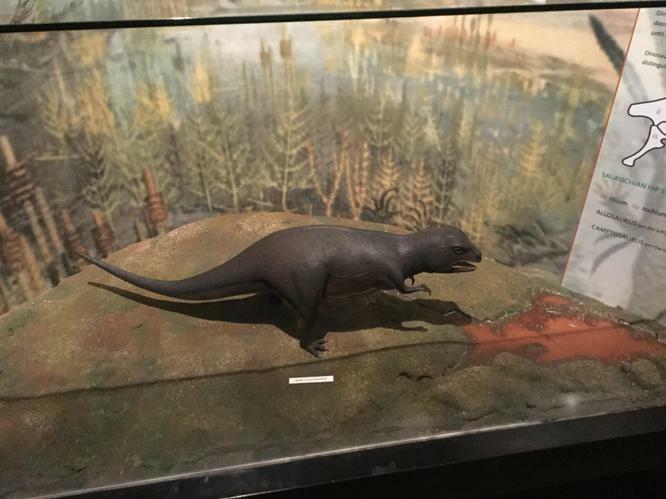 We watched them hatch out of their eggs and take their first steps. 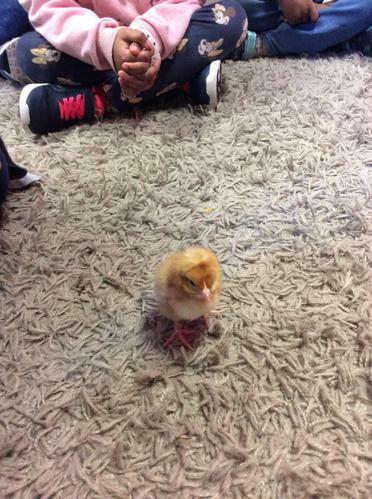 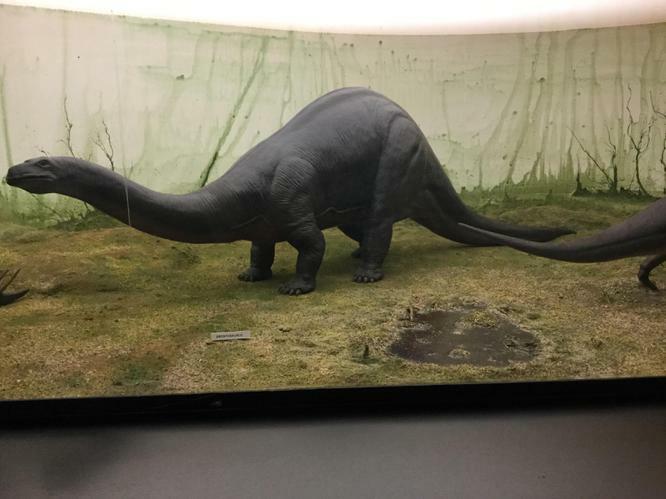 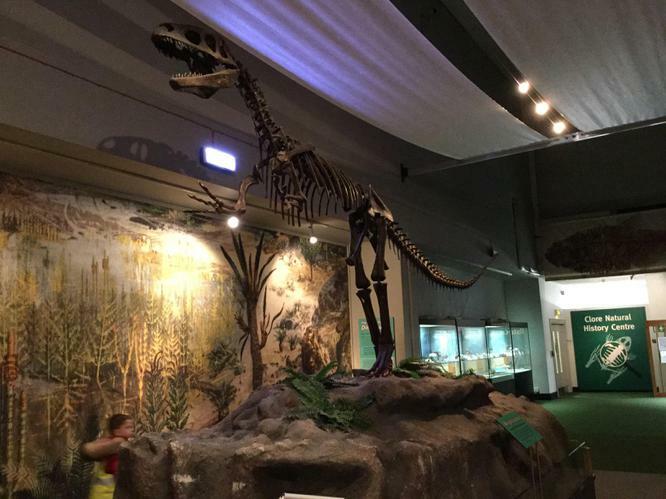 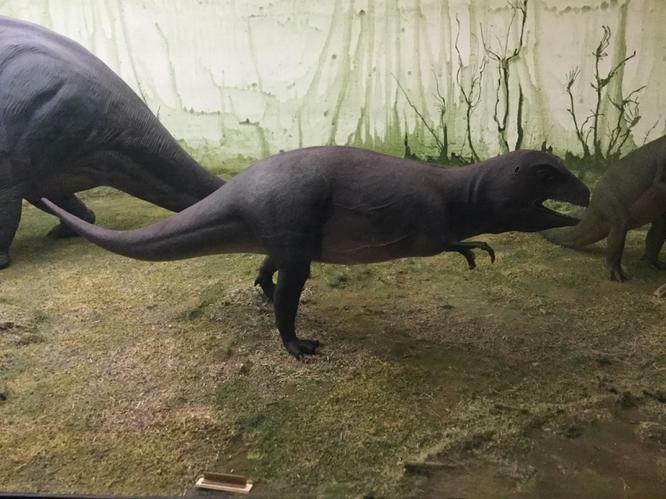 They were a bit wobbly to begin with, but soon found their feet. 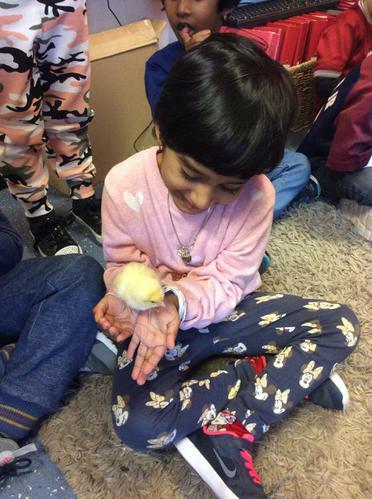 We have been very quiet and gentle around them, especially when holding them. 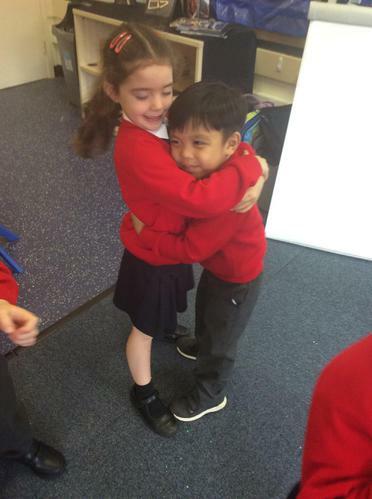 Reception think they are so cute! 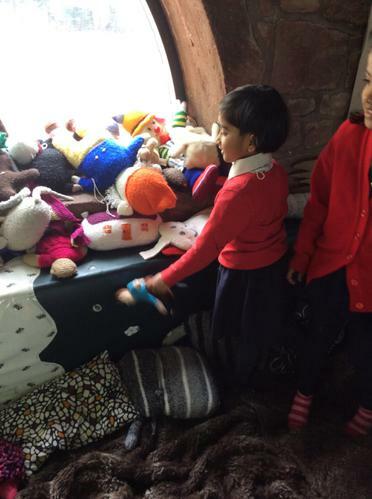 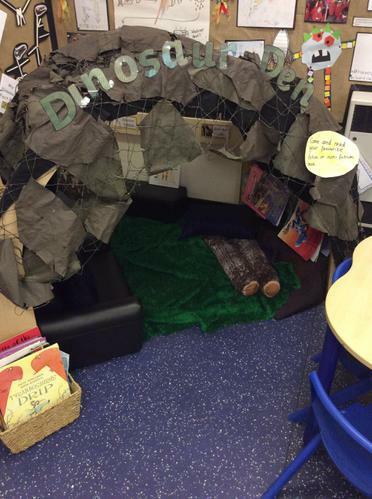 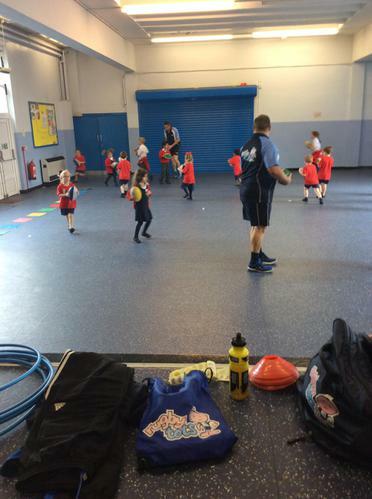 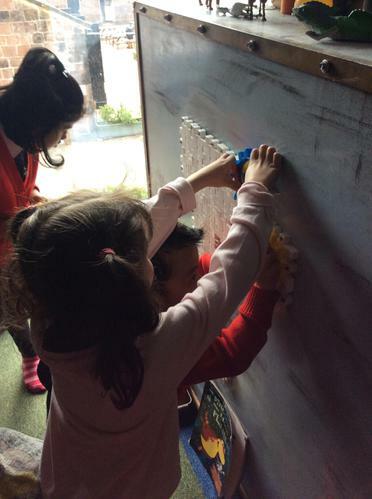 What could have trashed our classroom? 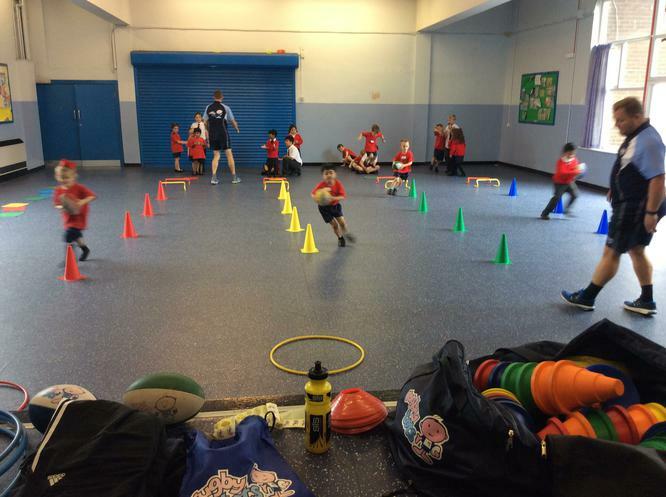 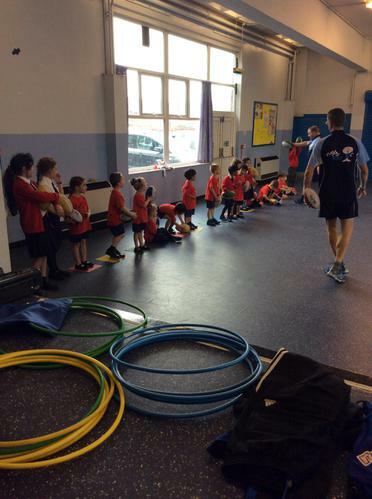 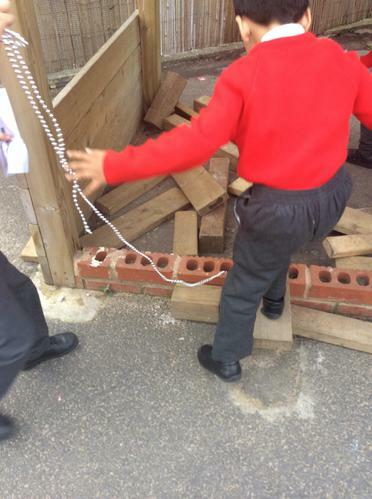 11 Reception fit inside the footprint! 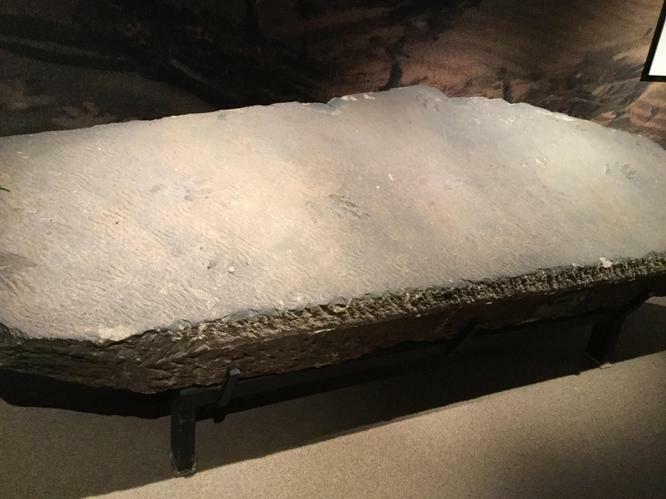 Who could have left this footprint? 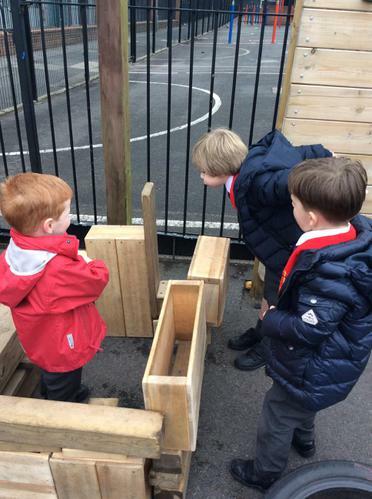 Guessing what could be inside. 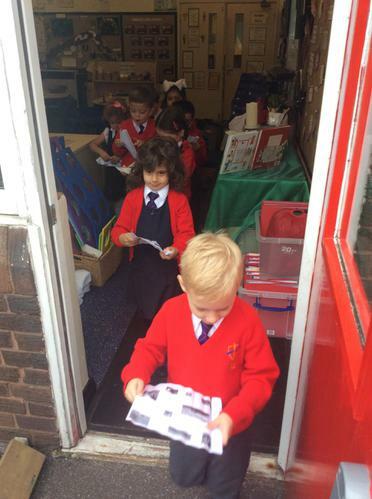 We are excited to see what’s inside. 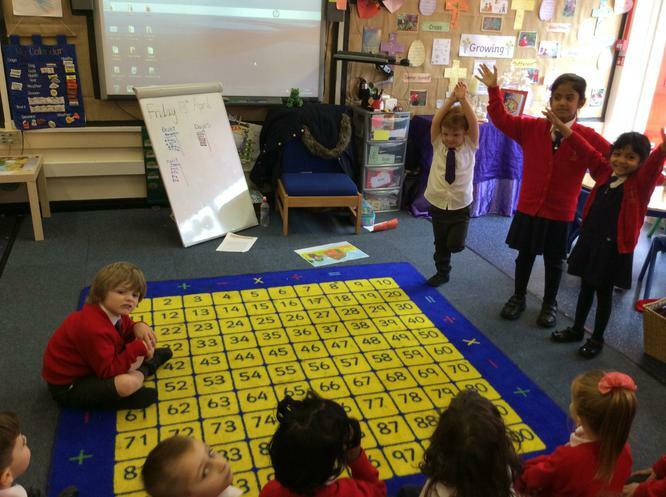 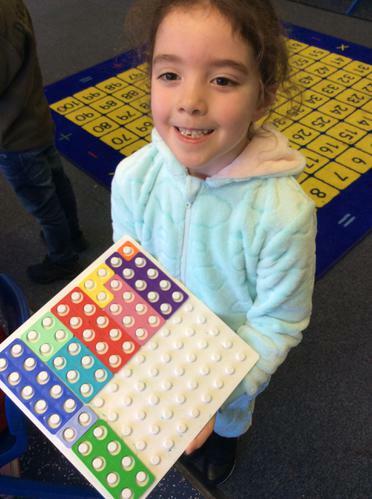 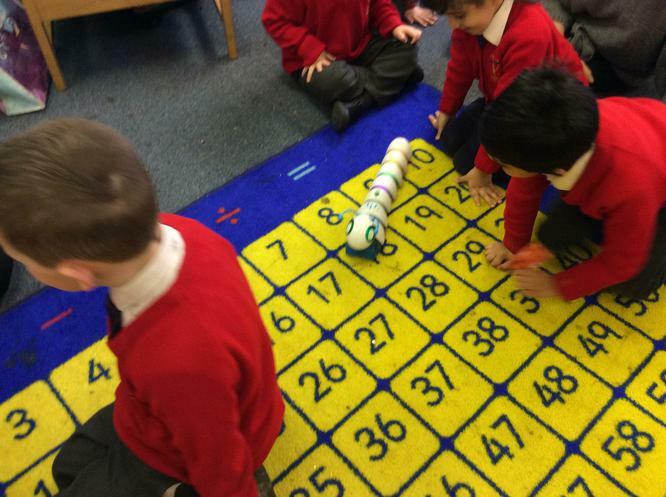 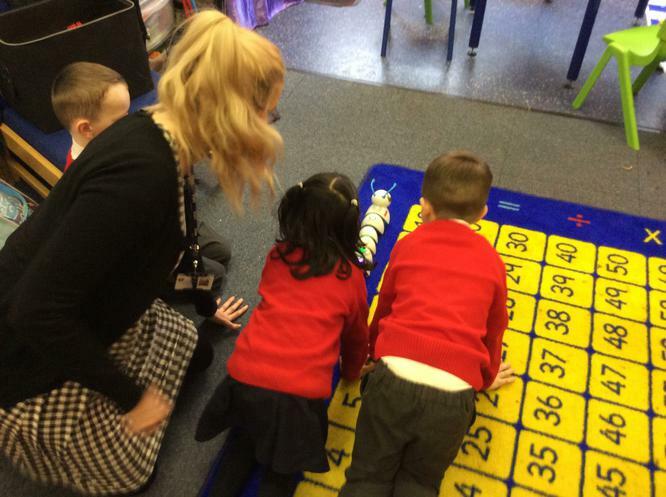 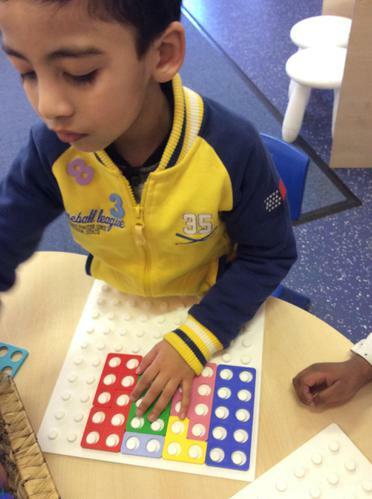 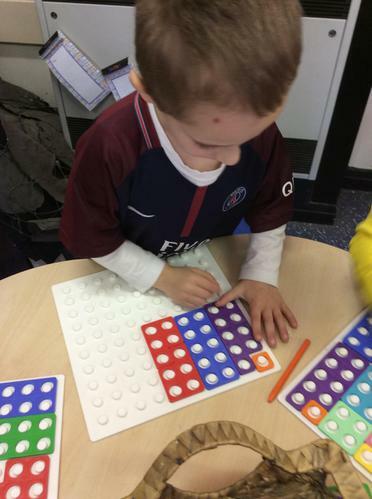 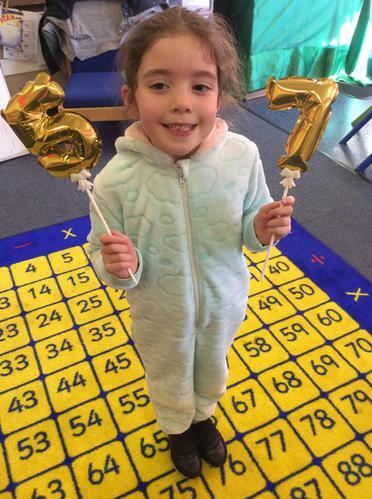 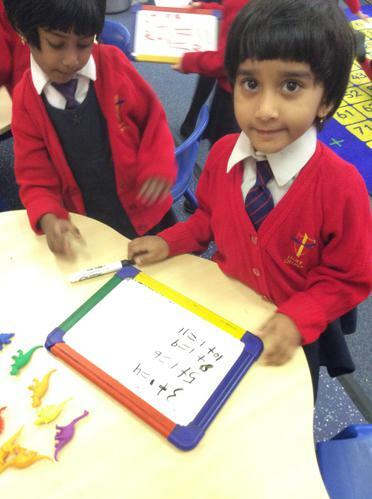 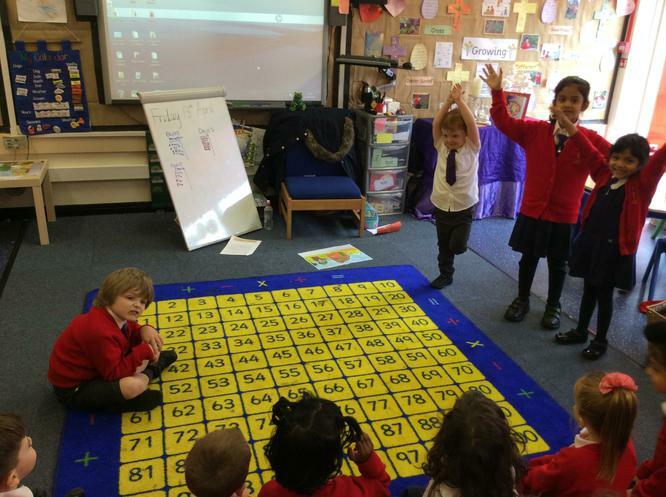 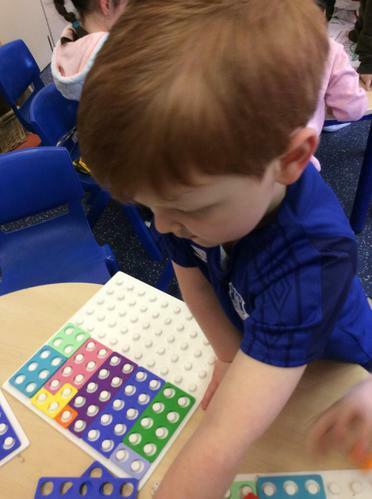 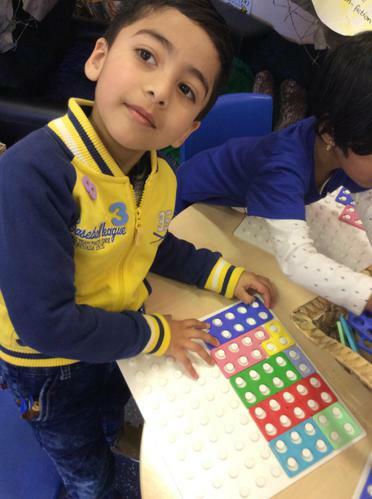 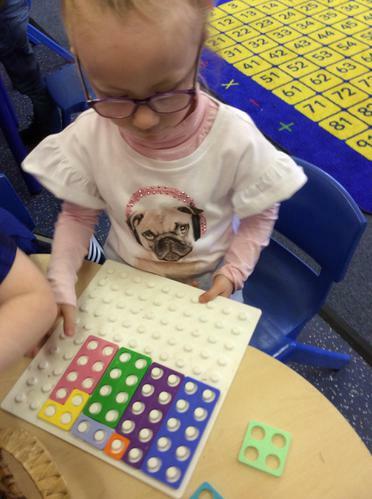 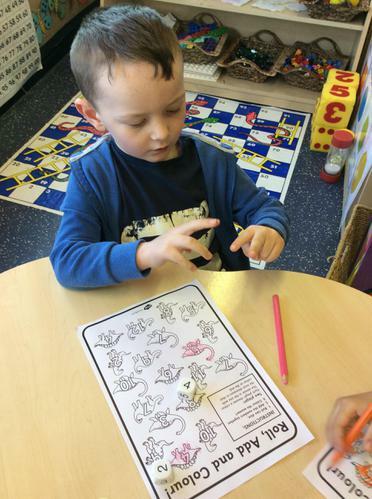 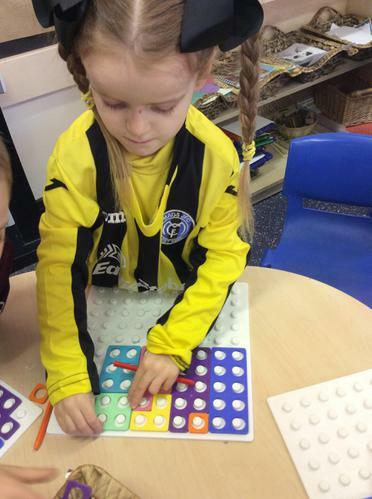 Counting with numbers to 100! 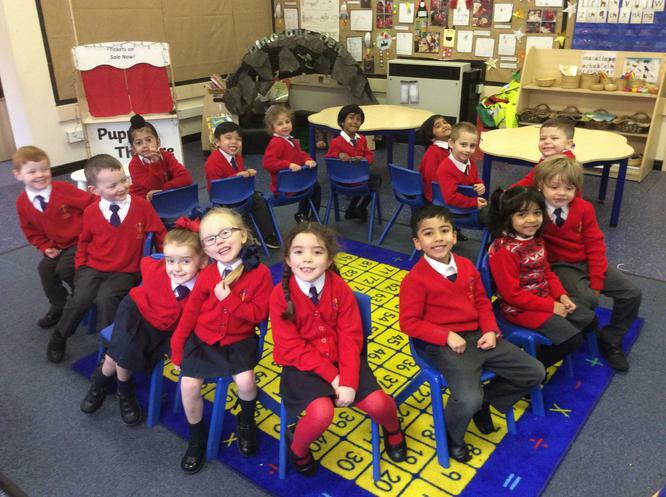 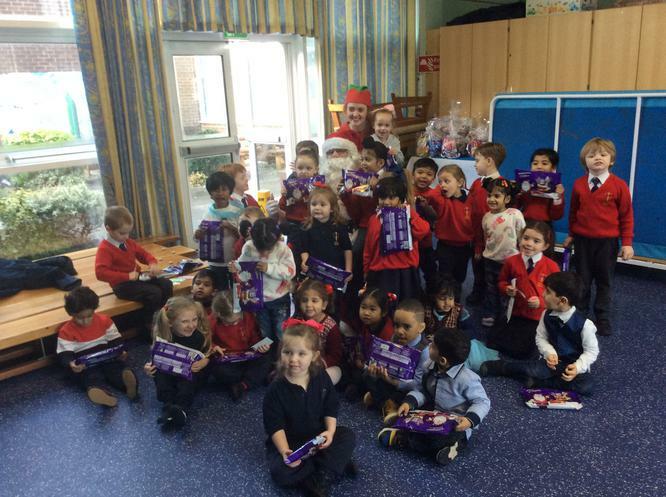 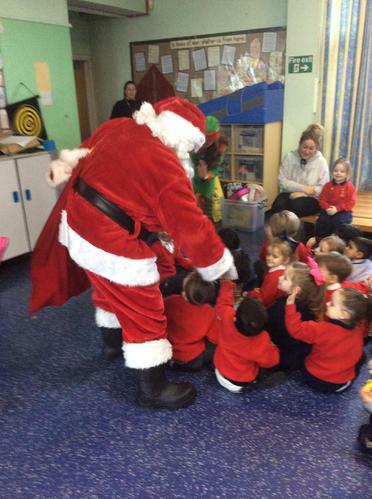 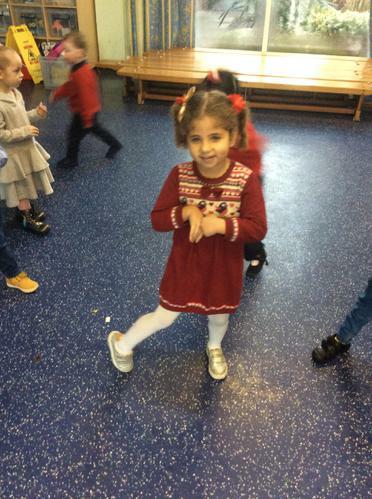 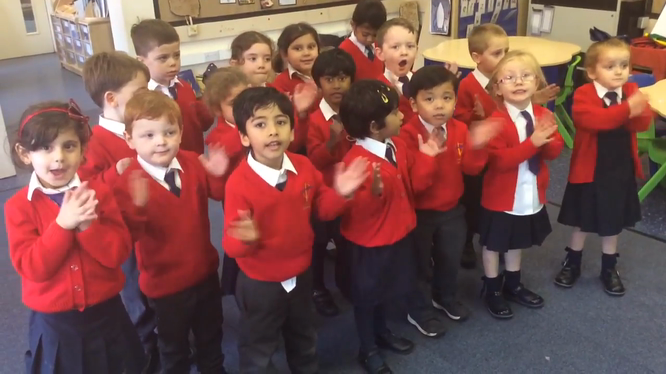 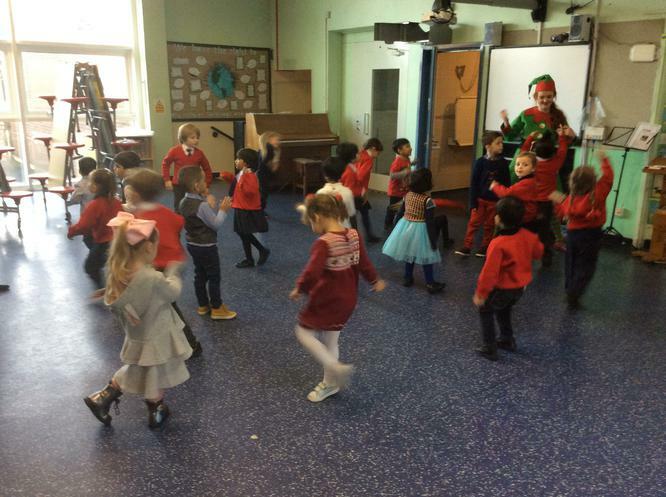 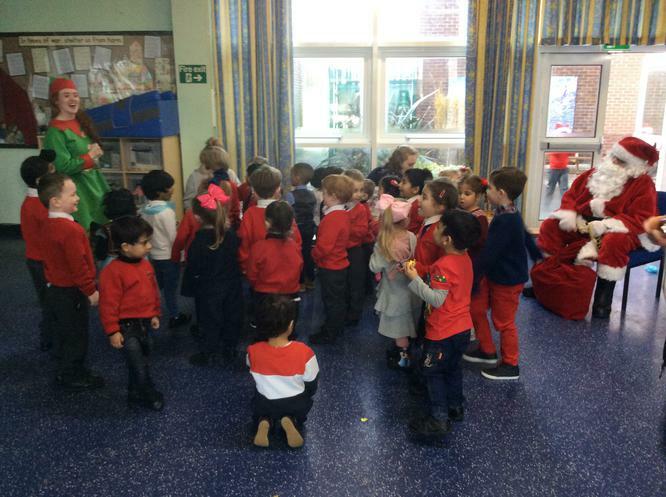 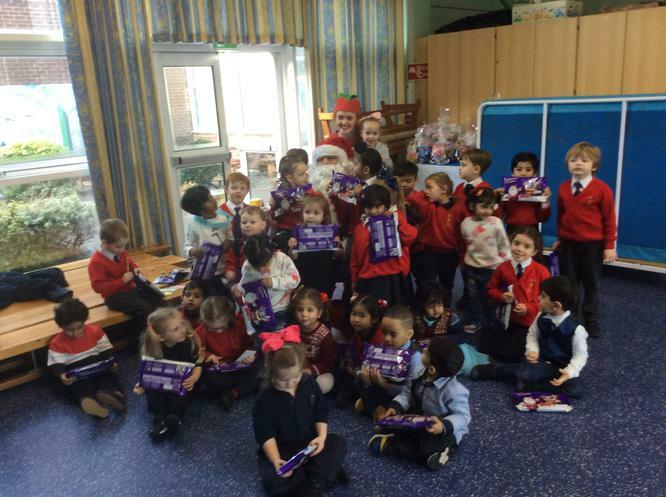 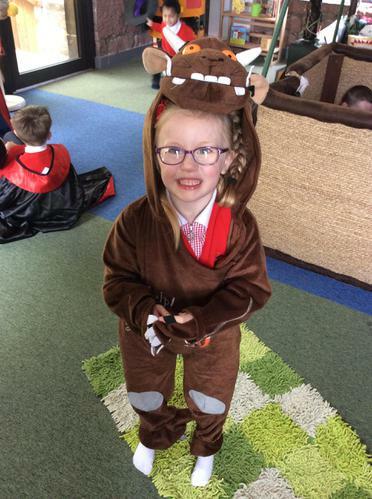 Merry Christmas from Reception and Nursery! 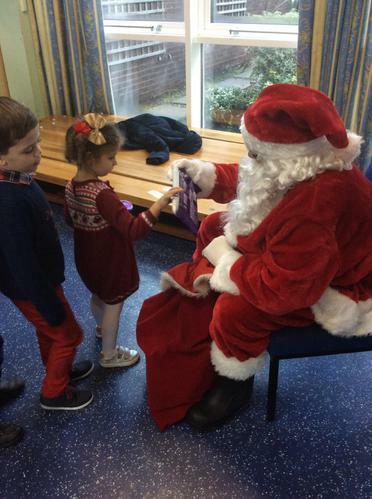 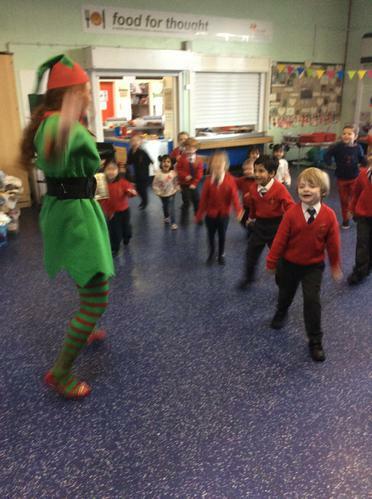 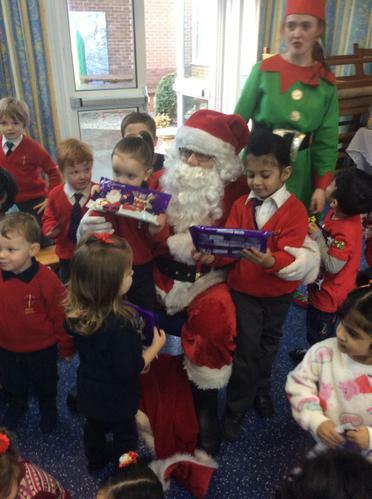 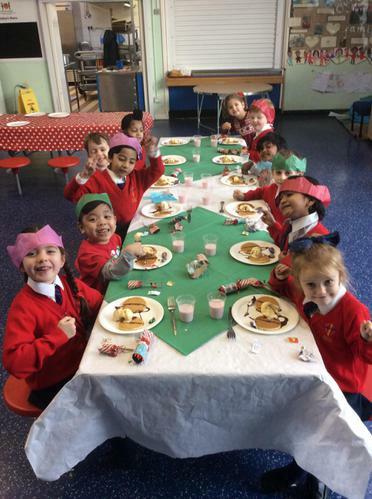 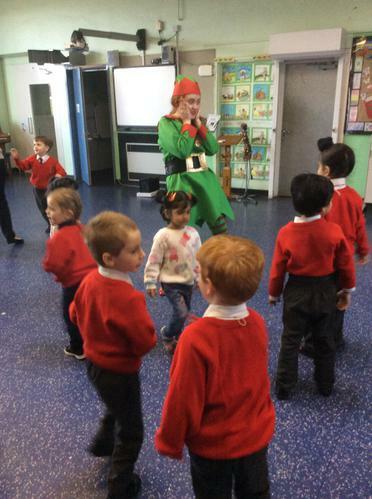 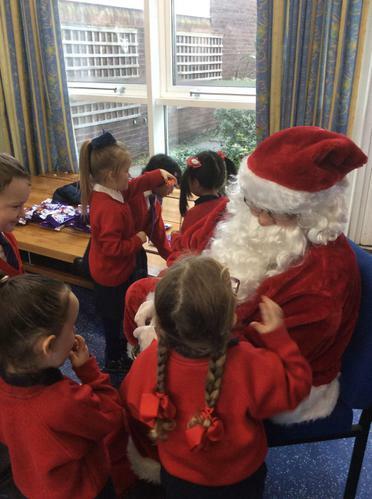 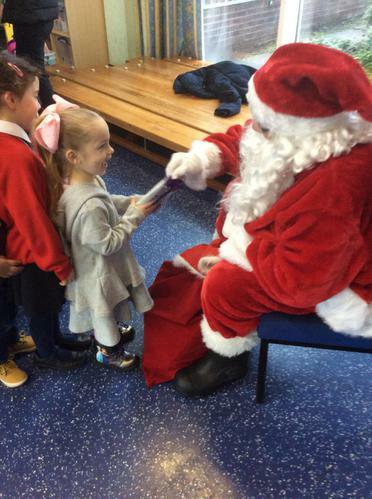 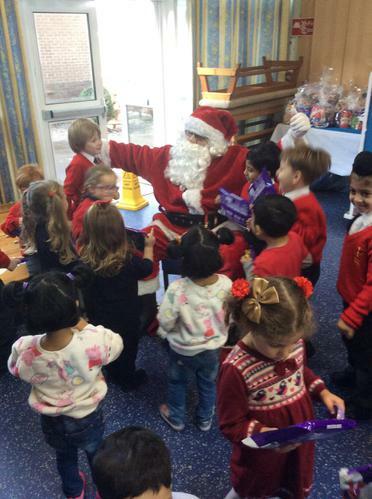 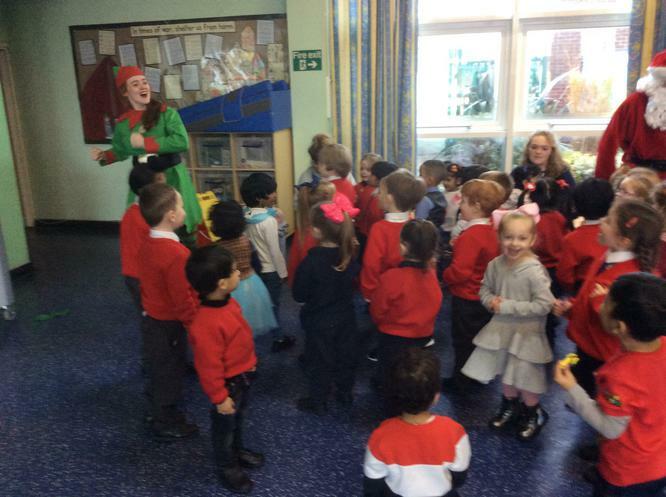 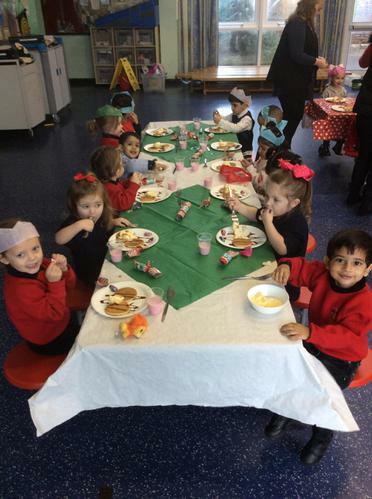 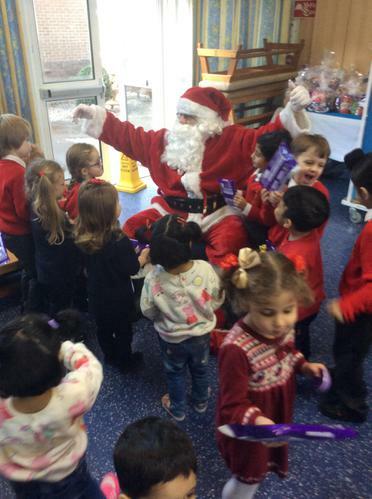 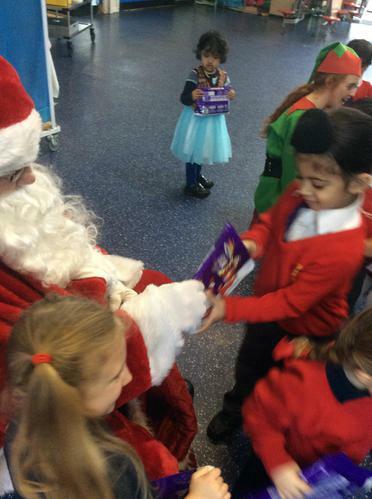 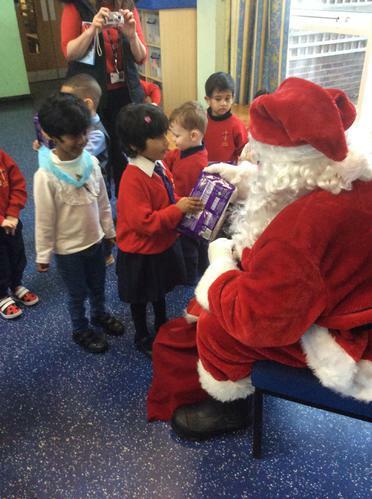 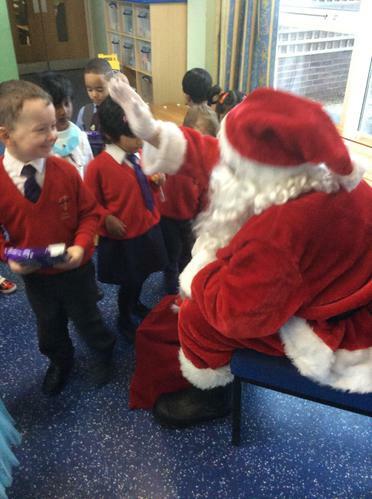 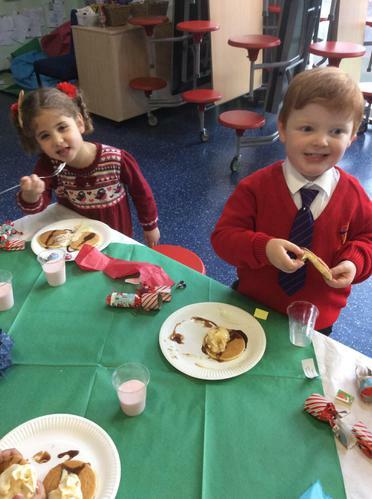 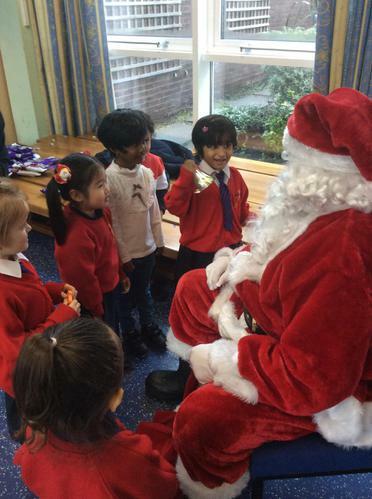 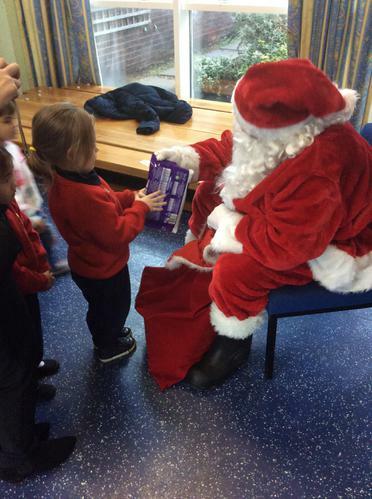 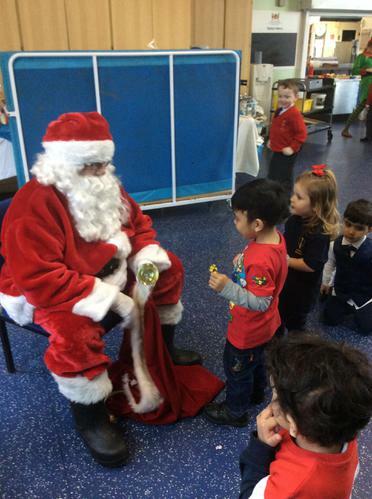 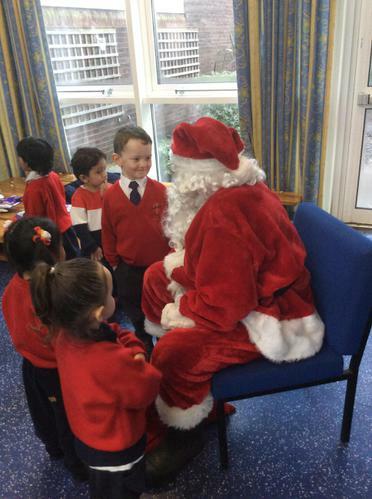 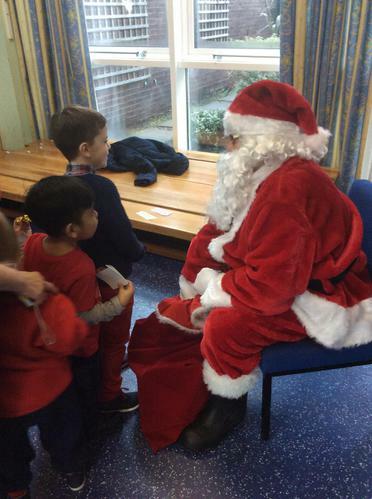 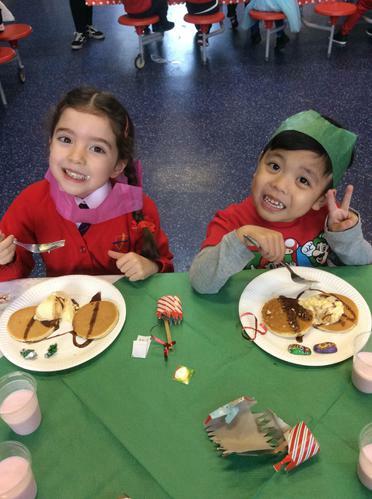 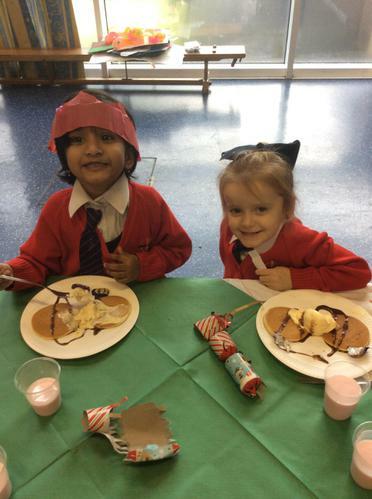 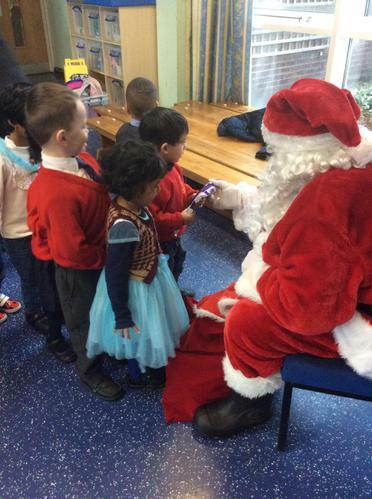 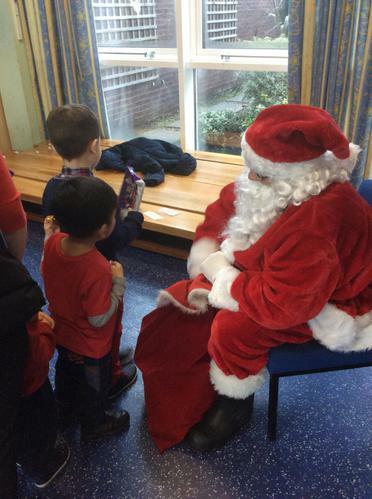 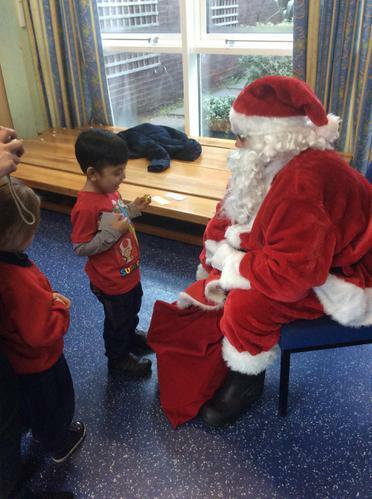 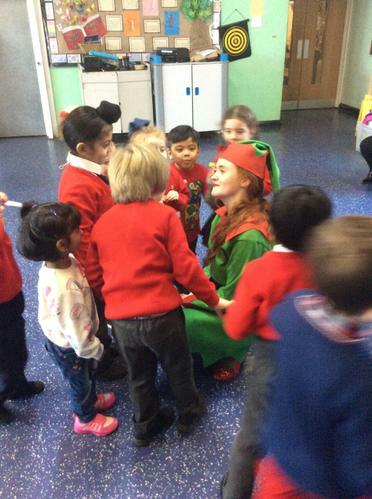 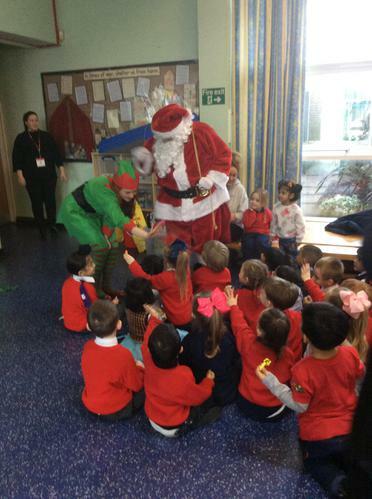 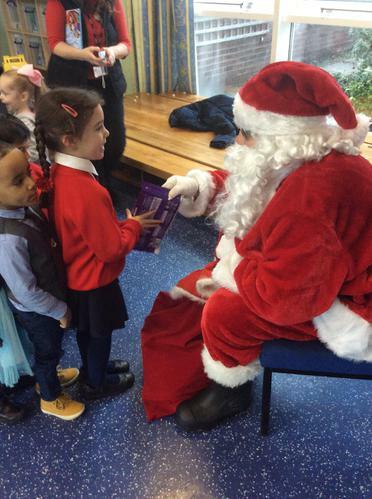 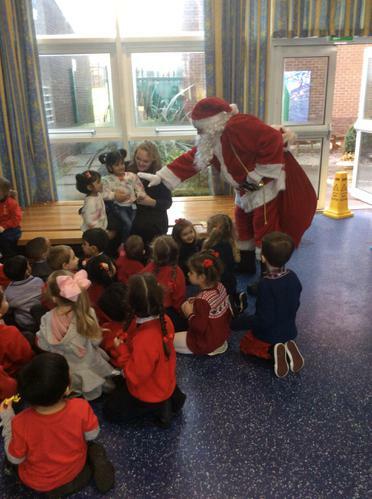 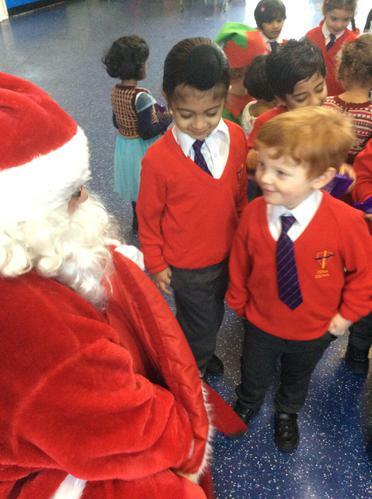 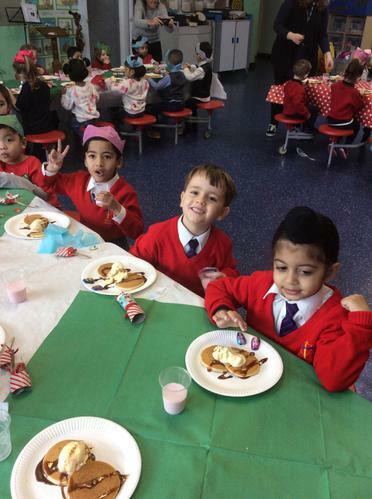 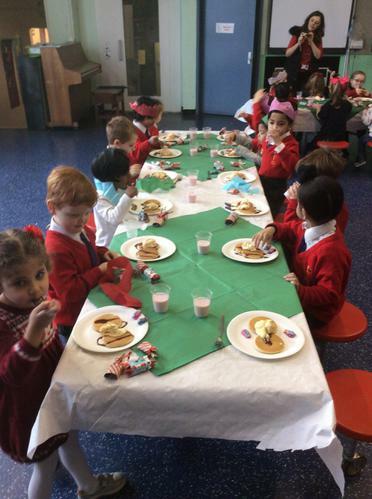 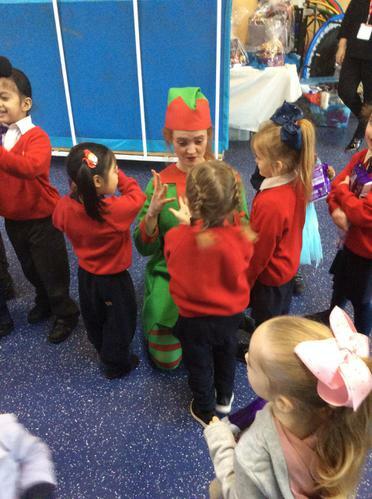 EYFS Christmas Breakfast with Special Guests! 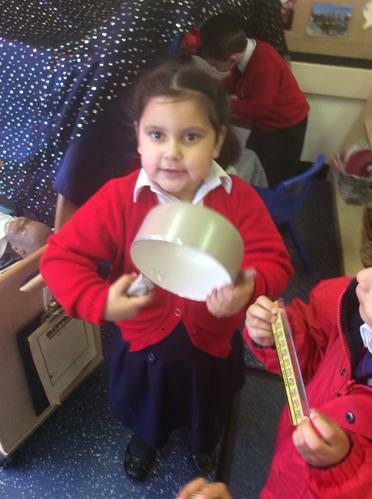 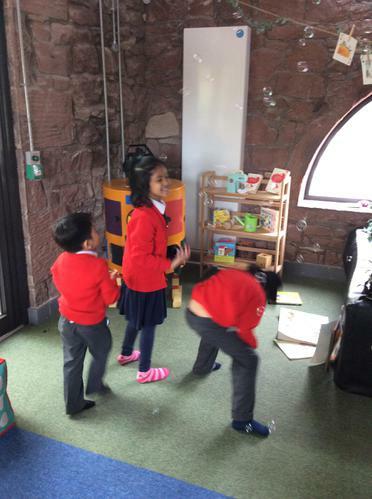 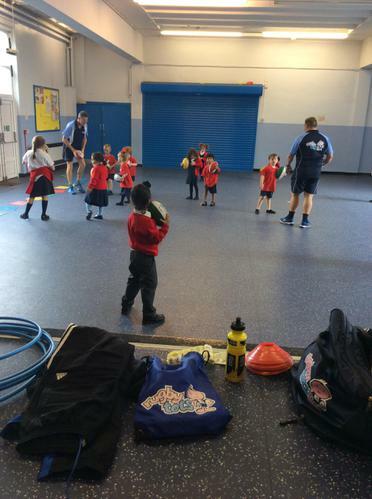 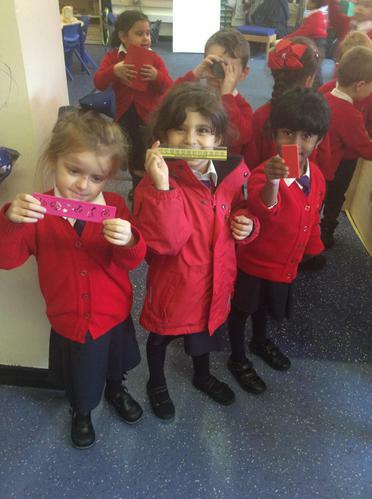 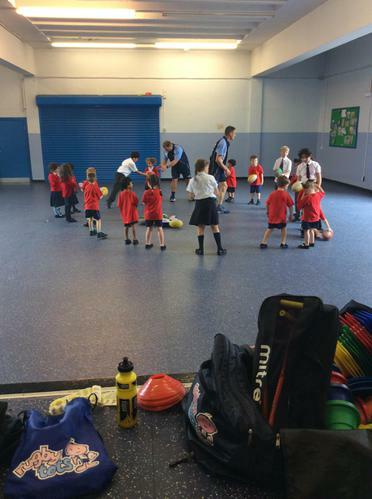 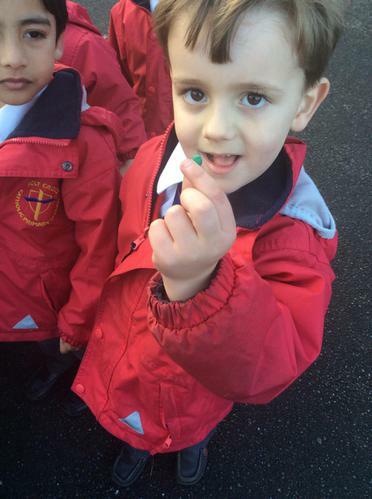 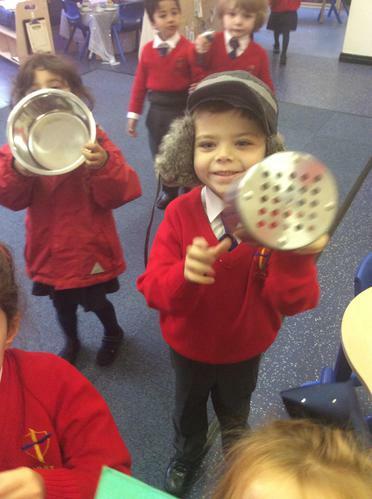 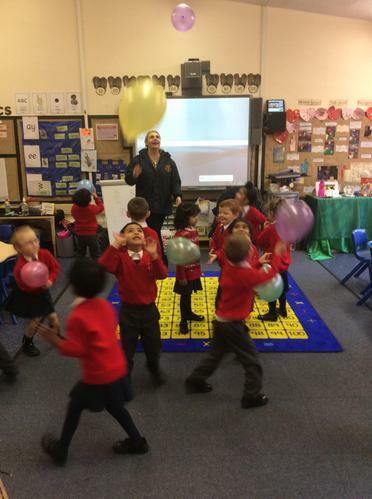 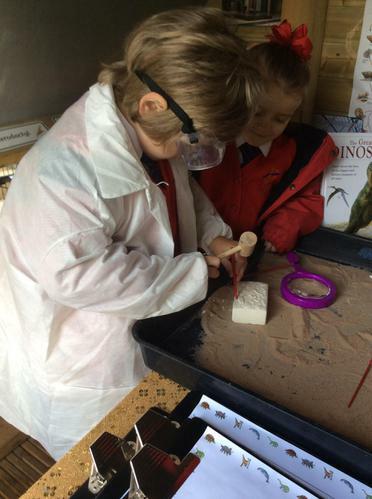 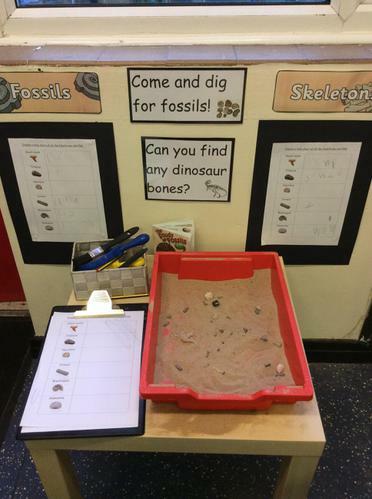 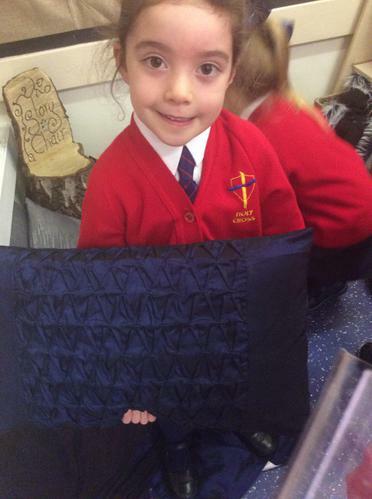 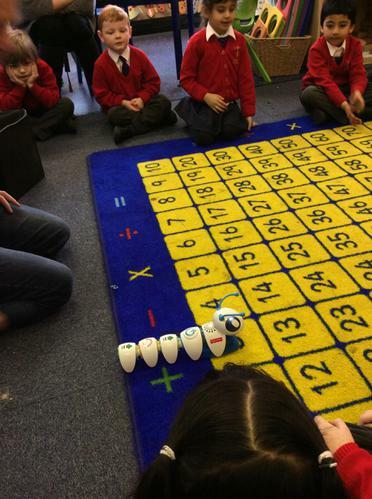 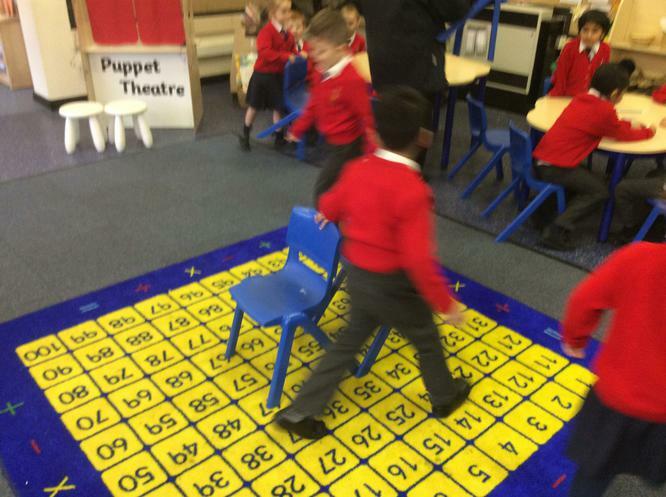 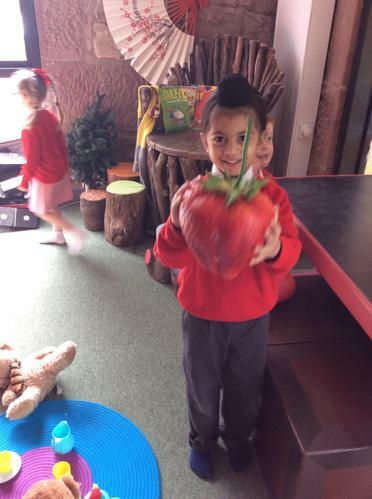 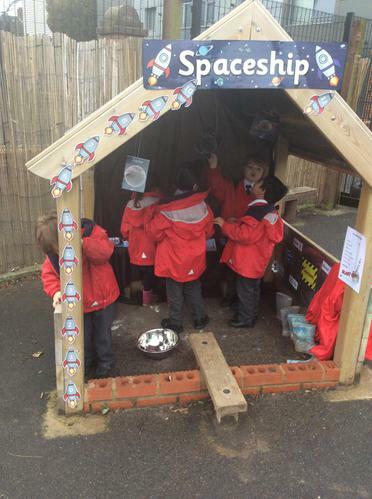 Reception have really enjoyed learning about Space. 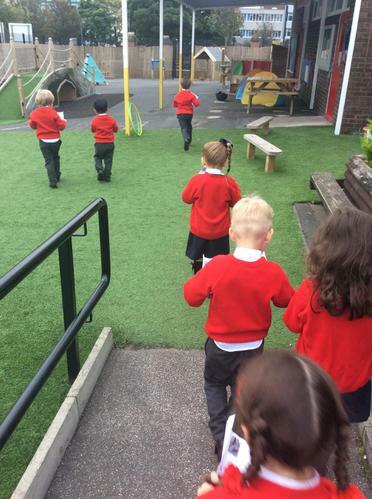 We used the story ‘Whatever Next!’ To begin to discuss the moon, how we would get there, what it would be like there and what we would bring to the moon with us. 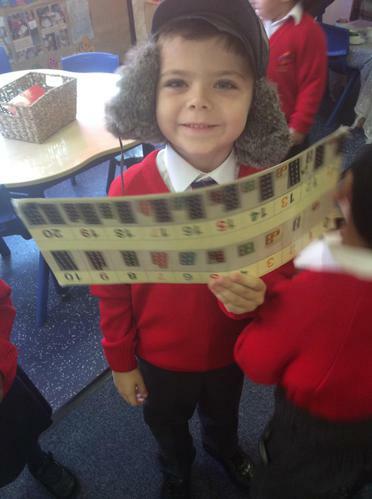 We made storymaps to help us remember the story, including all the things Baby Bear took to the moon with him. 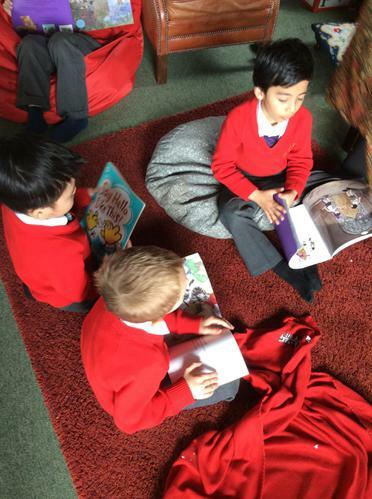 We have also read the story, ‘Aliens love Underpants’ and discussed the different types of aliens we could see throughout the story. 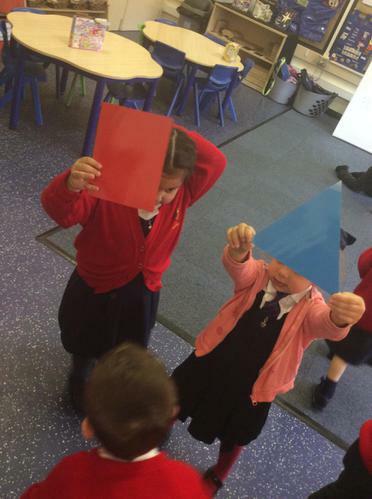 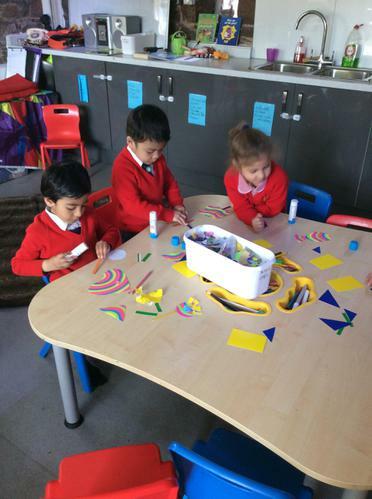 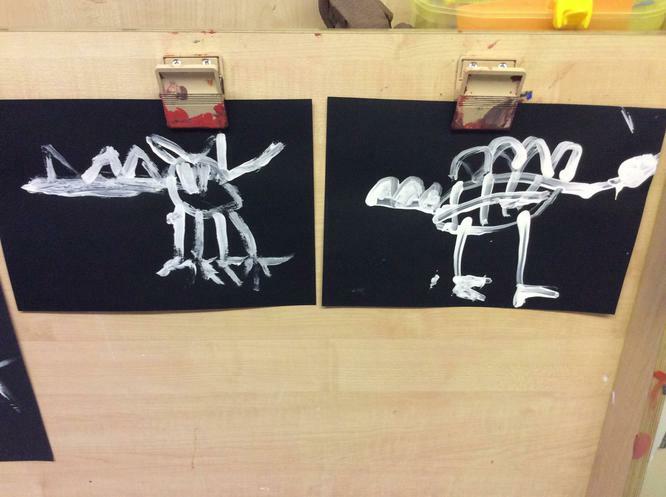 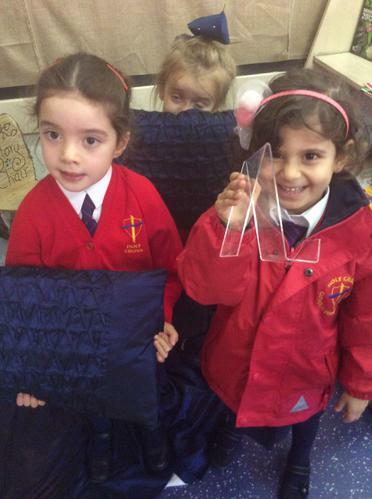 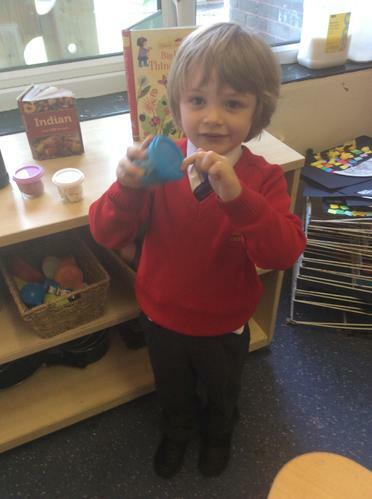 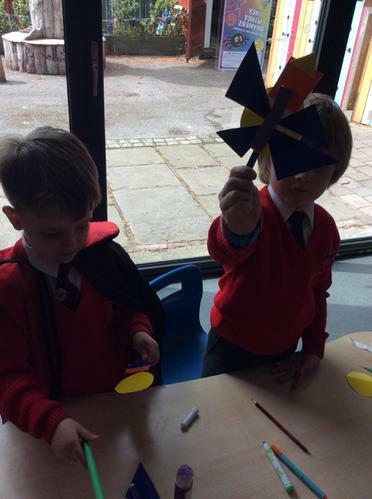 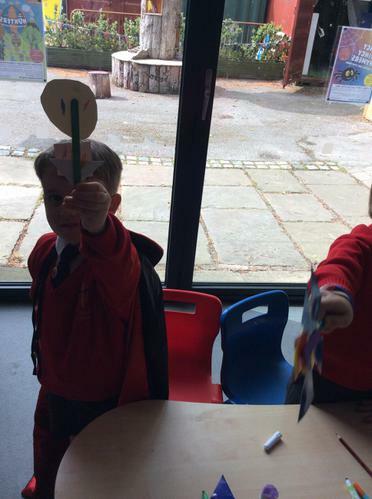 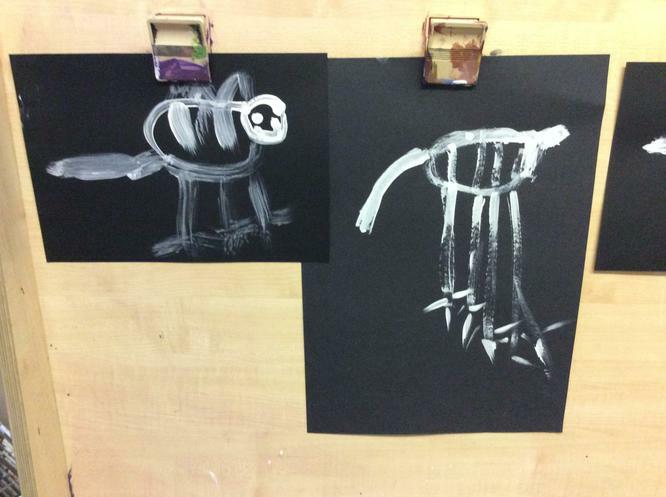 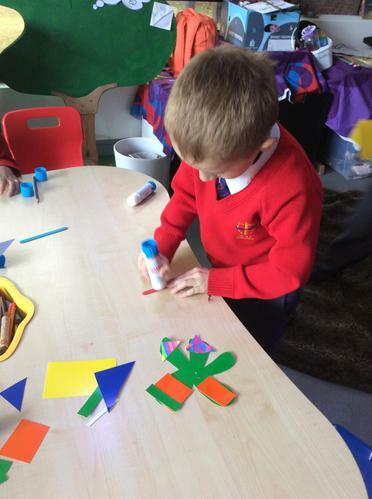 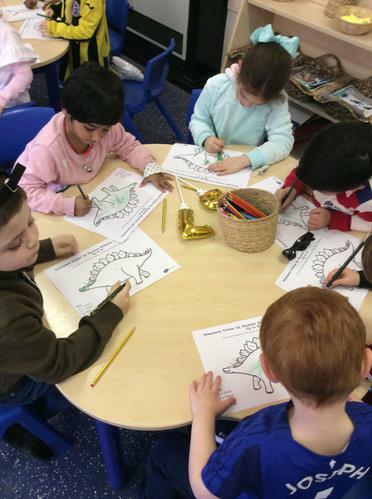 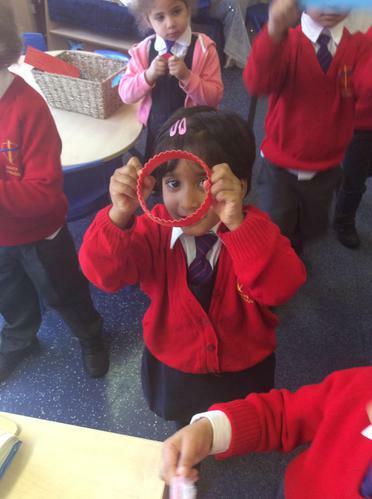 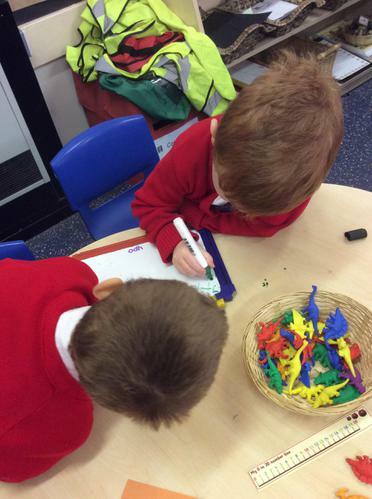 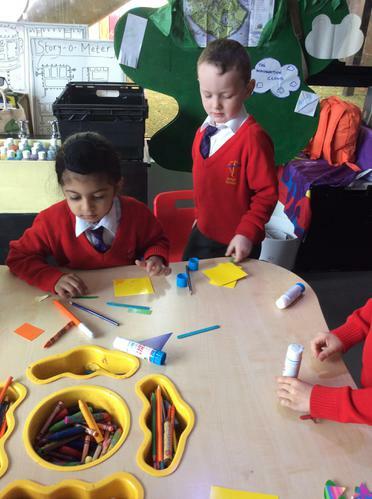 Reception then created their own aliens using 2D shapes and gave them an alien name. 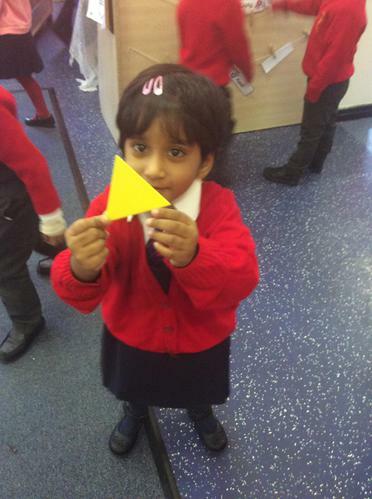 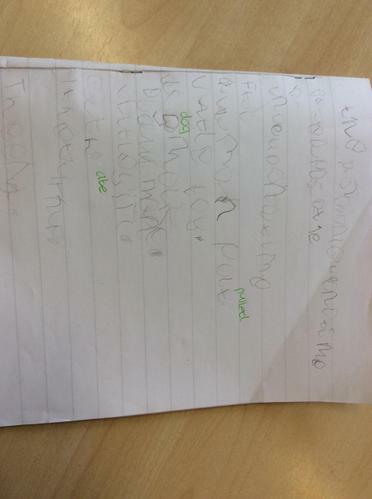 We also focused on the book, ‘How to Catch a Star’ and came up with our own plan on what we would use to catch a star. 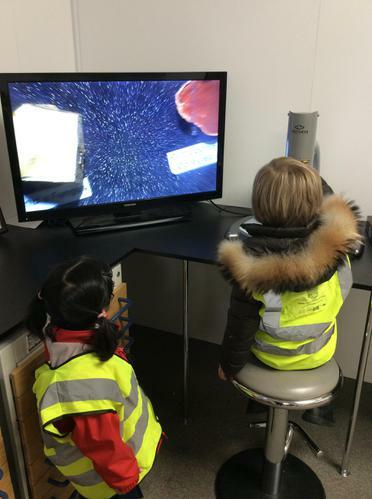 Finally we have written instructions on how we made our Space Fruit Cocktails! 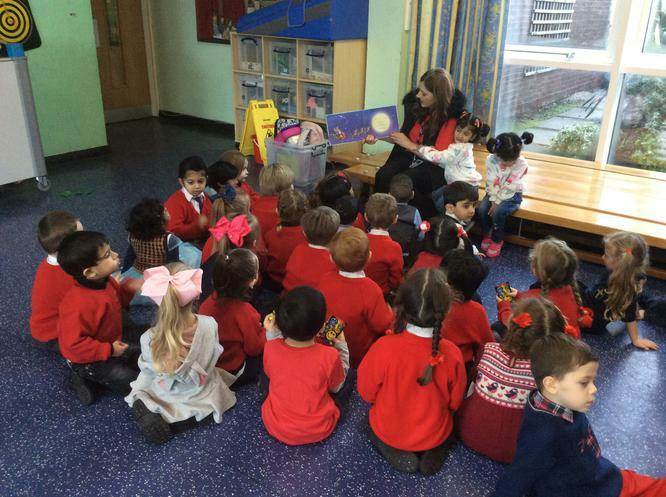 Reception loved exploring other Space themed stories such as, ‘Winnie in Space’, ‘Little Duck in the Moon’ and ‘On the Moon’. 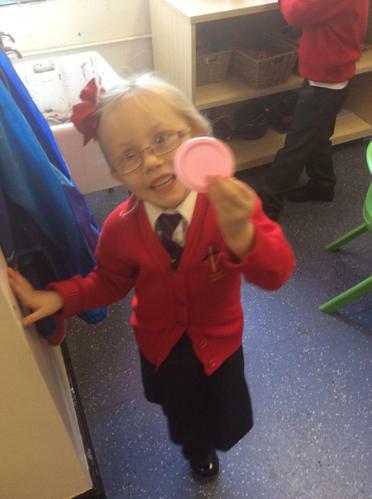 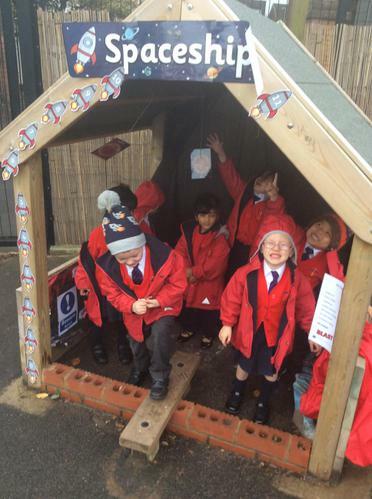 We have been learning all about Space! 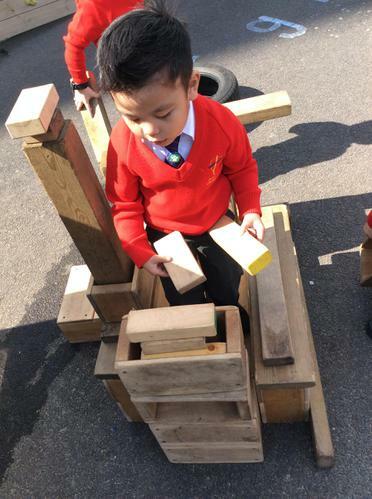 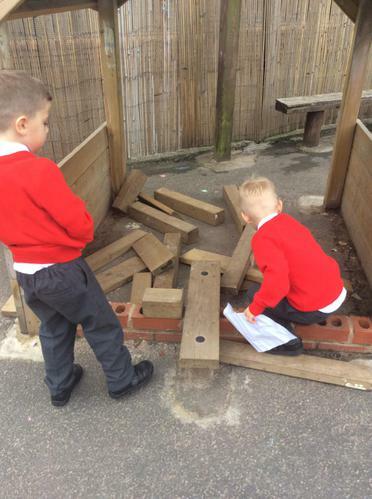 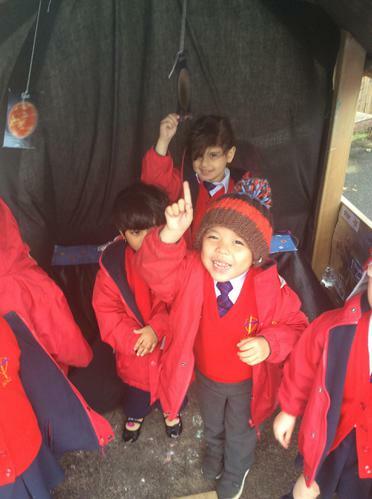 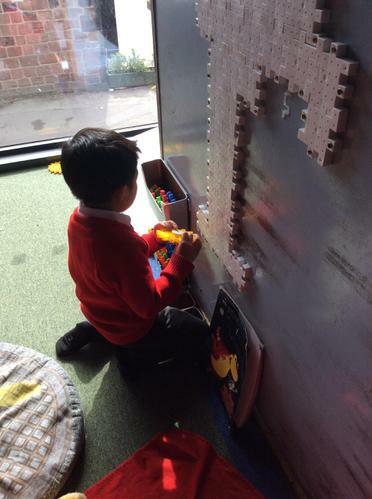 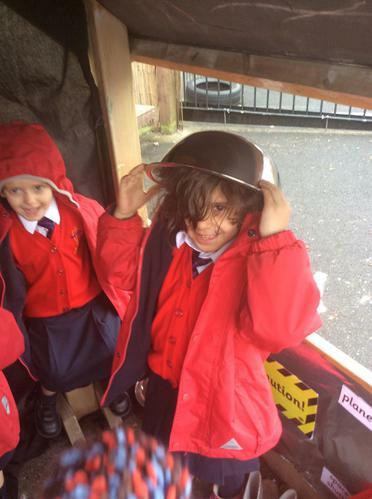 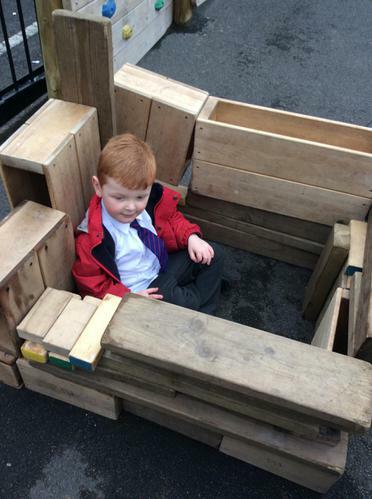 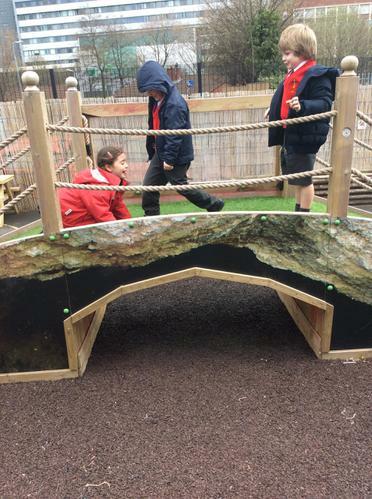 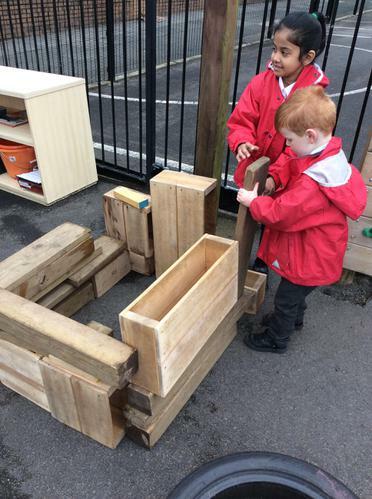 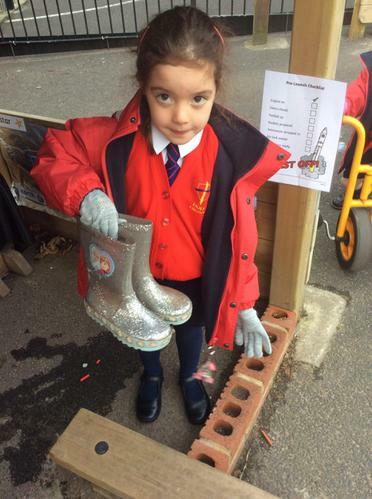 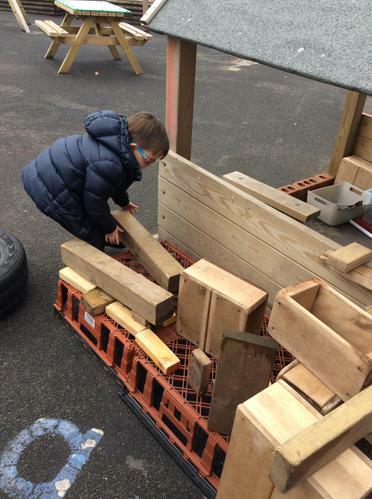 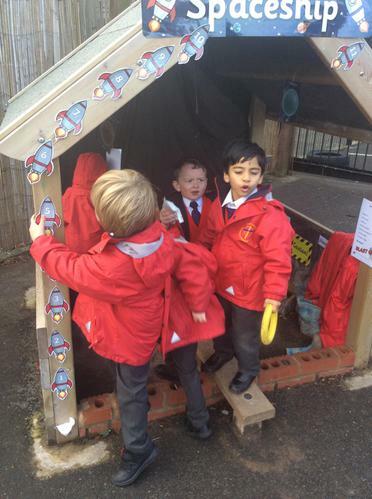 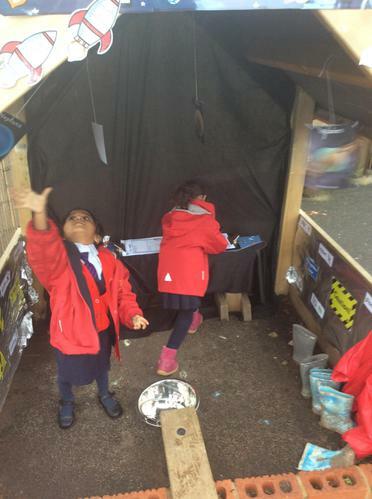 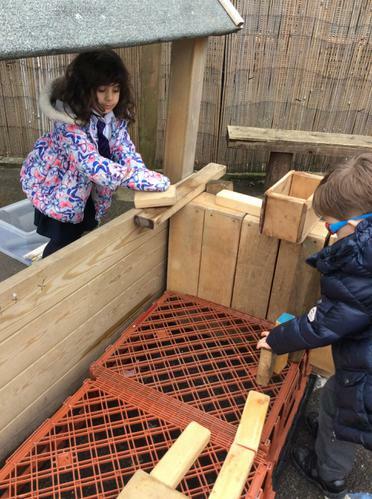 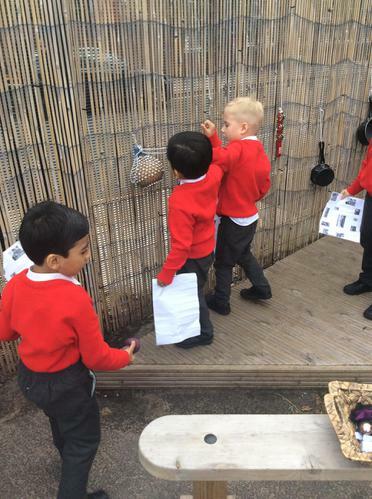 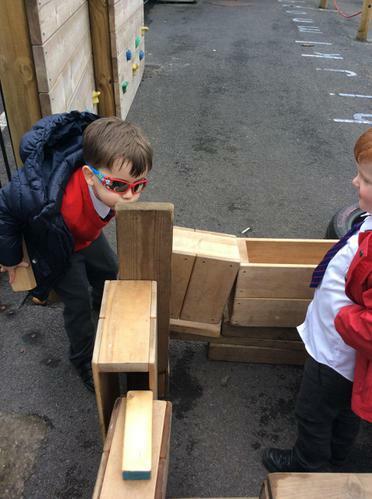 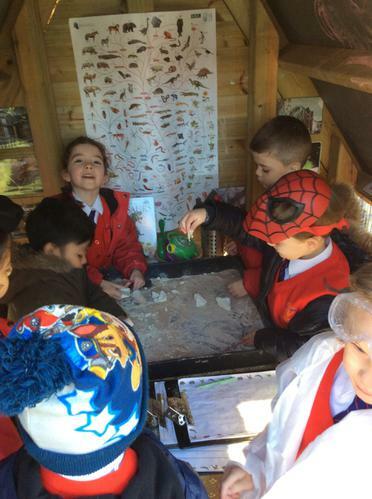 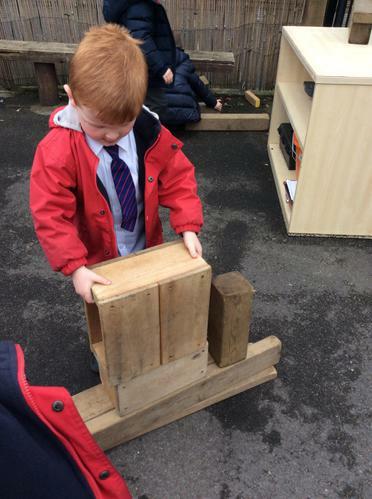 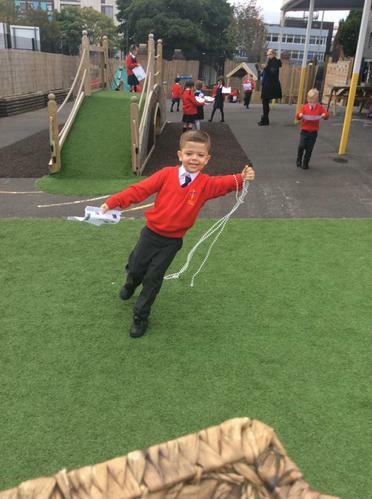 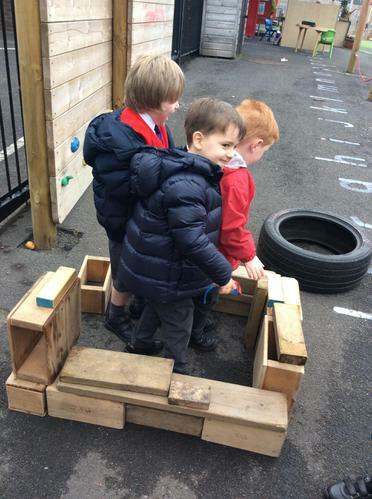 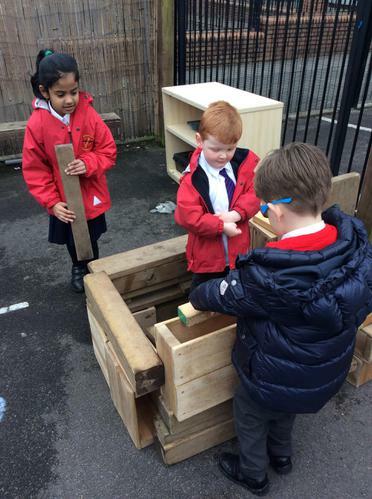 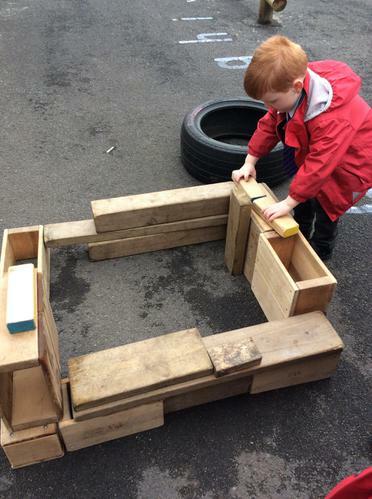 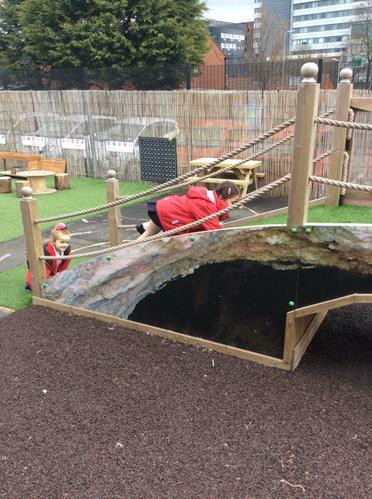 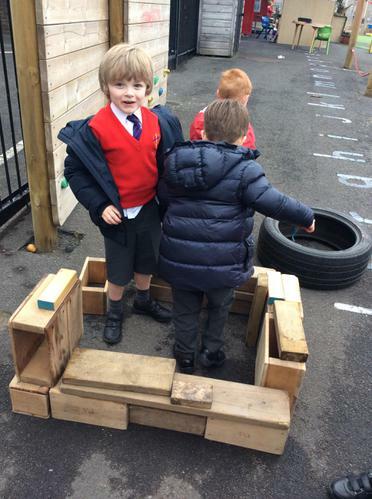 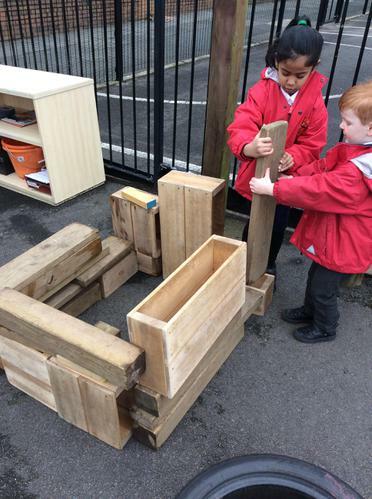 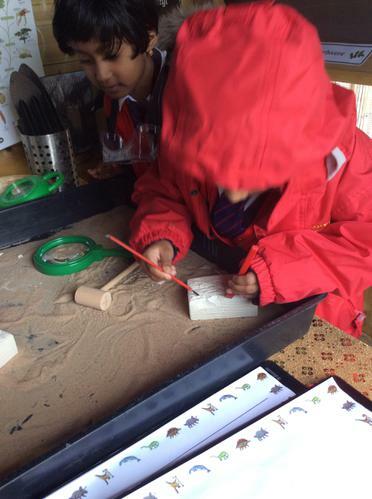 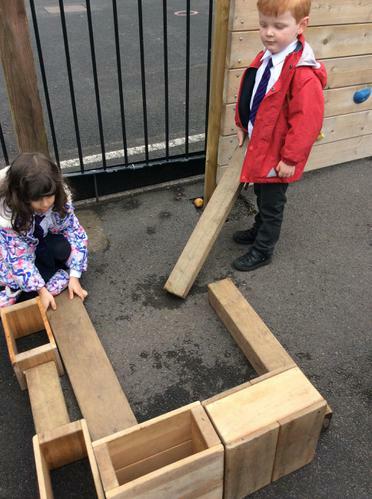 One day, a Spaceship landed in our outdoor area! 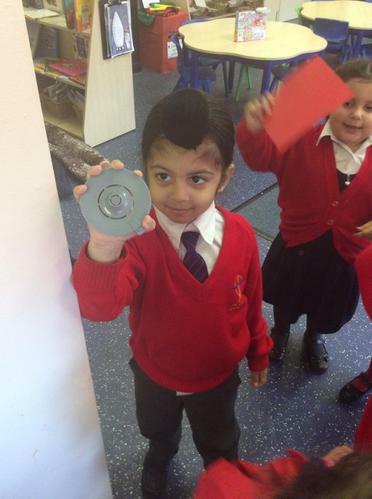 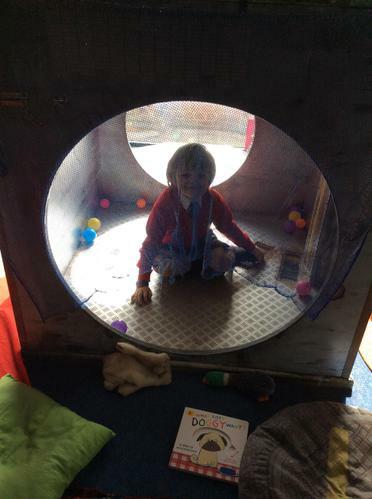 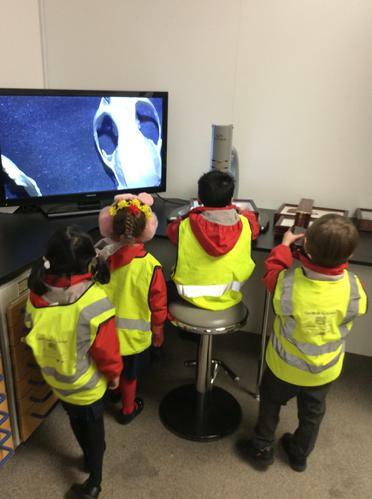 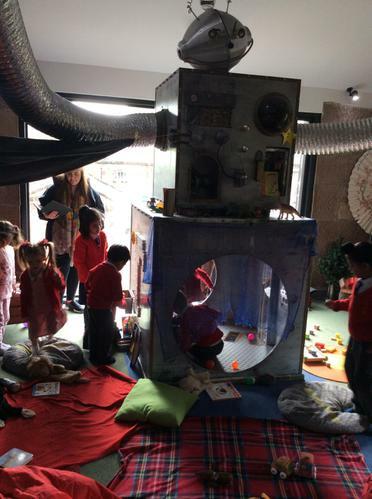 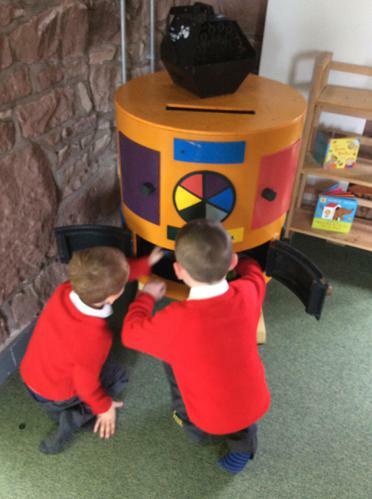 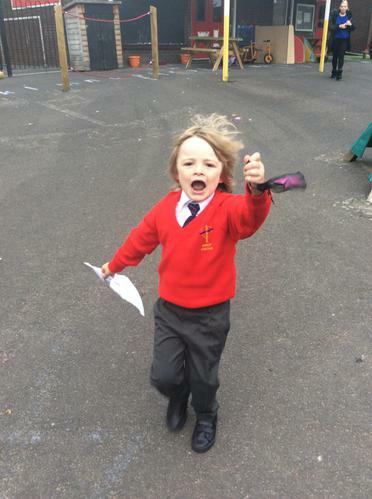 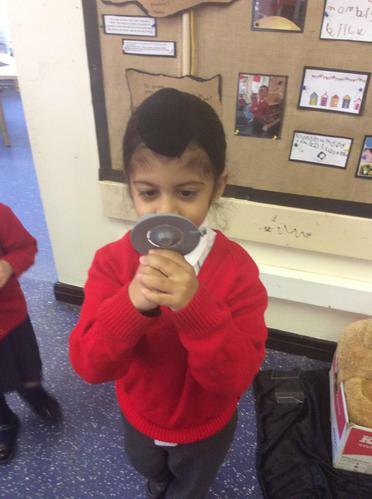 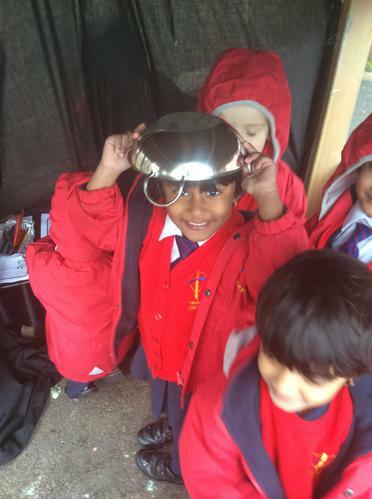 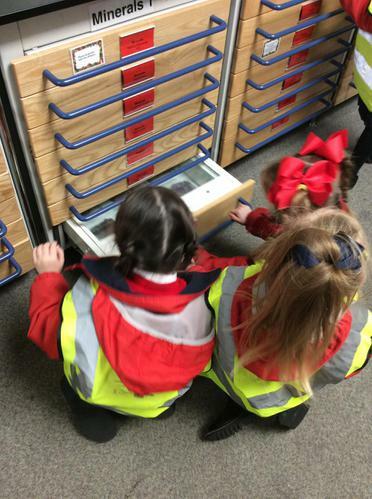 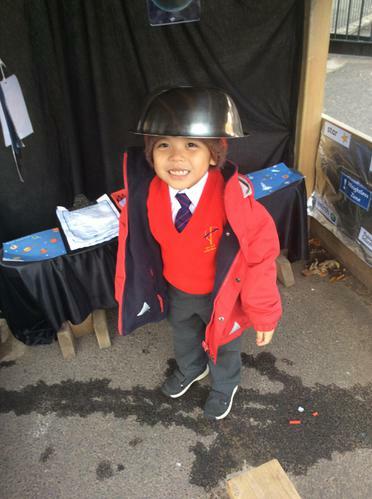 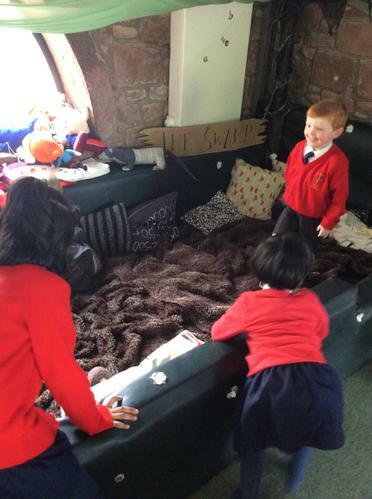 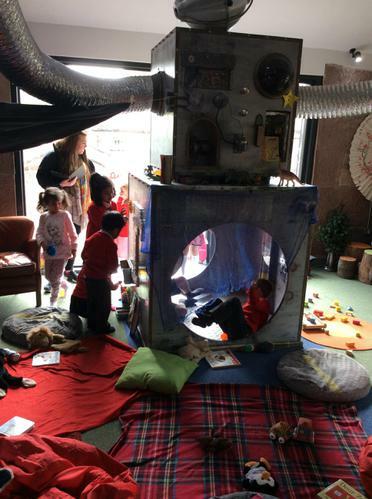 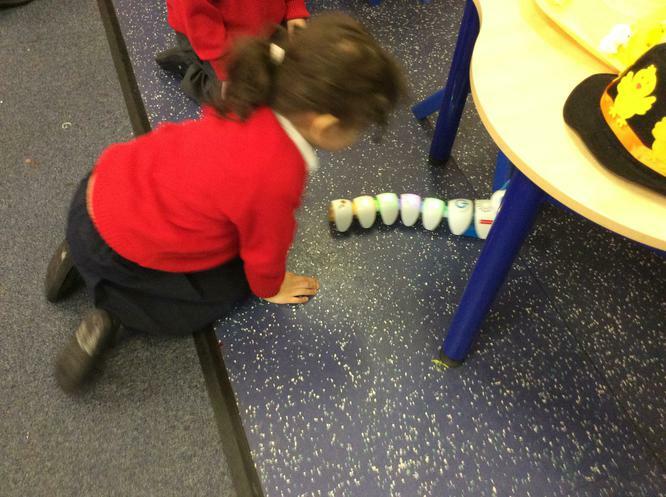 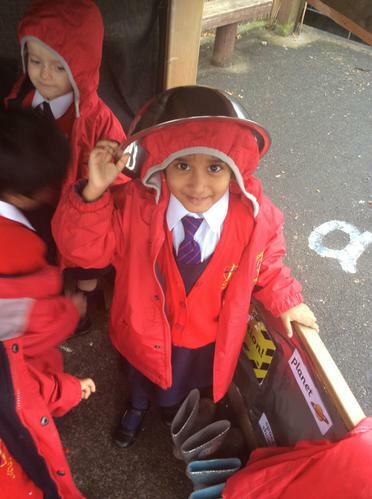 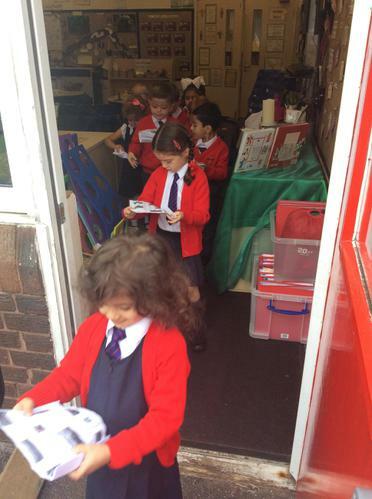 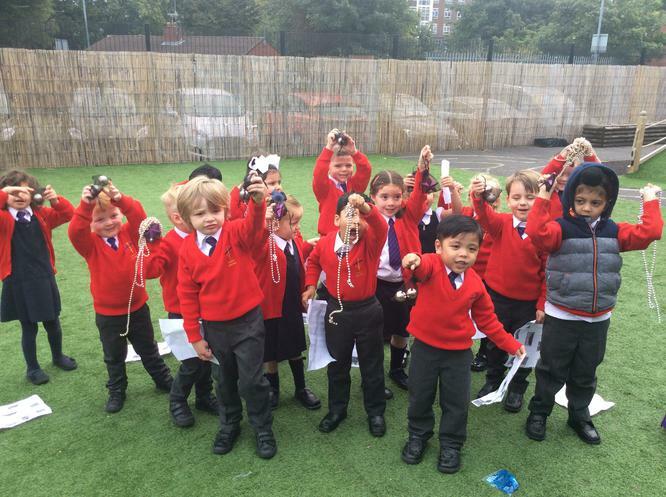 Reception loved exploring the spaceship, dressing up as astronauts, searching for aliens and recording their findings. 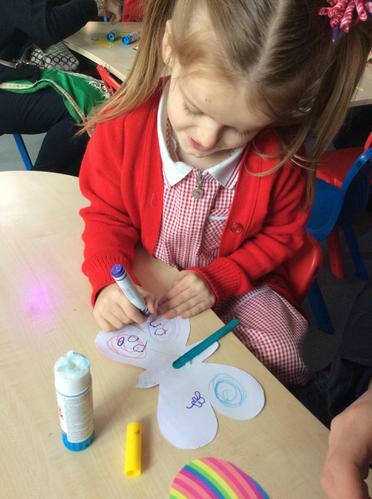 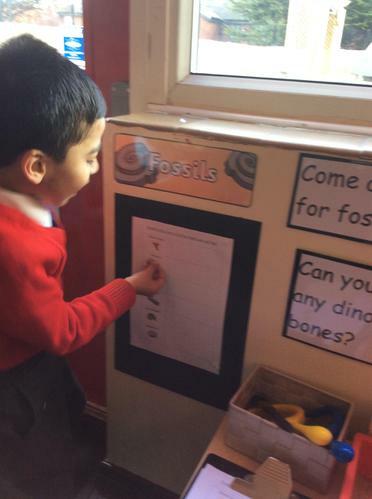 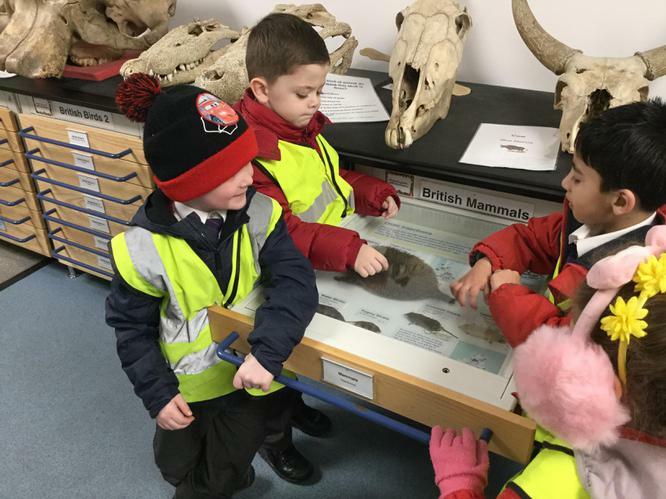 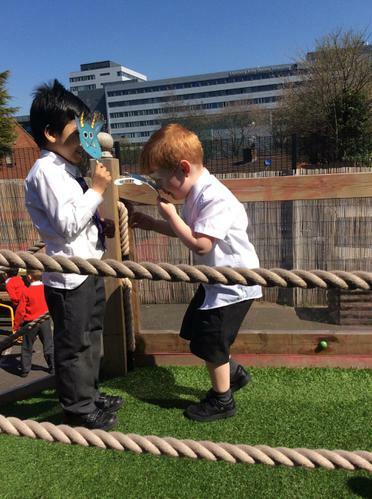 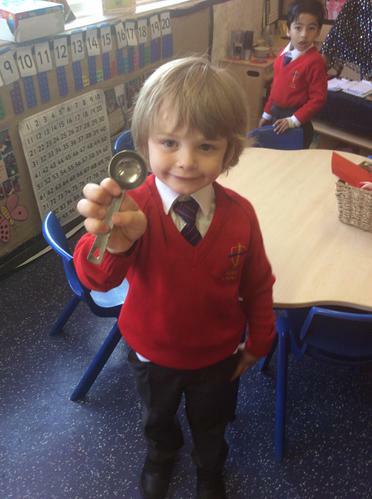 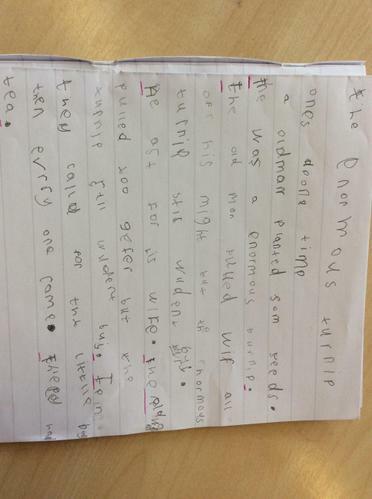 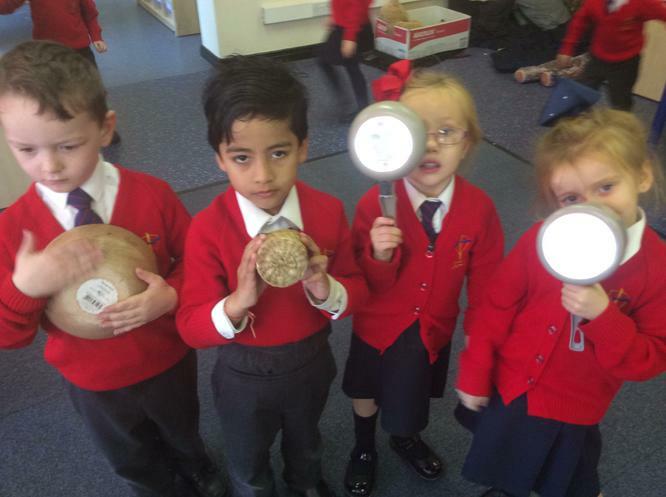 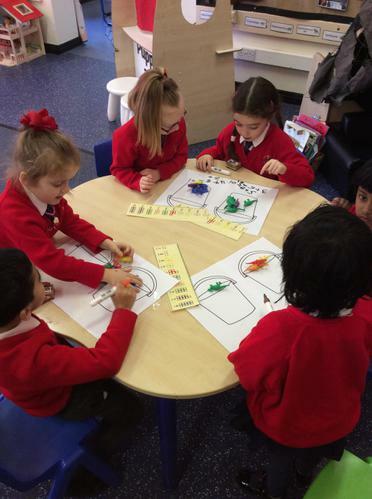 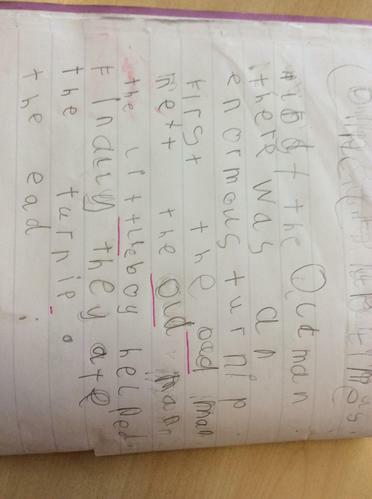 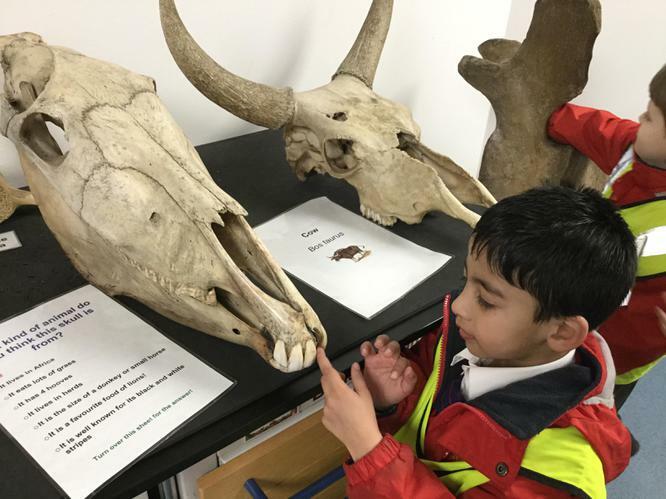 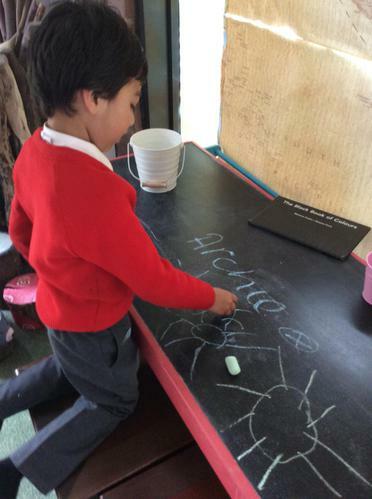 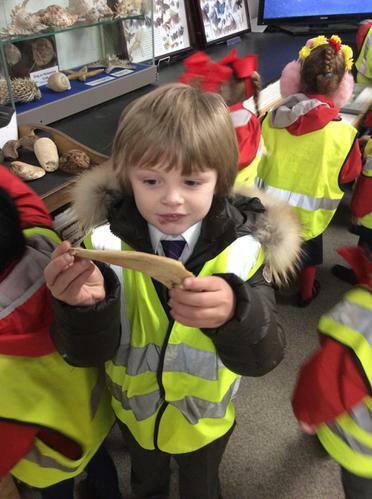 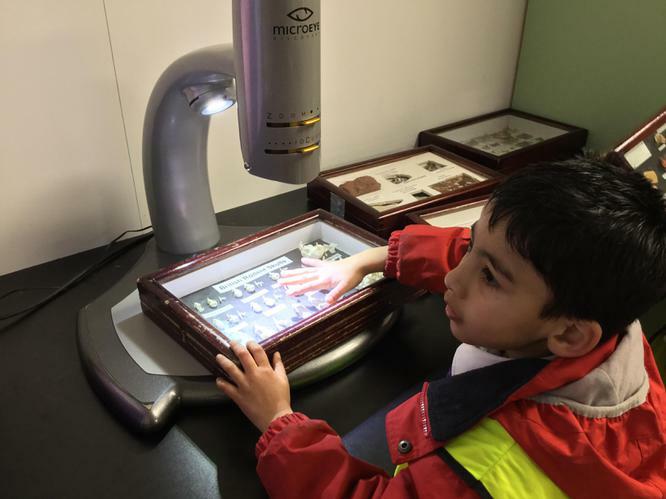 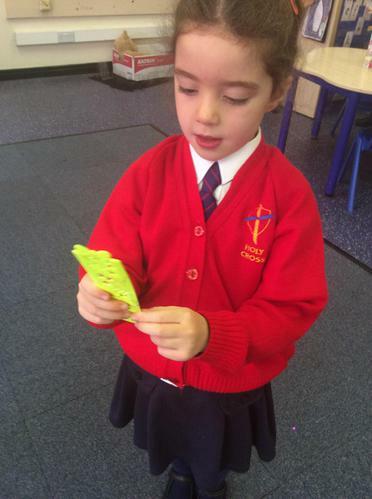 Reception used their imaginations to describe all the different kinds of aliens they saw. 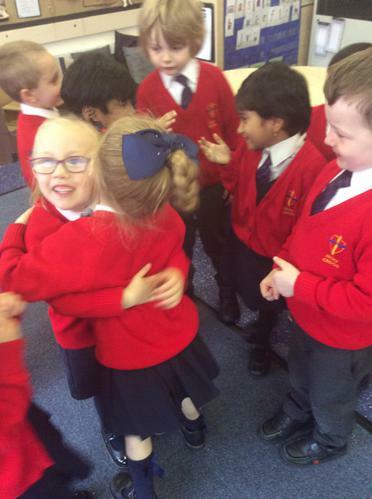 As part of our Come and See topic on ‘New Beginnings’, we have been learning about the sacrament of Baptism. 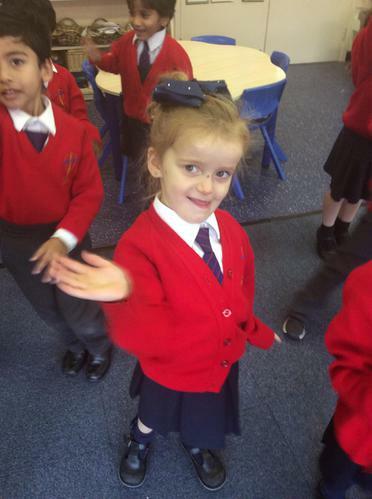 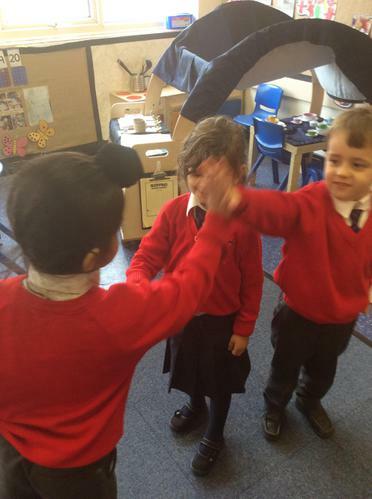 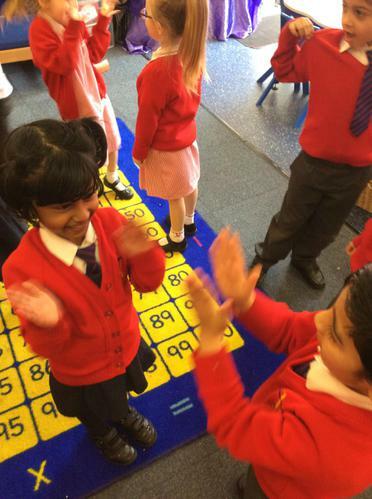 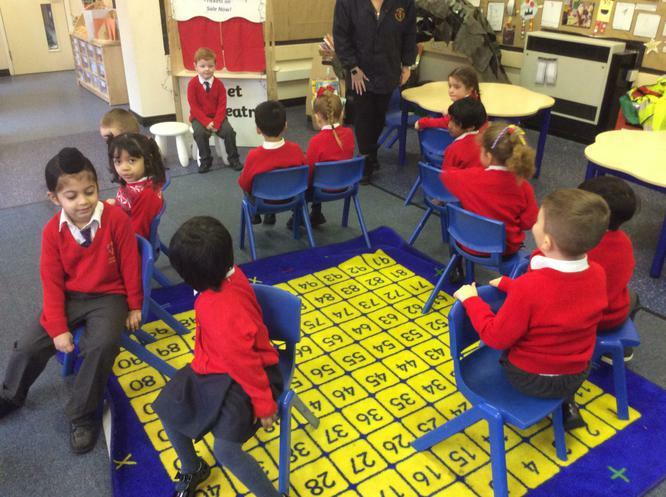 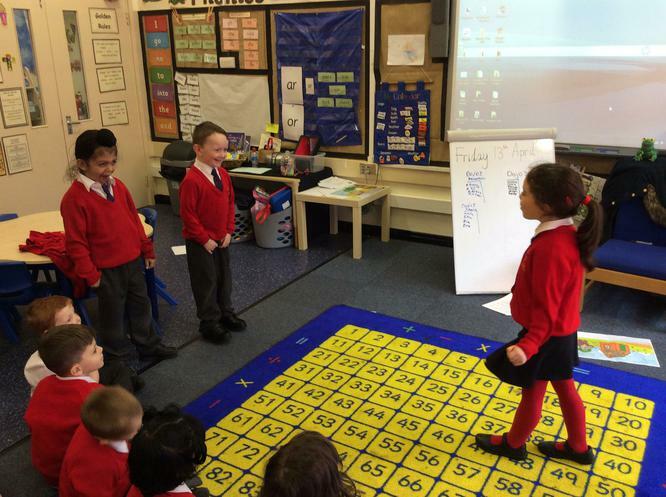 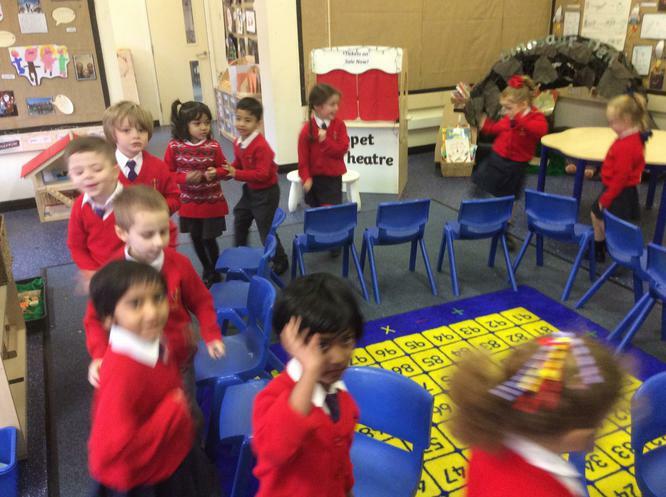 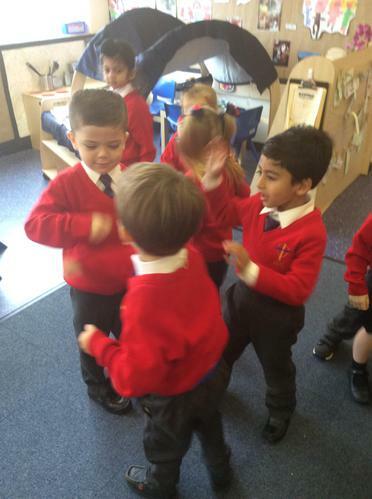 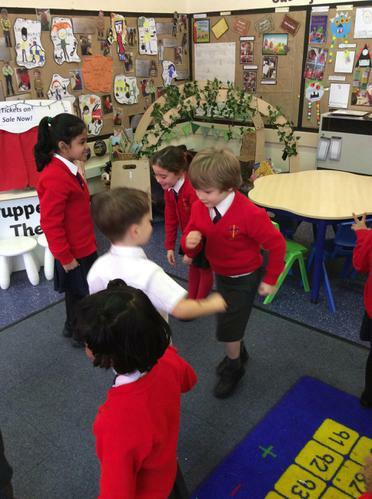 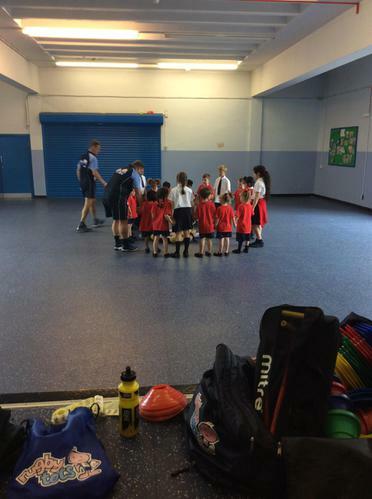 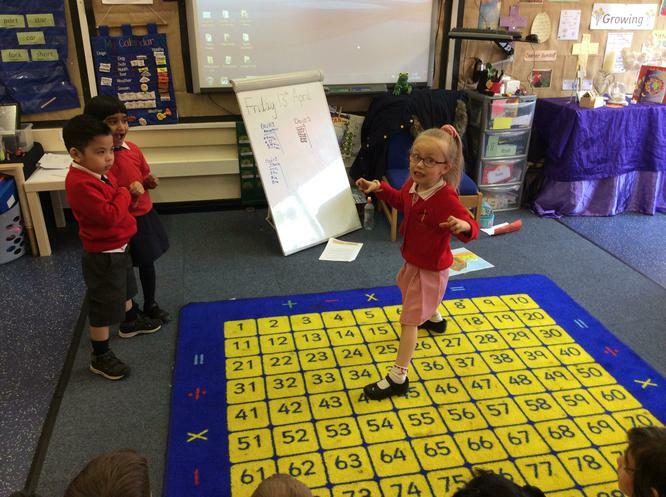 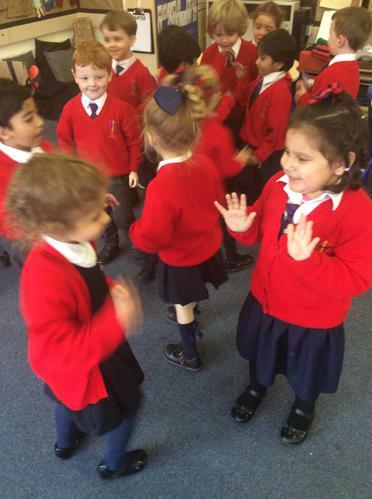 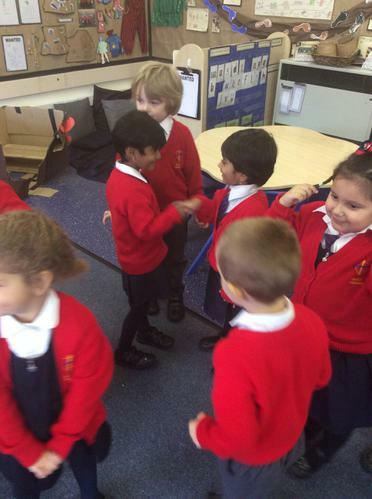 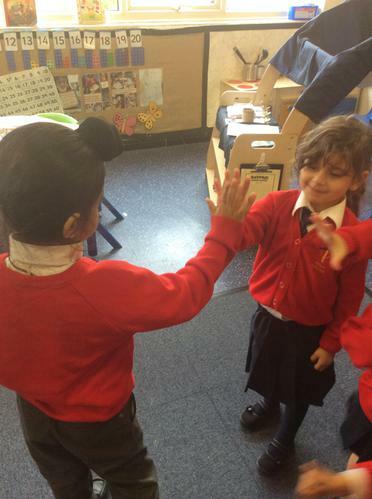 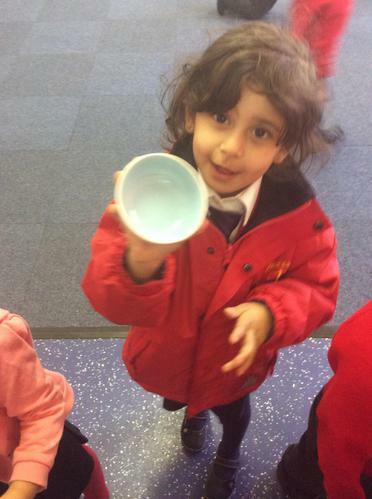 Reception enjoyed sequencing and role-playing their own baptism in class. 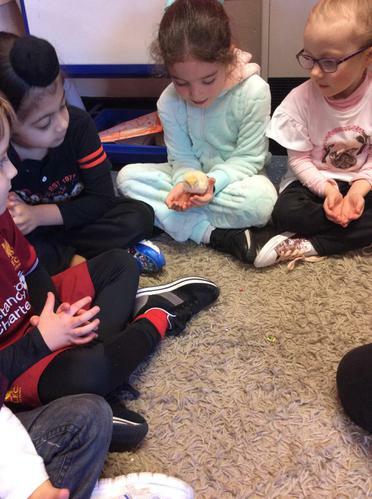 First we named our baby and chose Godparents. 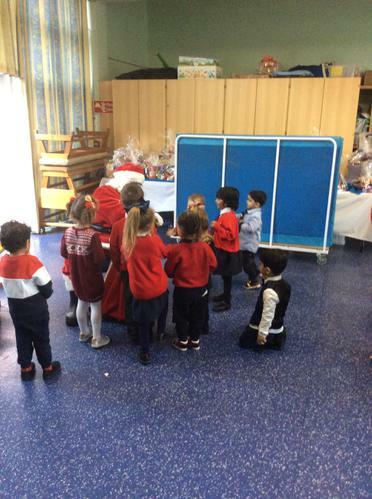 Next, the Priest blesses the baby with Holy Water and wraps them in a white garment. 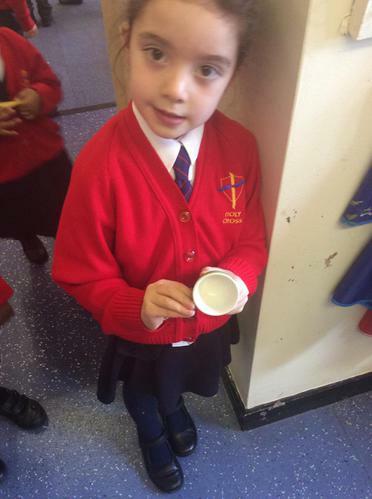 Finally the Priest blesses a white baptismal candle and gives it to the Parents to bring home with them. 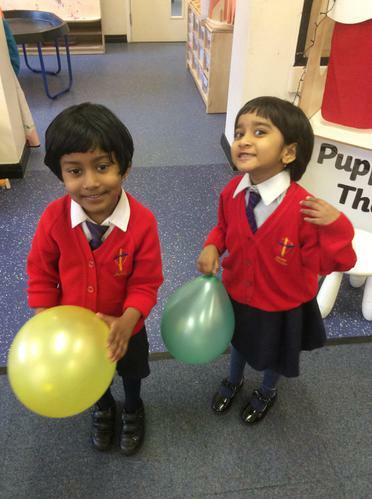 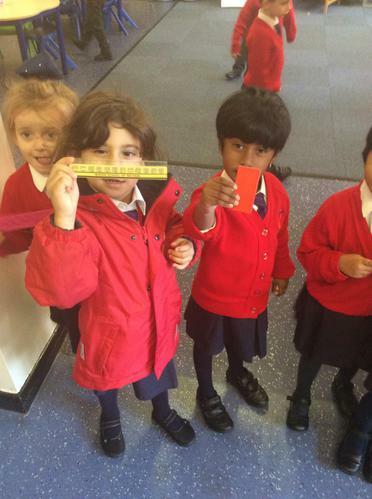 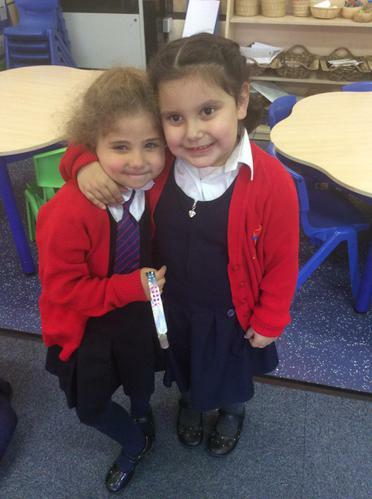 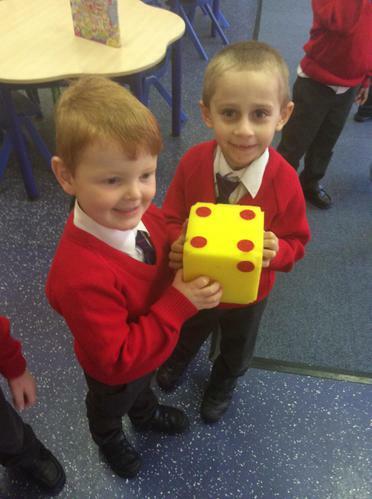 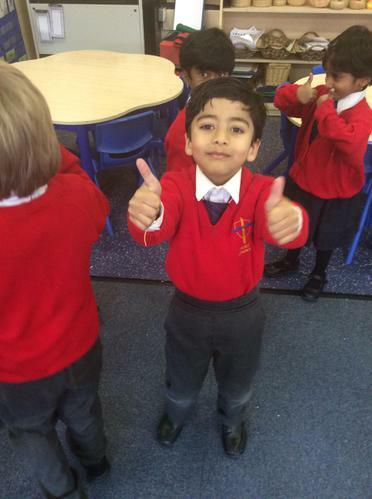 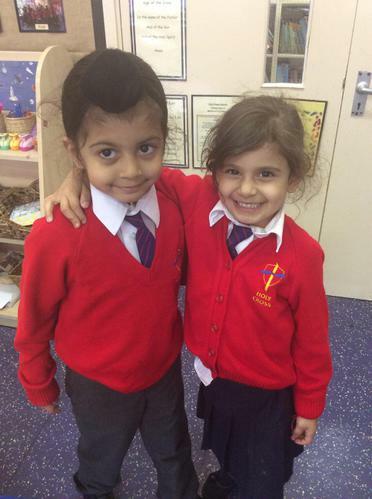 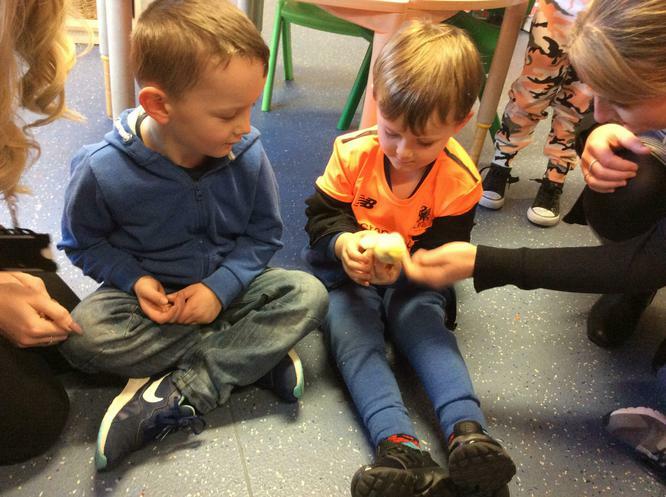 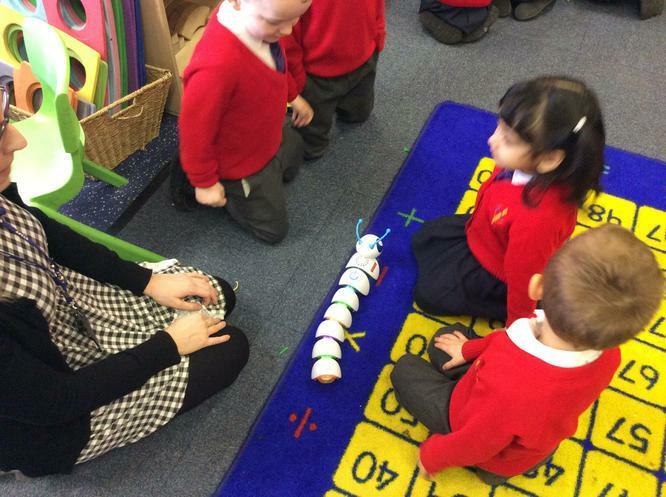 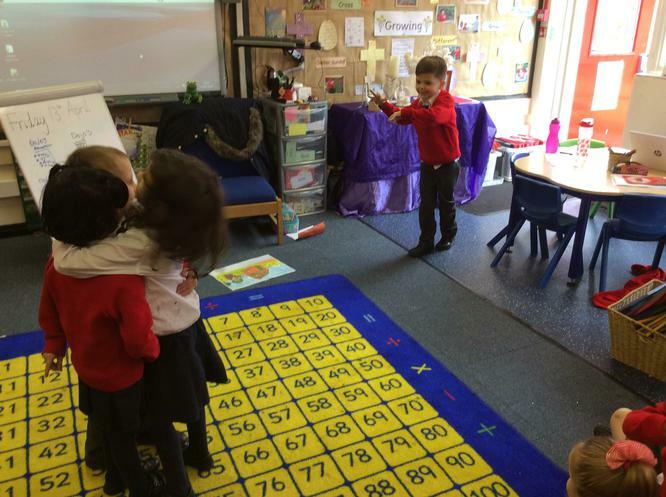 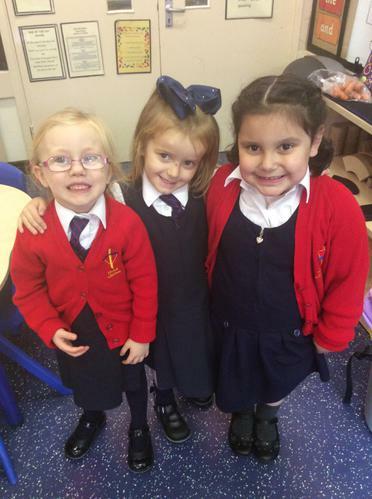 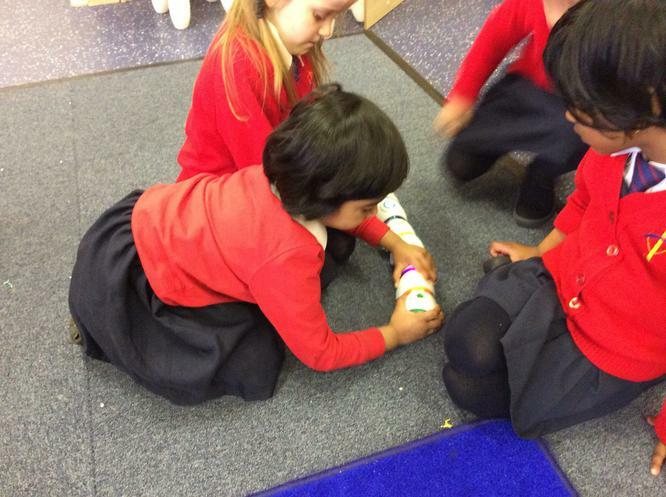 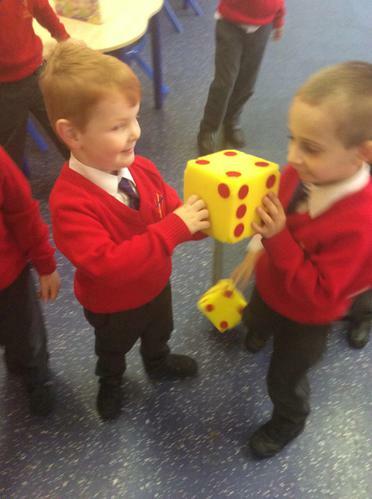 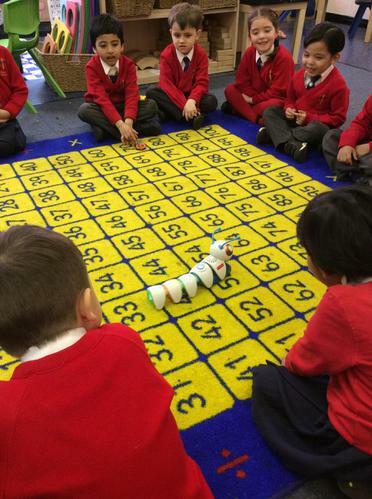 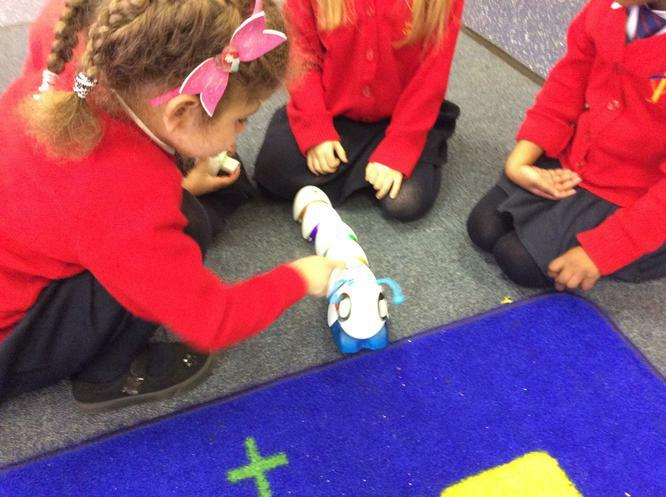 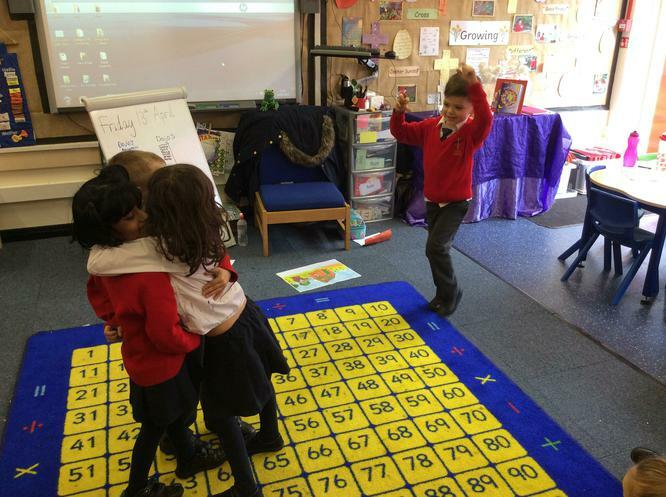 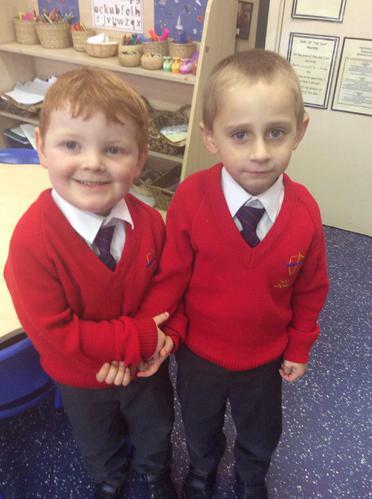 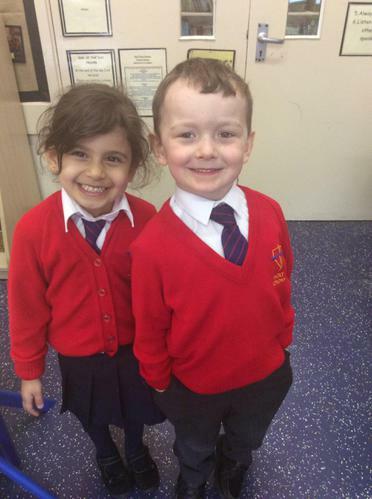 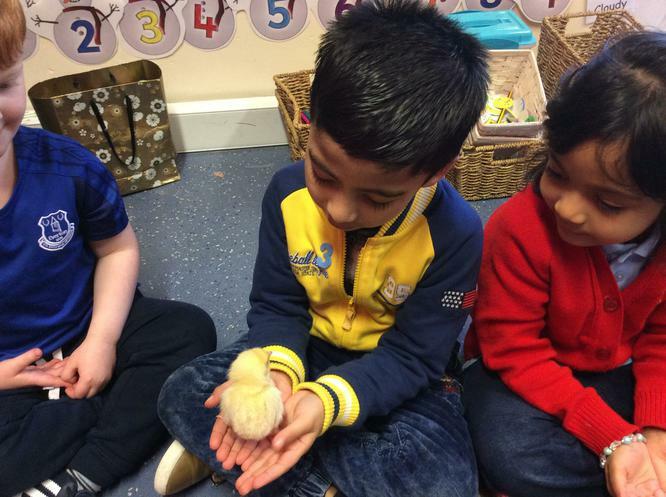 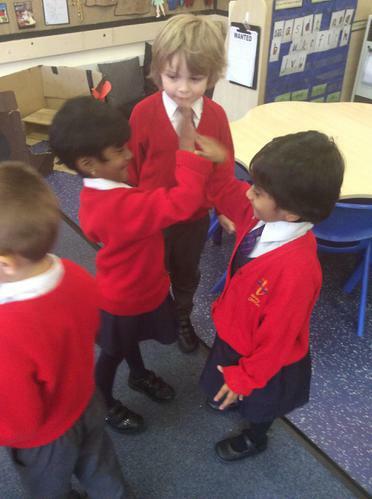 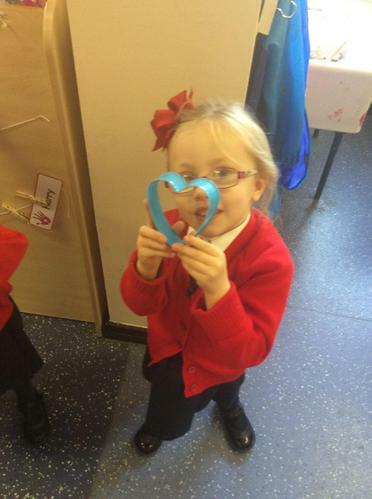 Reception have been talking about the importance of friendship. 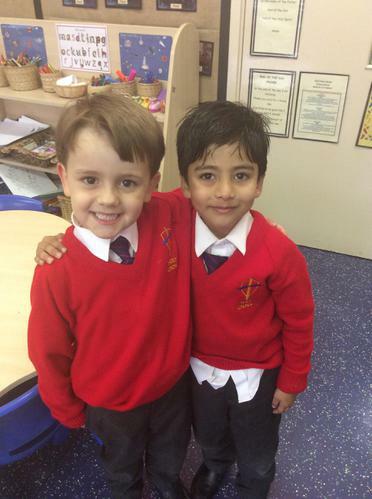 We have discussed what it means to be a good friend and thought of some examples from our own class. 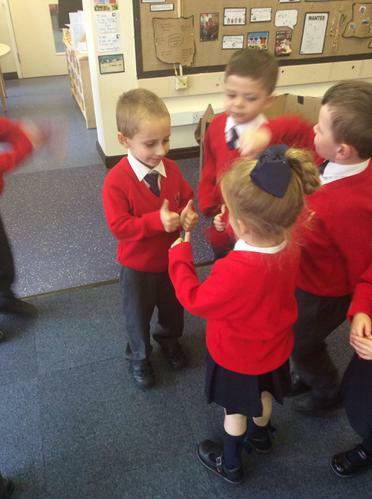 We talked about what a compliment is and made sure to compliment each child in class. 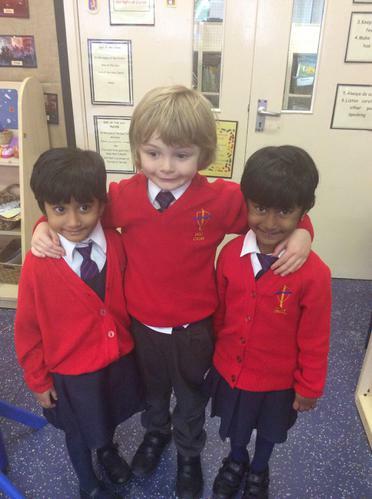 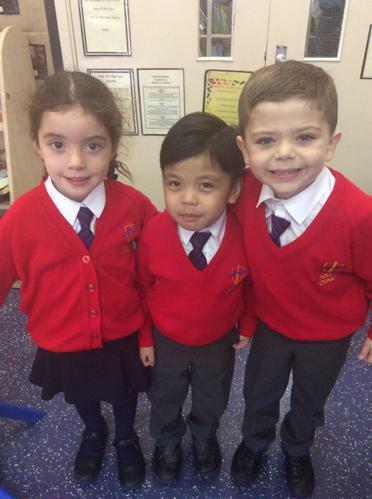 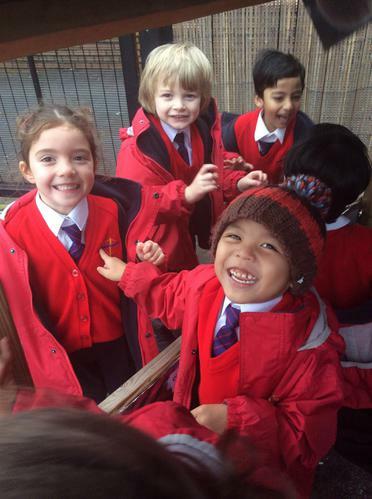 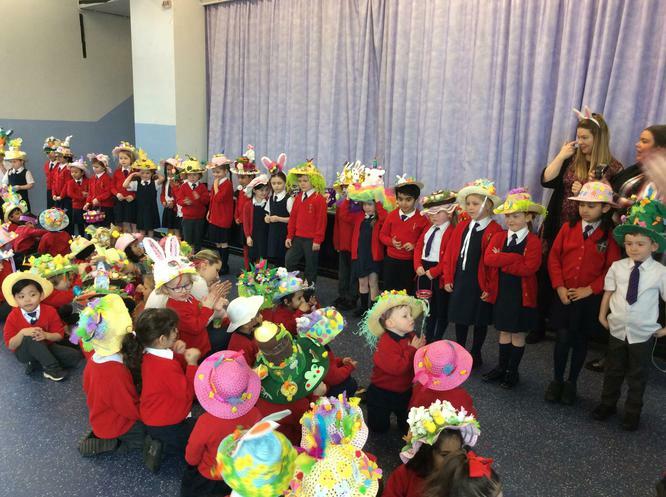 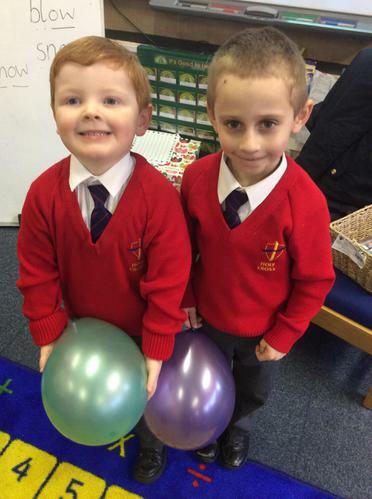 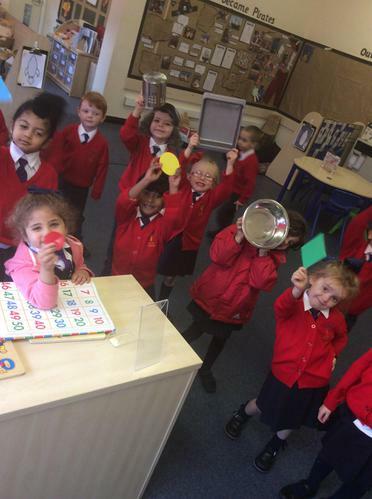 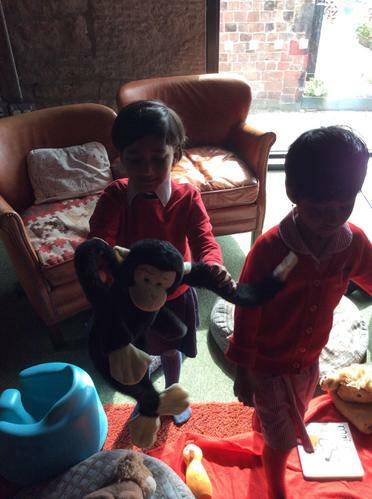 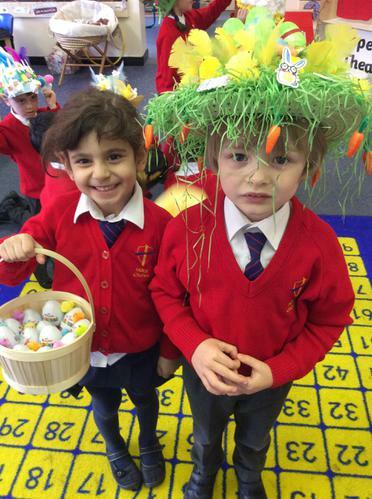 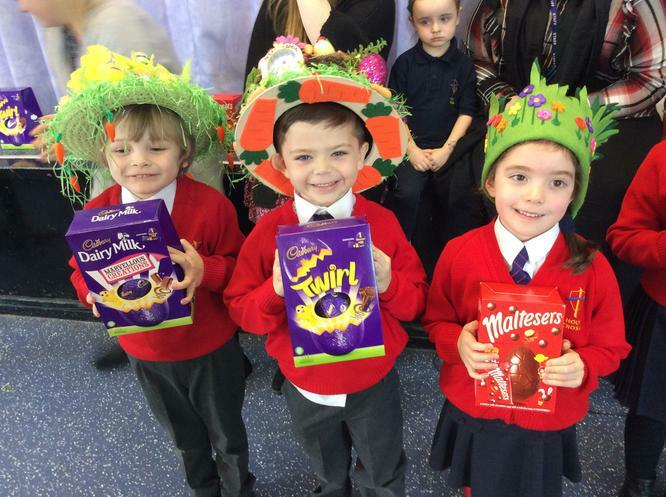 Reception have taken some special photographs with their friends. 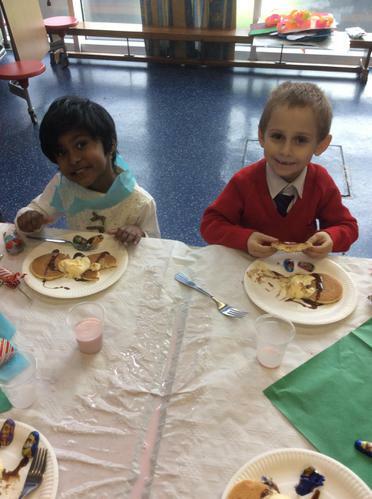 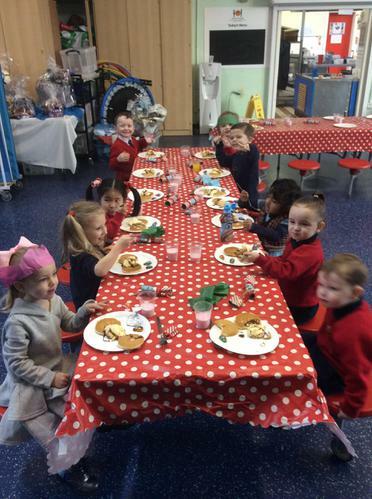 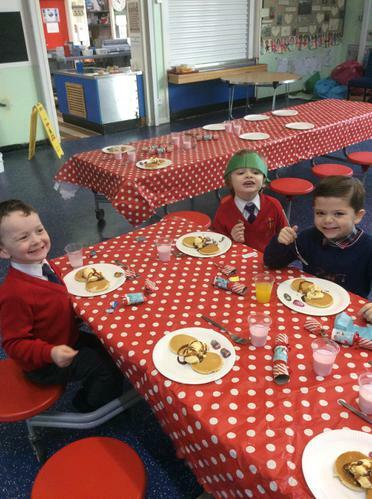 Reception loved their American style dinner! 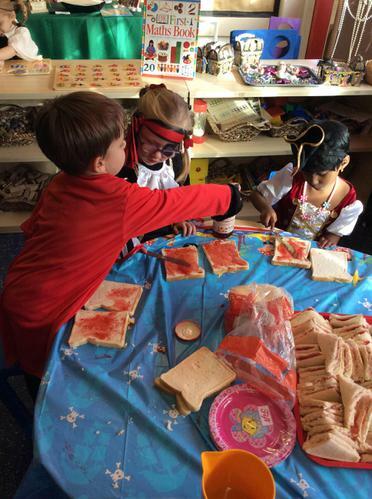 We worked hard at designing our own American flag table cloth and loved eating hot dogs, burgers, chips and home-made lemonade! 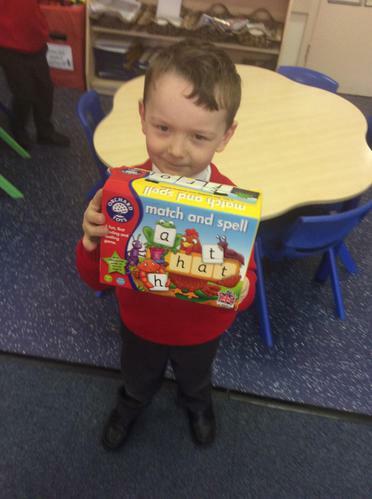 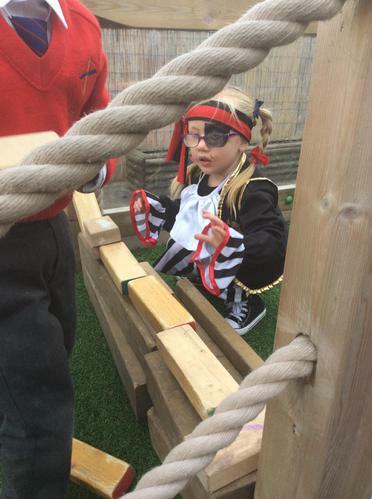 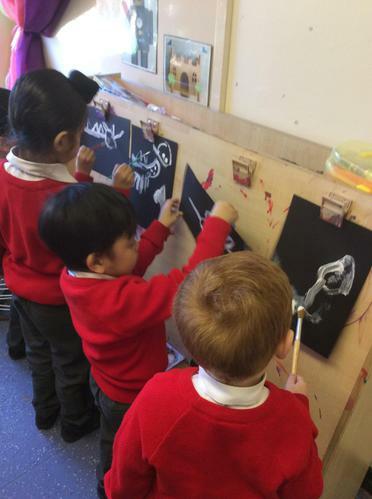 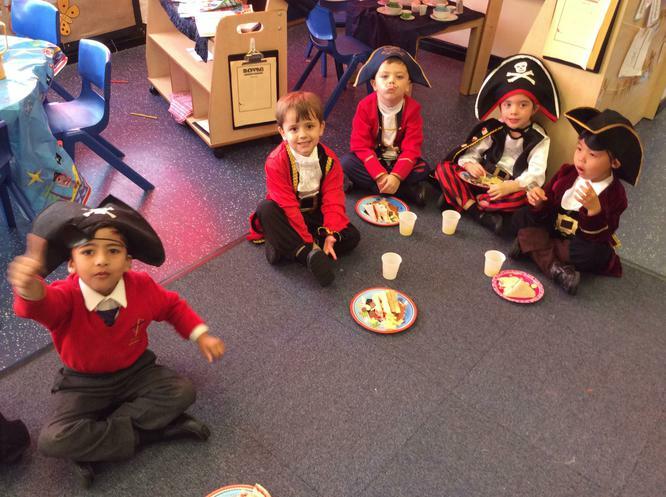 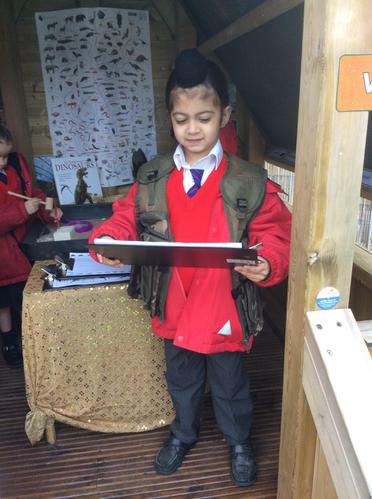 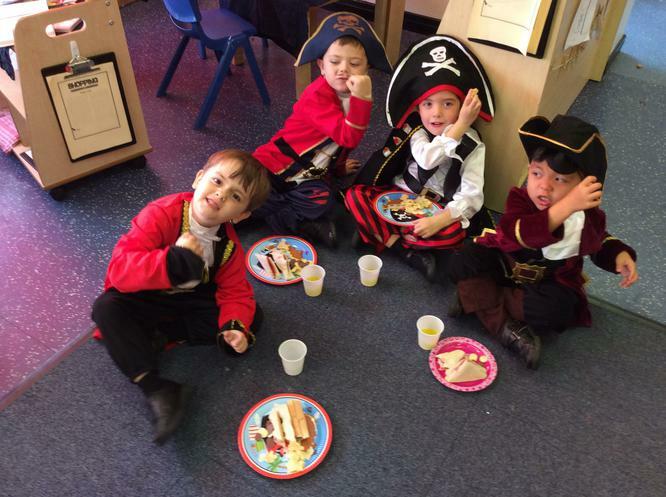 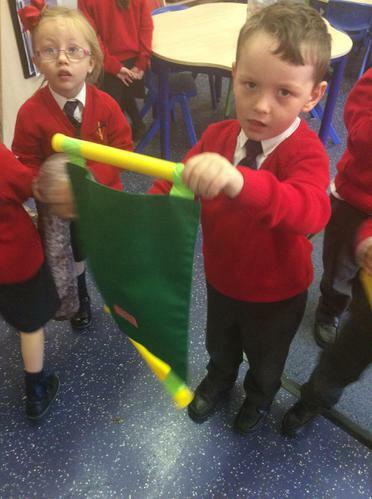 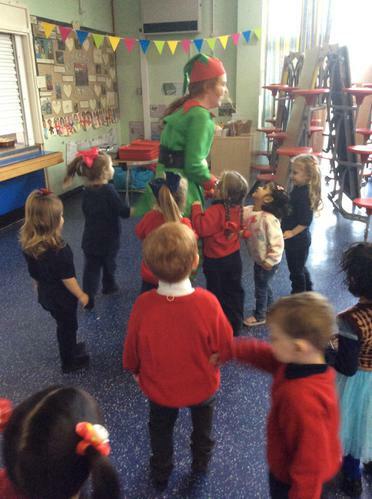 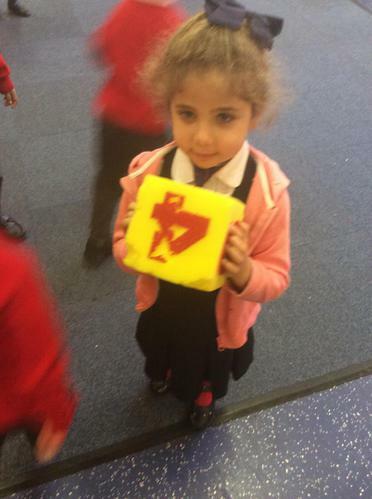 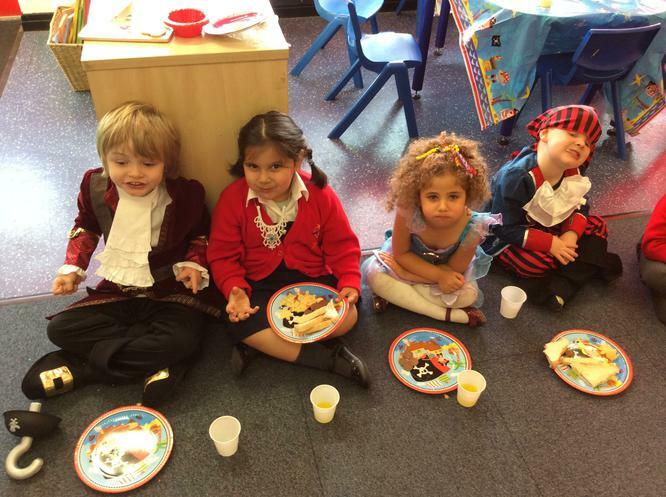 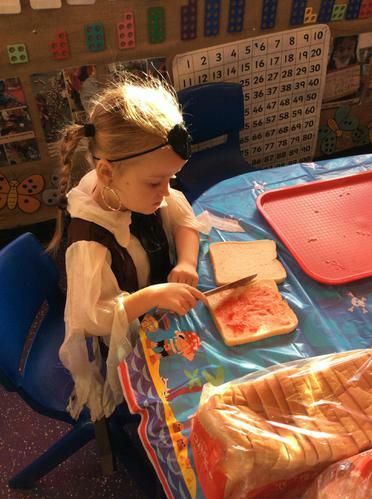 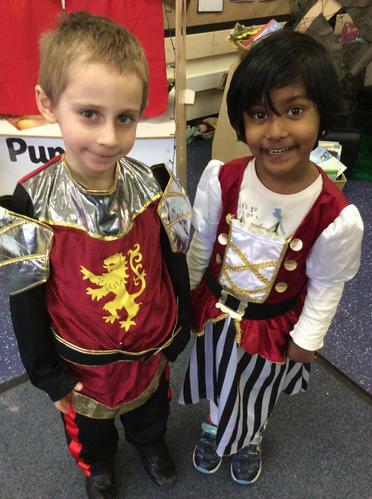 Reception have been learning all about Pirates! 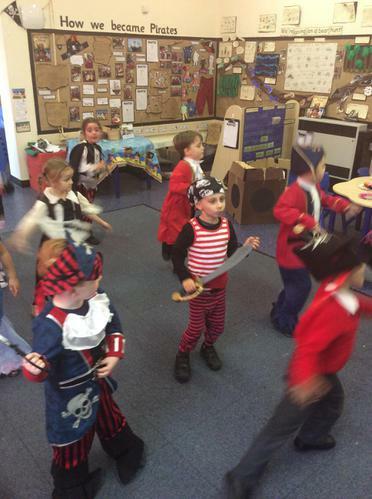 In class we have been reading 'How I became a pirate' by Melinda Long and David Shannon. 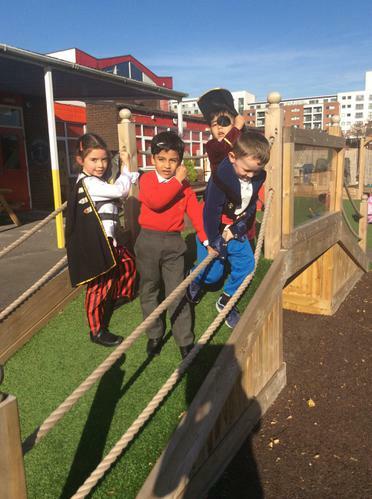 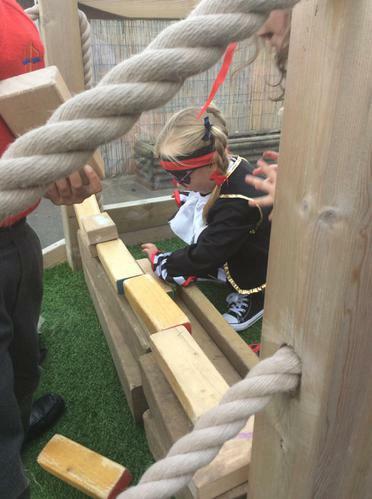 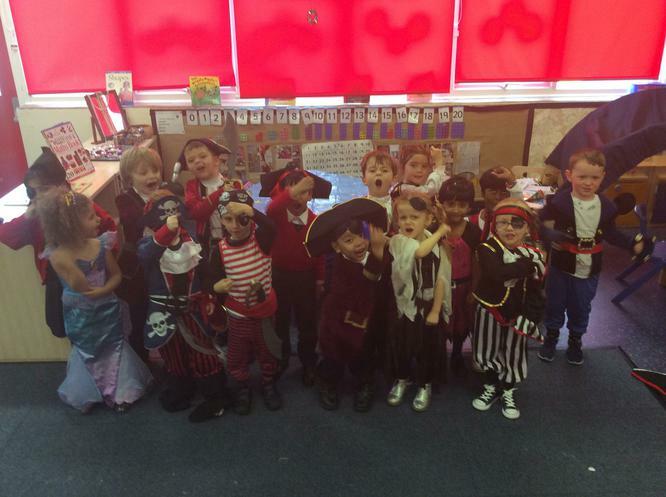 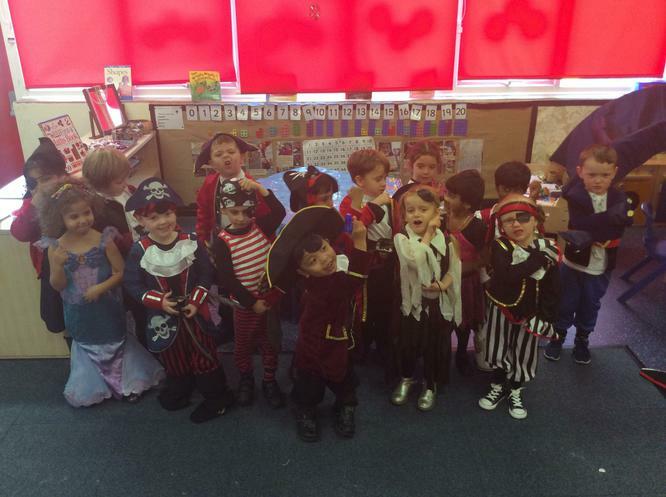 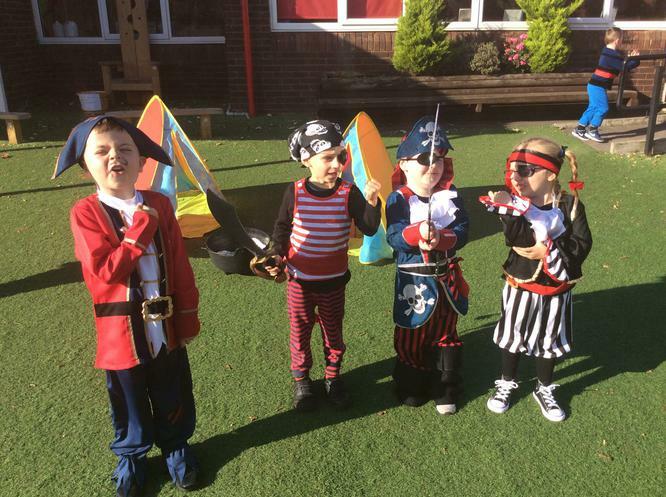 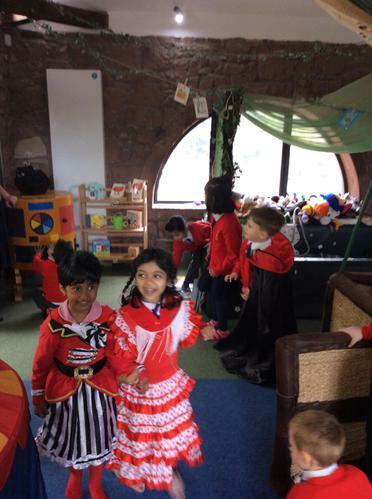 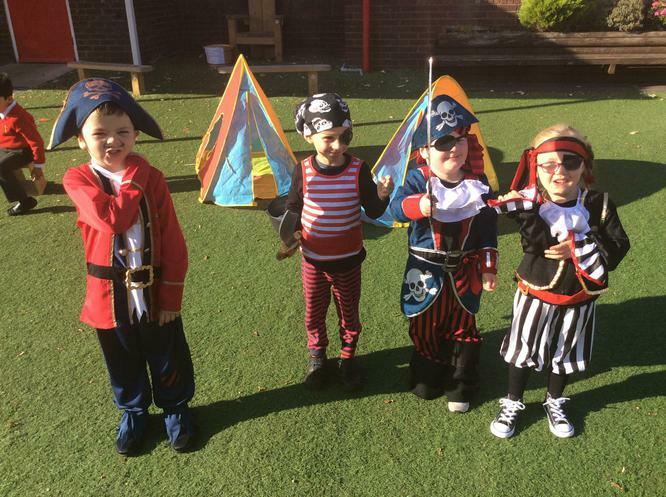 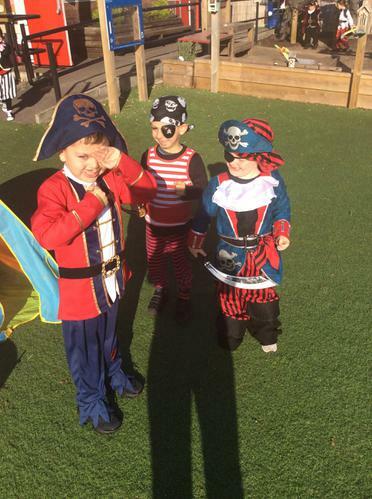 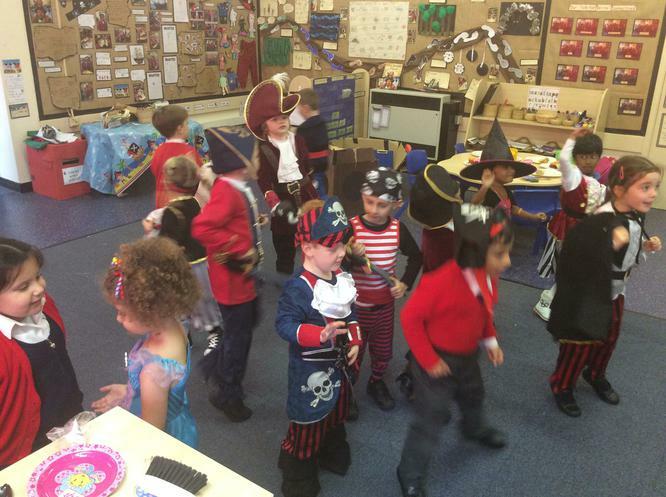 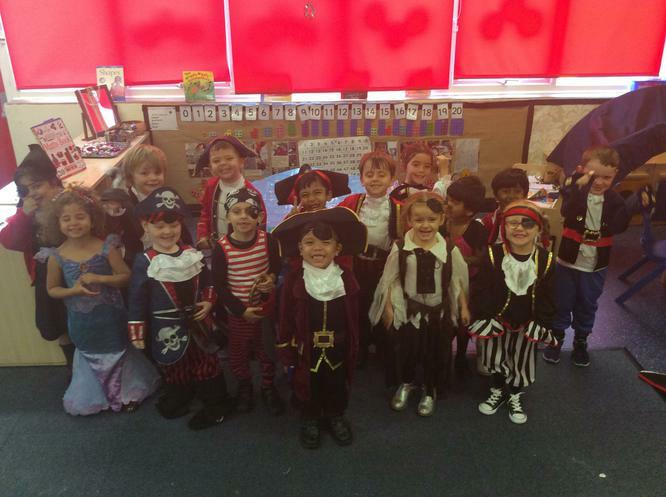 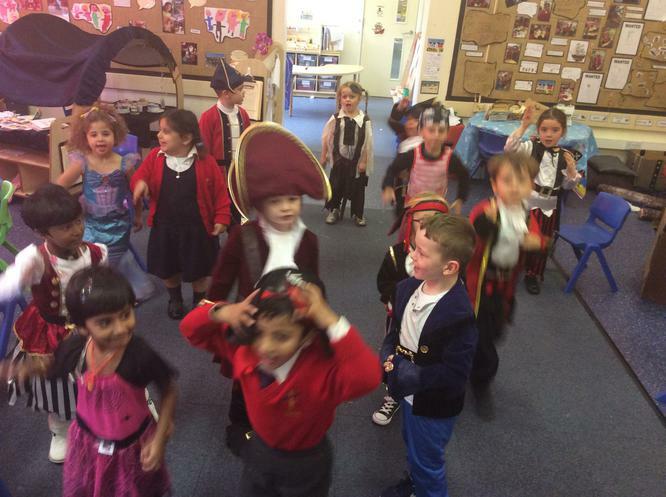 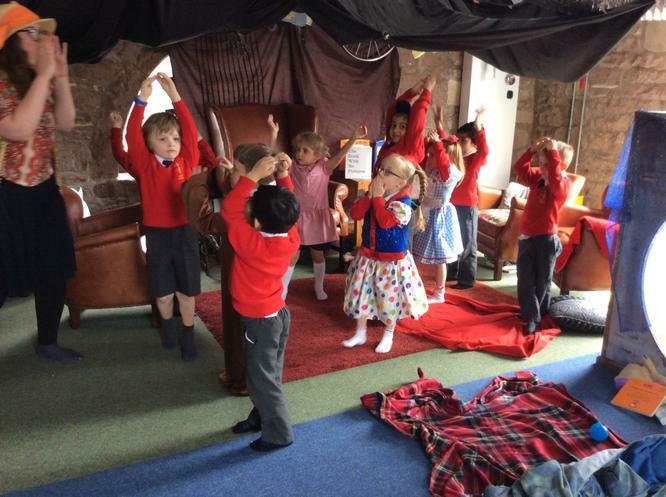 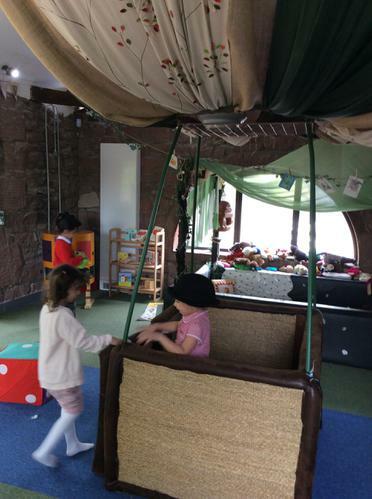 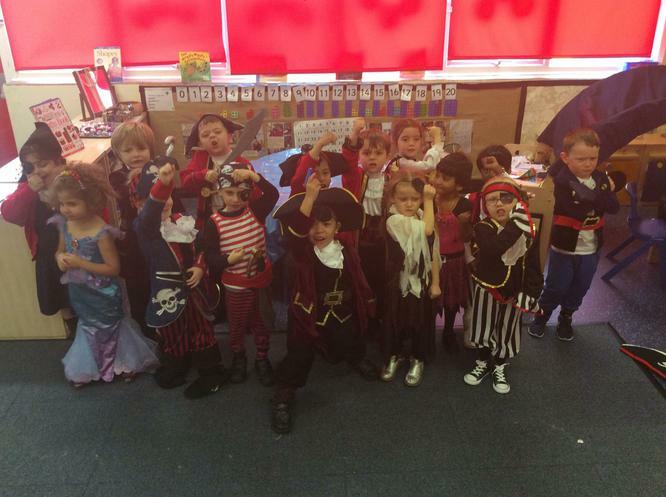 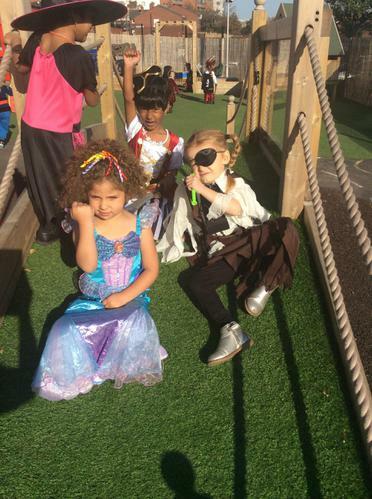 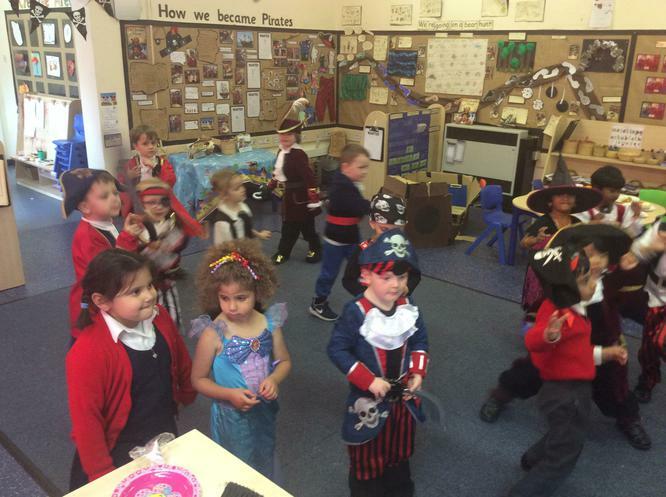 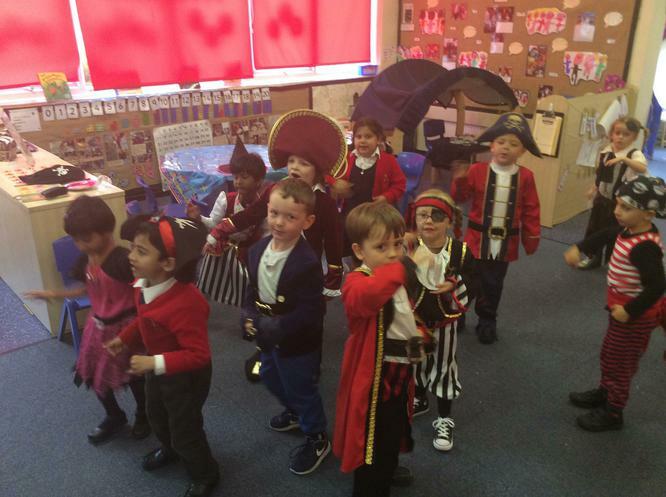 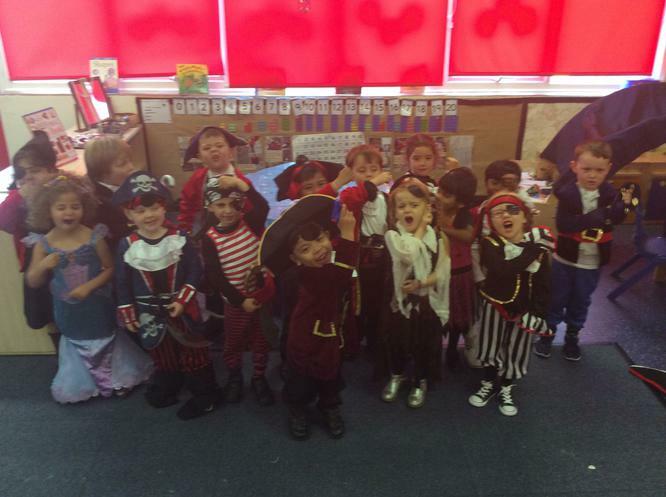 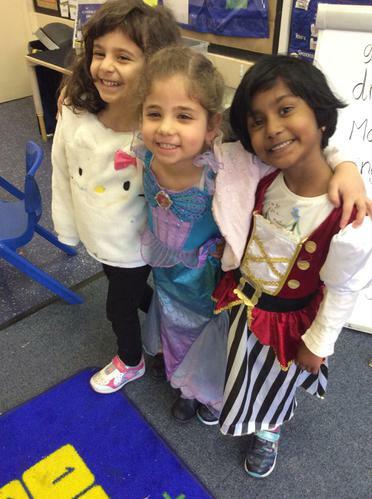 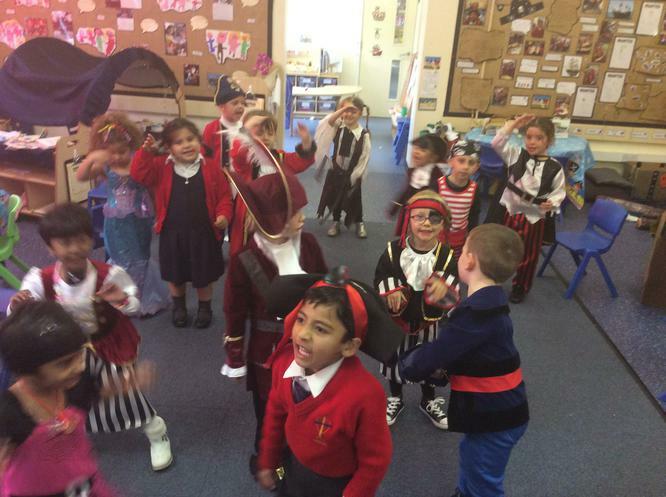 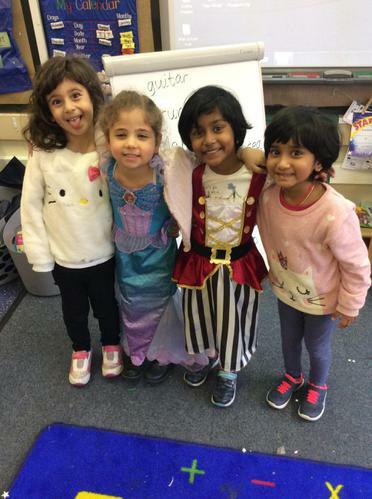 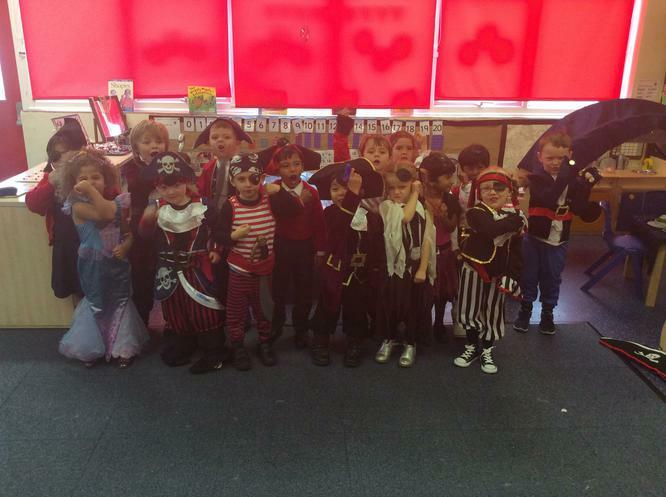 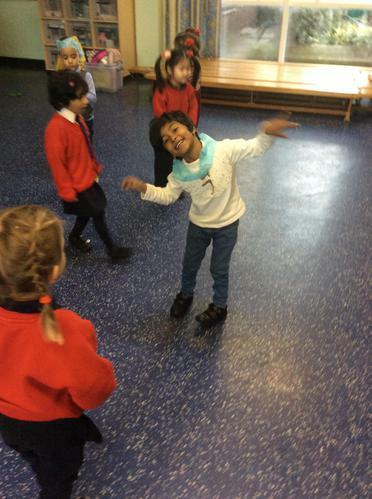 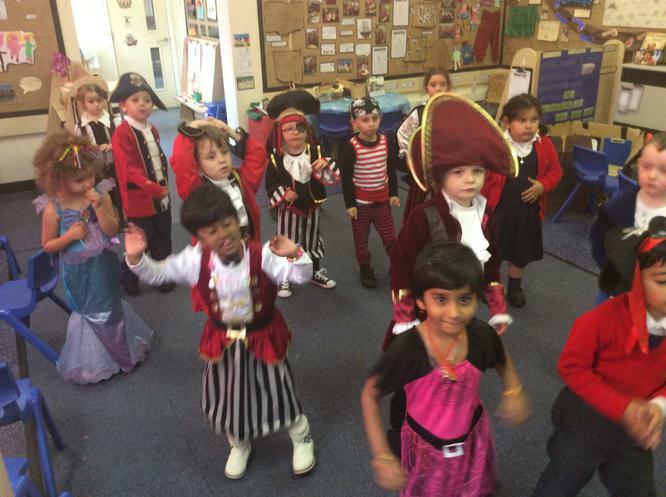 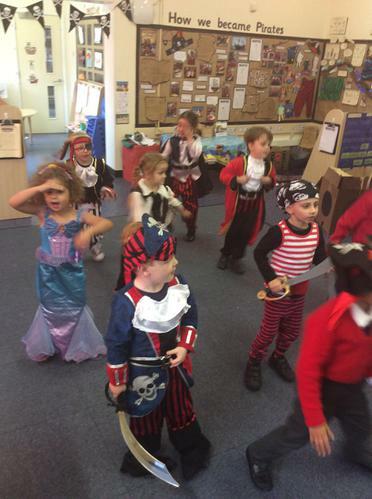 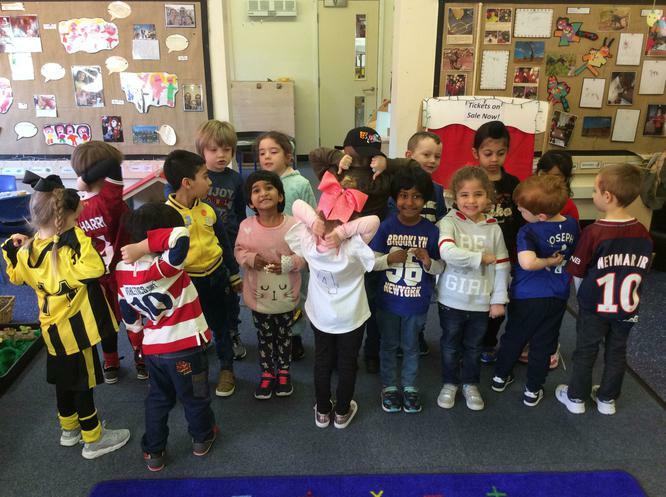 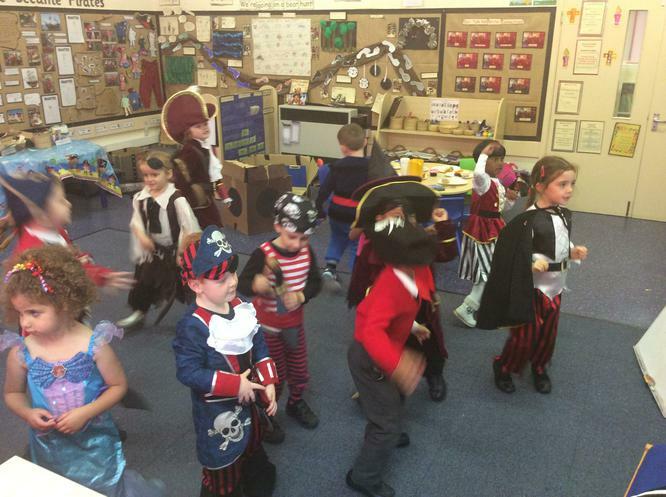 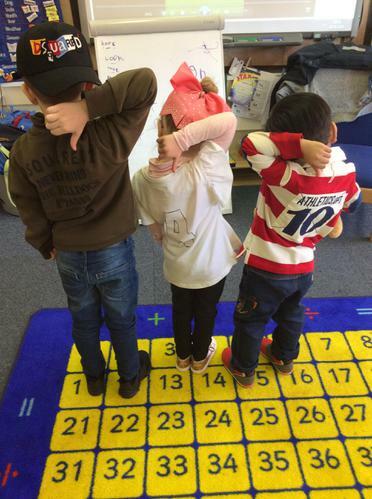 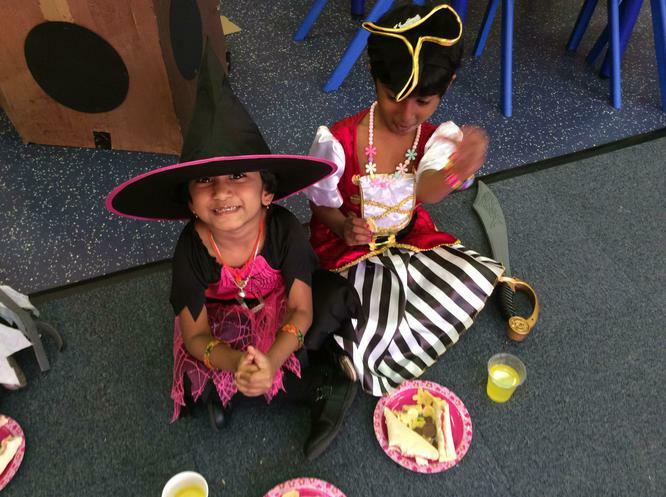 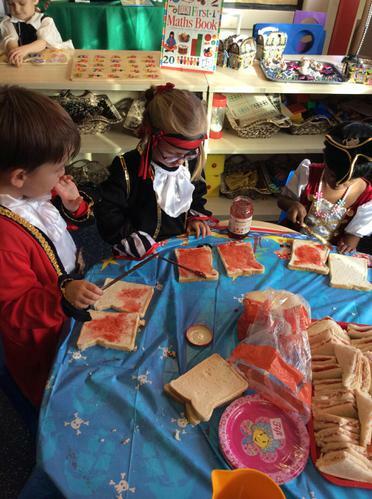 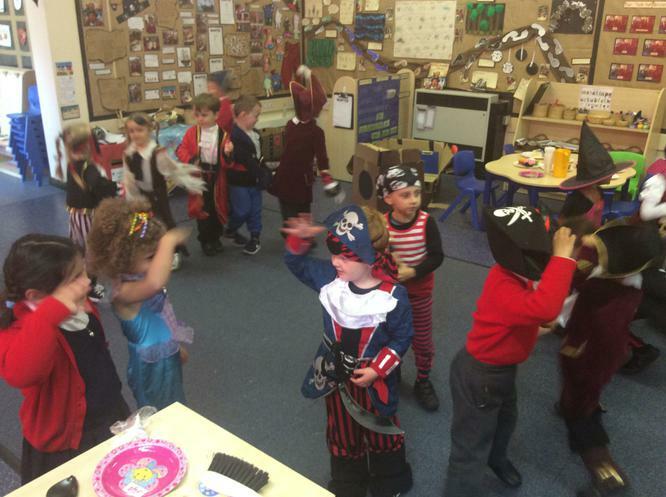 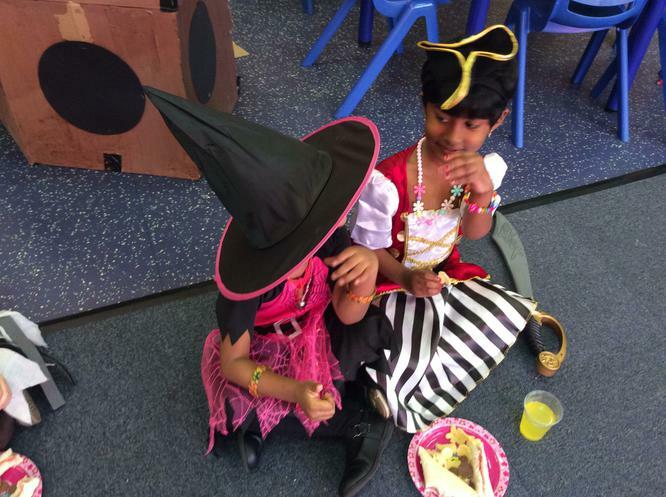 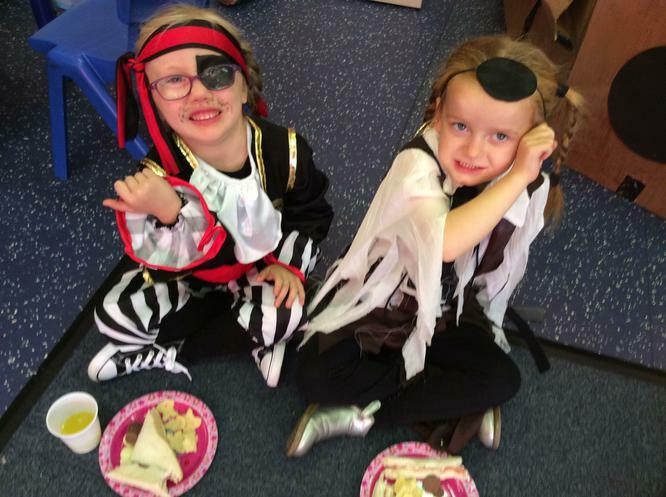 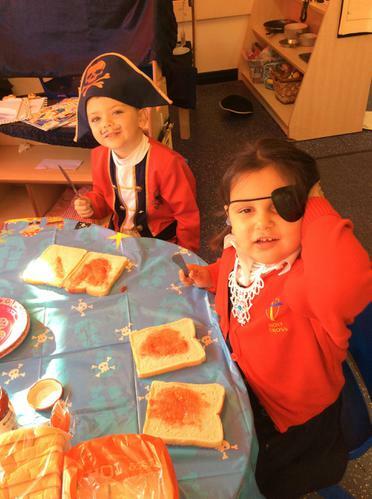 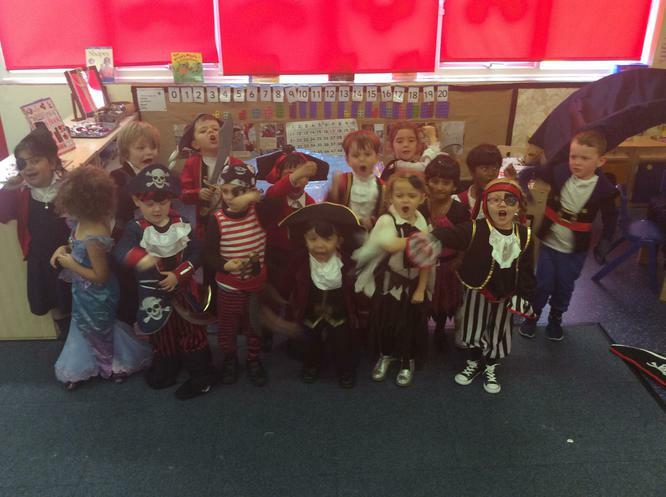 Reception decided they wanted to be pirates too! 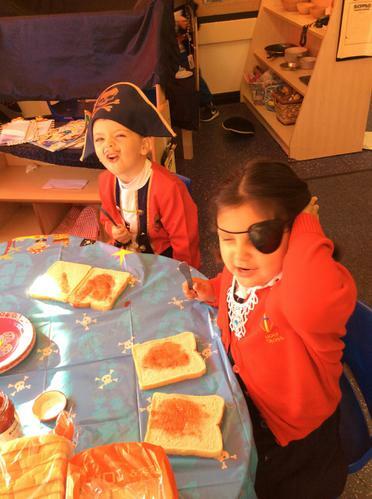 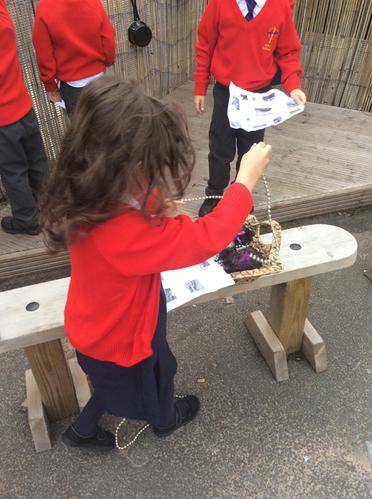 We have made pirate ships indoors and outdoors, eye patches, pirate hats, and hooks for our hands. 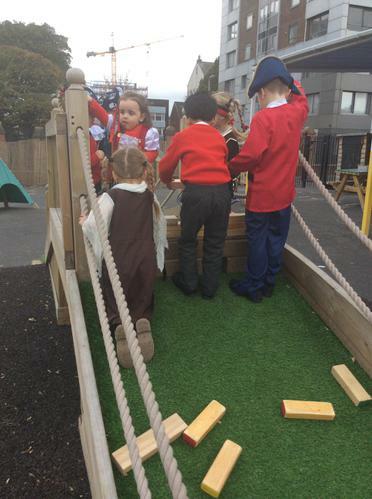 We have also made a cardboard pirate ship and love pretending we are shipwrecked! 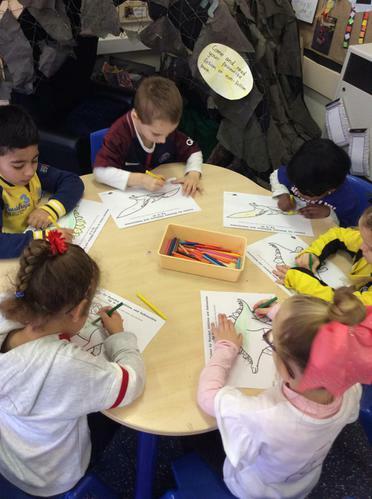 We write SOS messages in a bottle and hope someone will come rescue us. 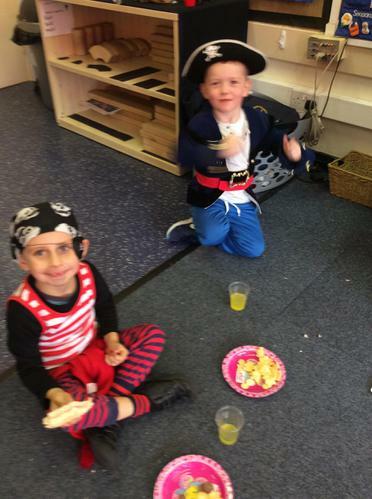 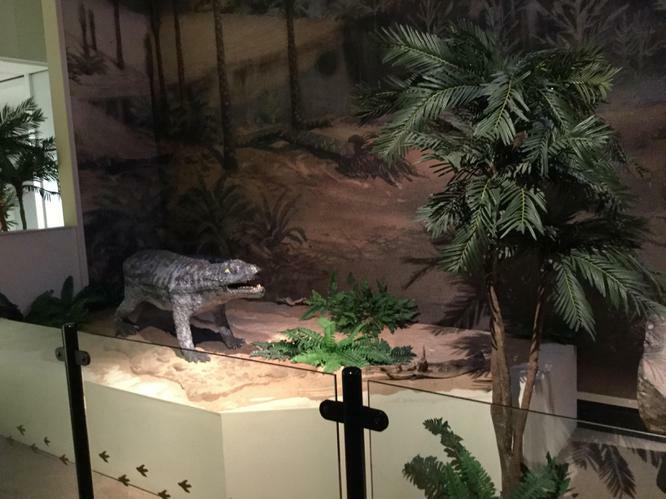 We have received letters and party invitations from Captain Braid Beard as well hidden treasure maps. 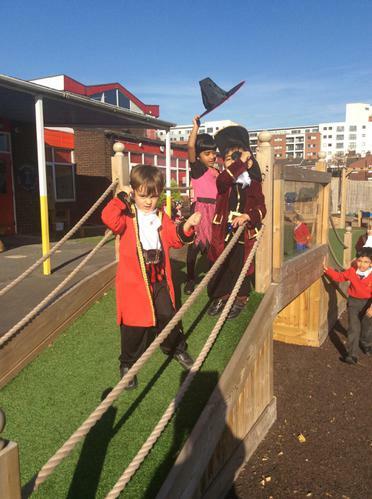 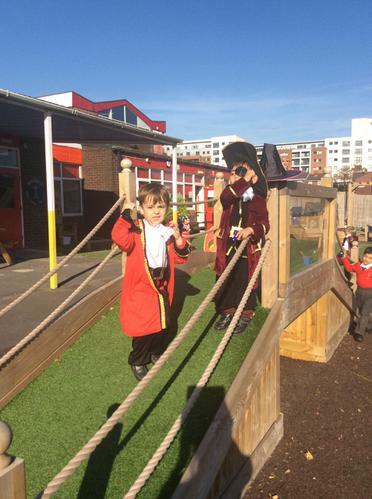 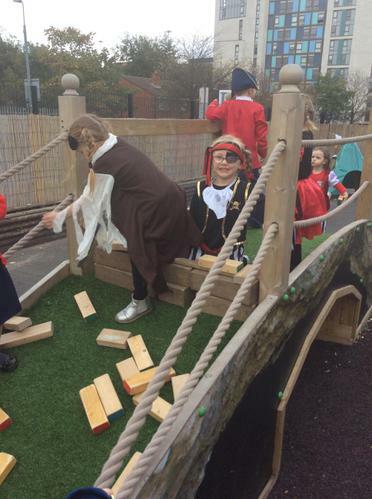 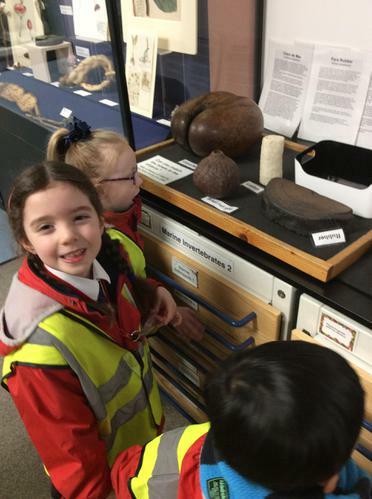 Learning about Pirates is so much fun! 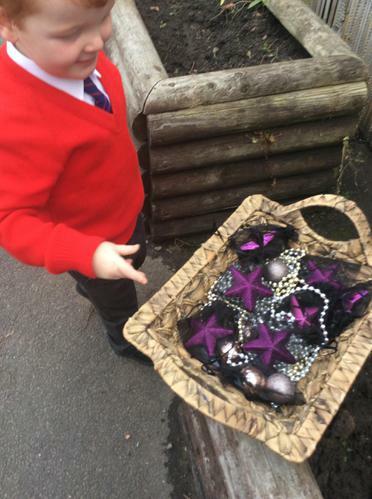 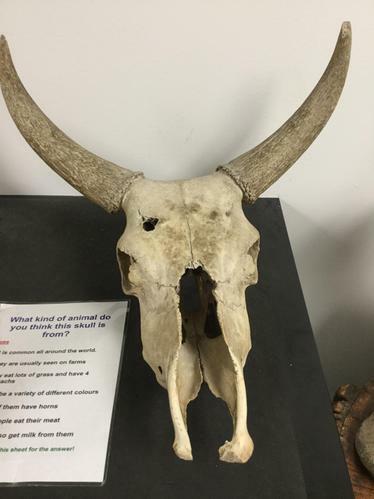 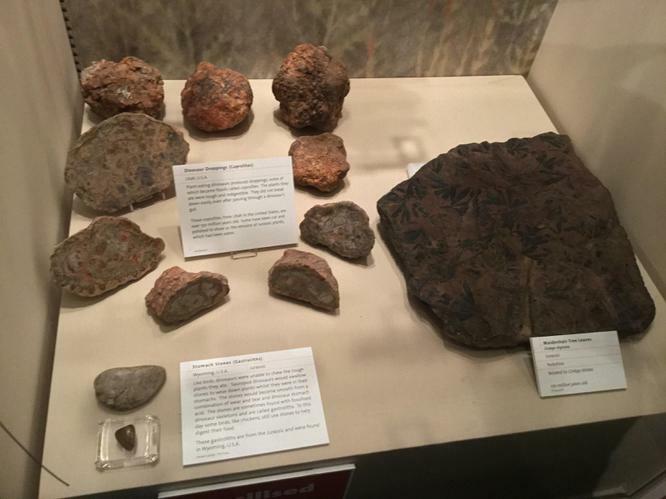 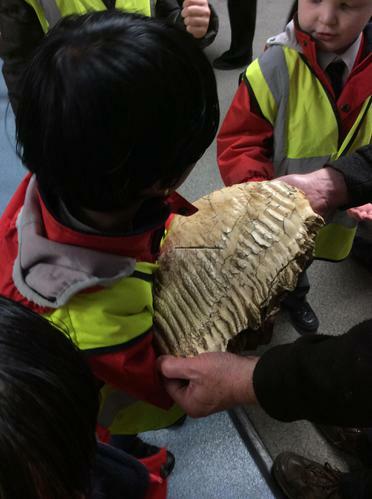 Arghhhh we found the treasure!